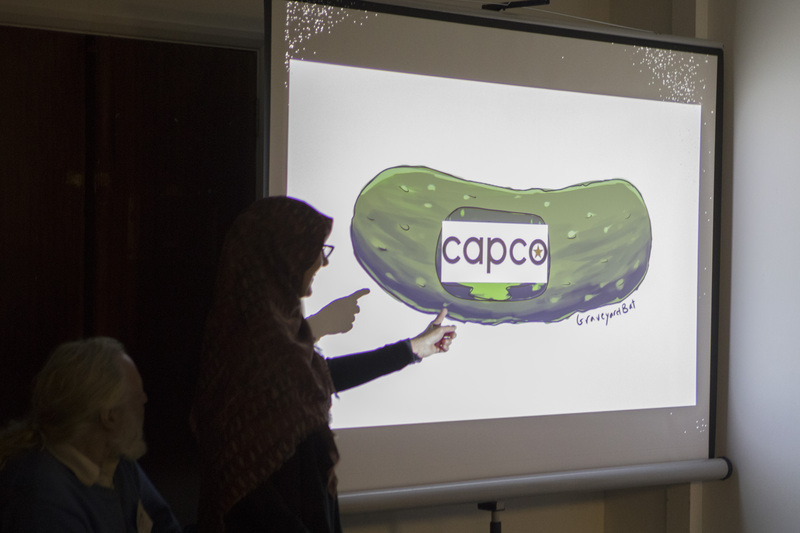 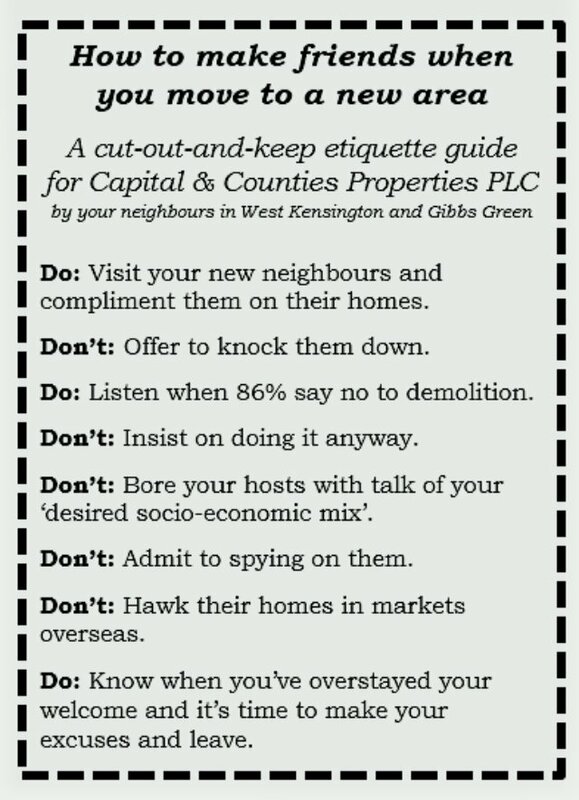 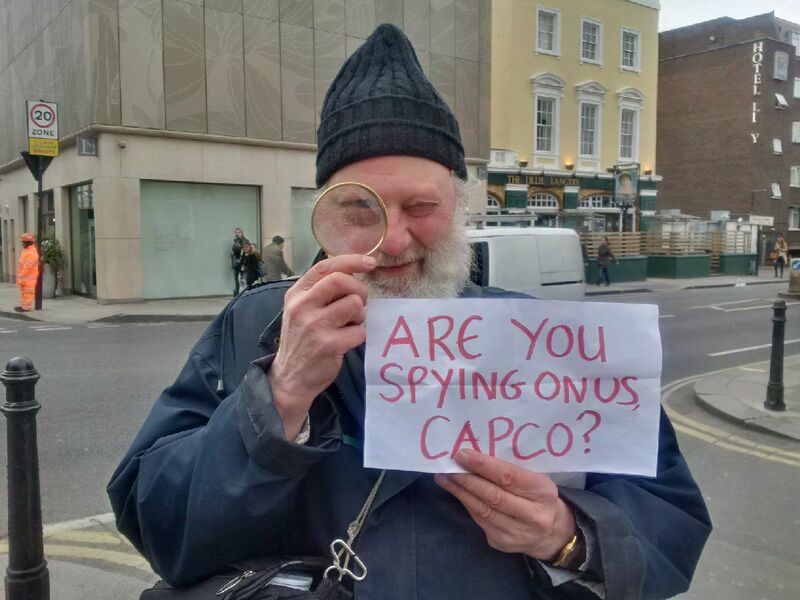 February 2018: “We’re just trying to be helpful”, said WKGGCH Chair Keith Drew about this handy etiquette guide for Capco. 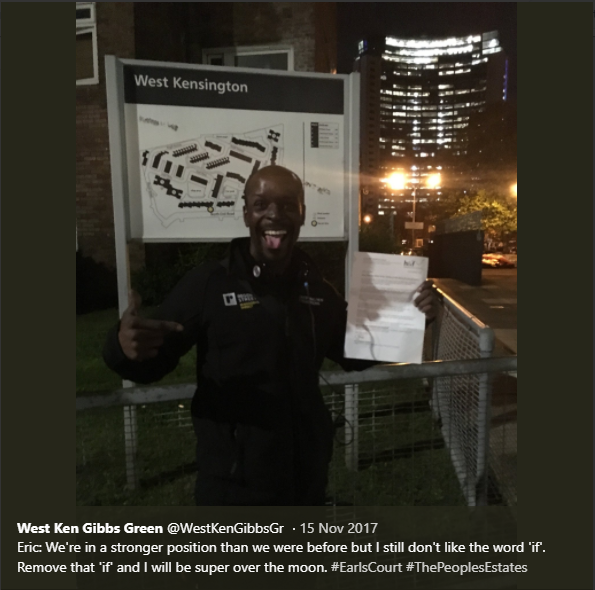 7 November 2017: WKGGCH Company Secretary said: “I’m very happy, but you’re not really safe unless you have resident control”. 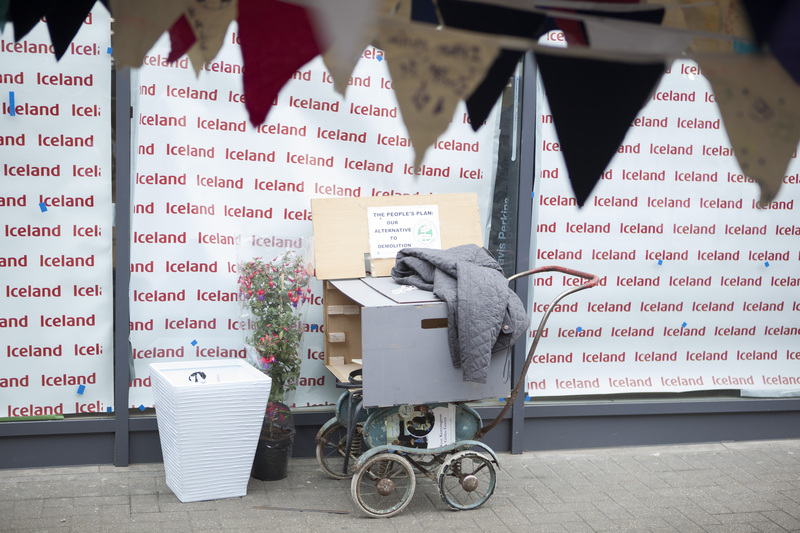 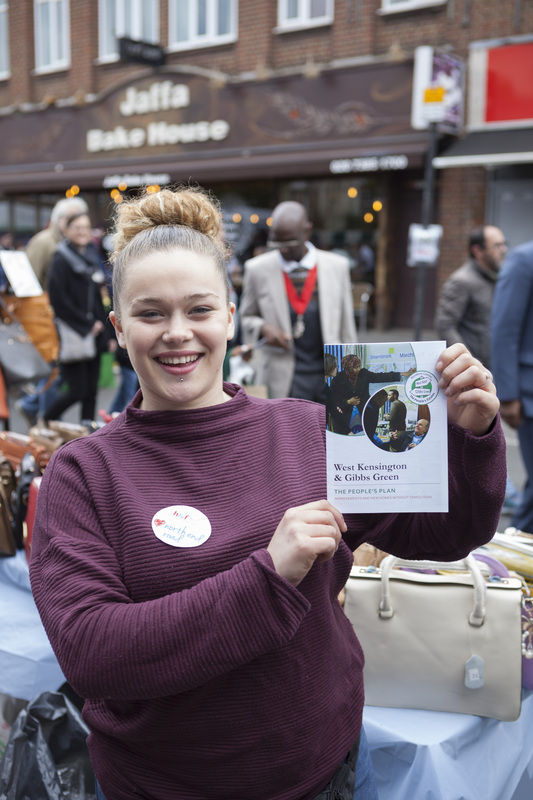 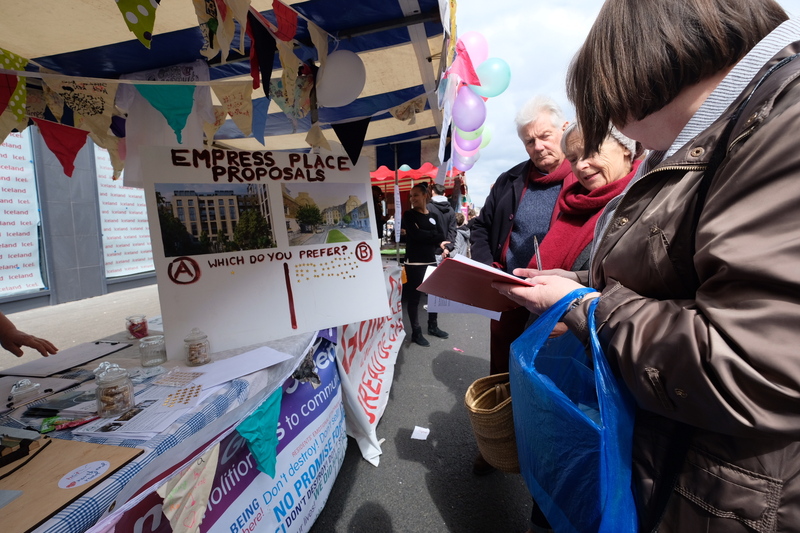 29 April 2017: After lugging the People’s Plan model to the North End Road Market Spring Fair, the People’s Pram enjoys a well-earned rest! 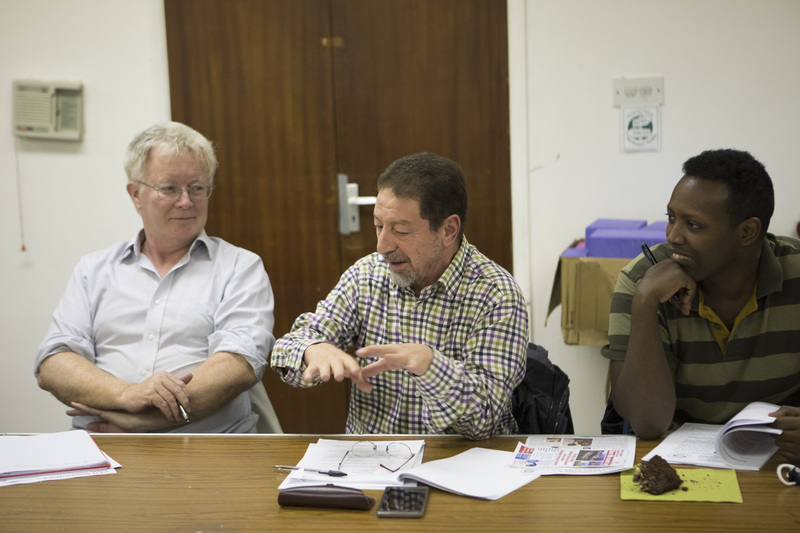 4 October 2016: AGM. 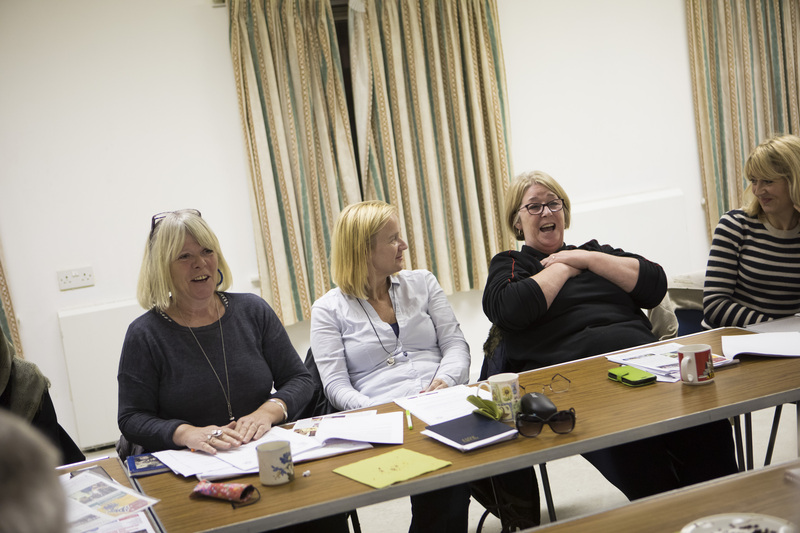 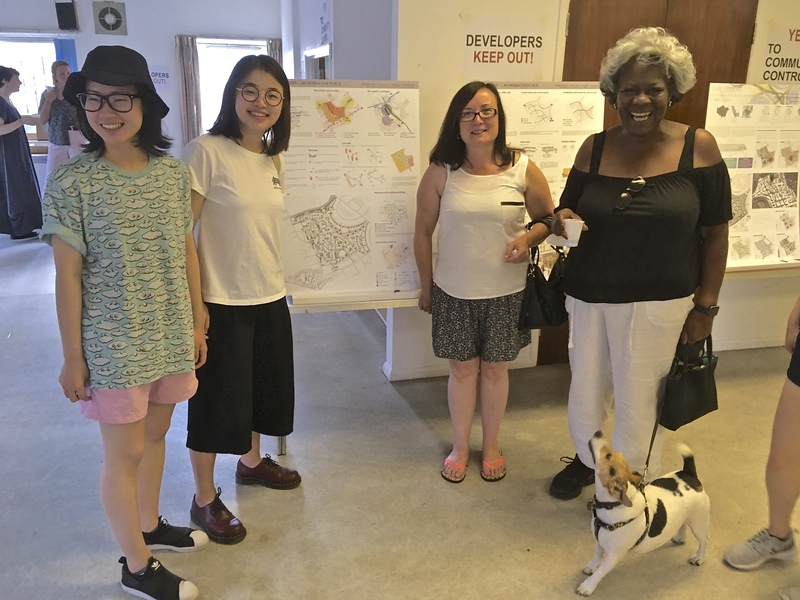 Resident Julia Lawlor (right) shares her experiences of living on the estates and her hopes for the future with her neighbours. 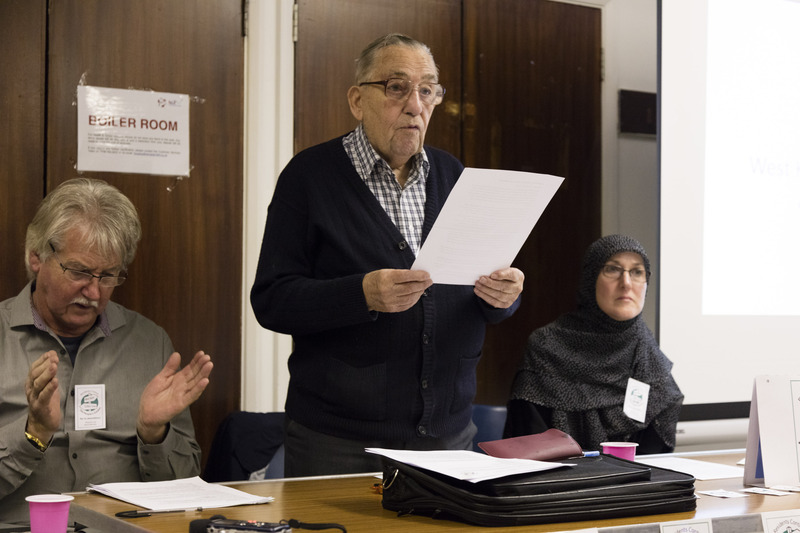 4 October 2016: AGM. 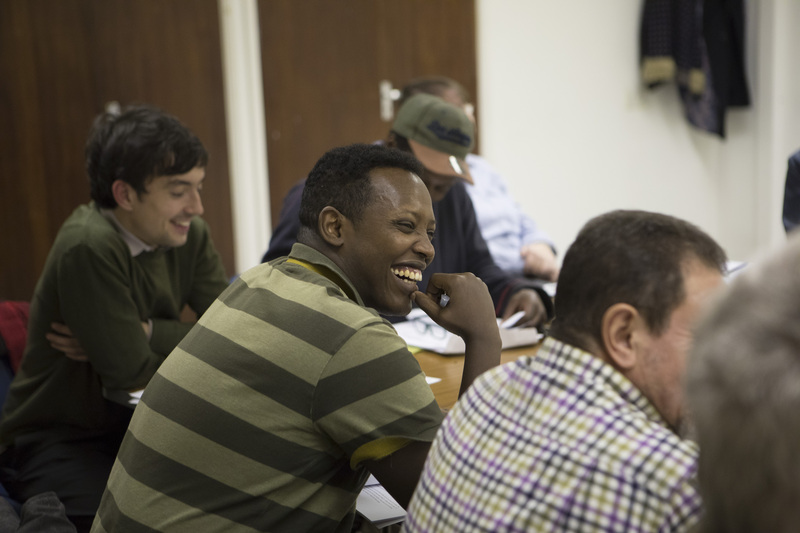 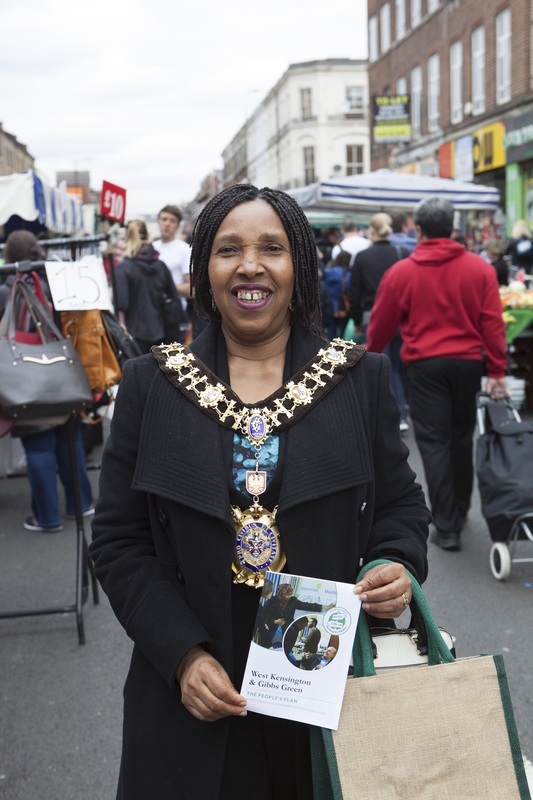 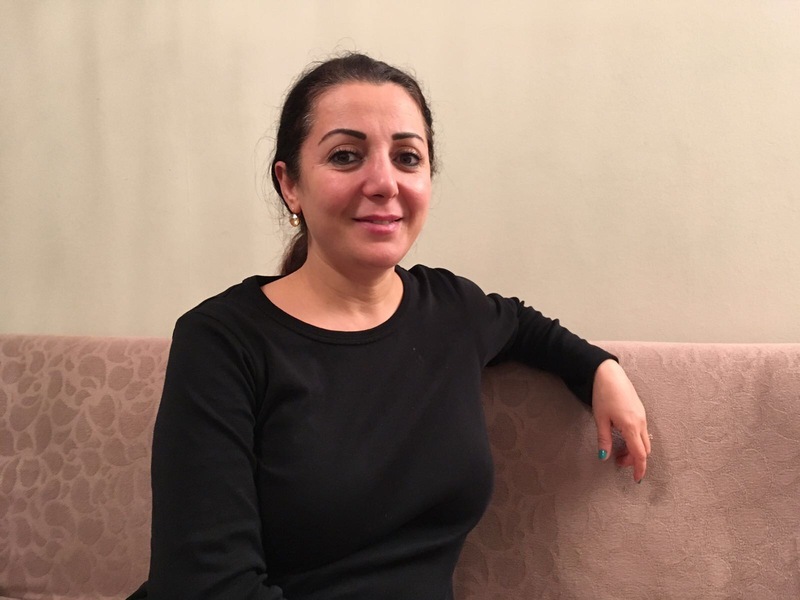 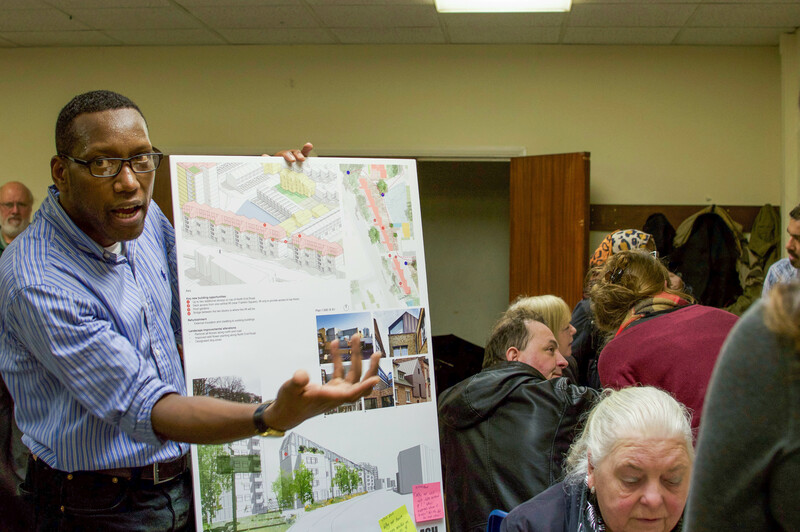 Board Member Dioscore Mutsinzi says this about the People’s Plan: “Being part of it is amazing – it’s a proposal initiated and developed by the community. 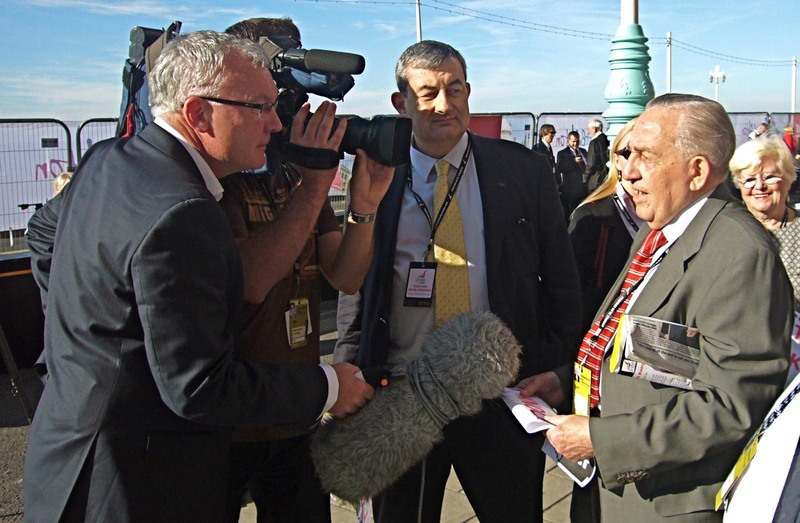 We went through it again and again to make it as good as possible”. 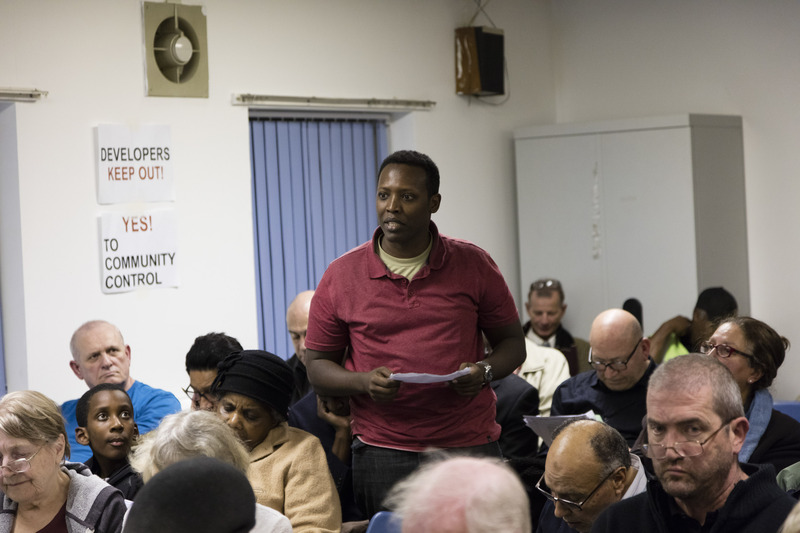 4 October 2016: AGM. 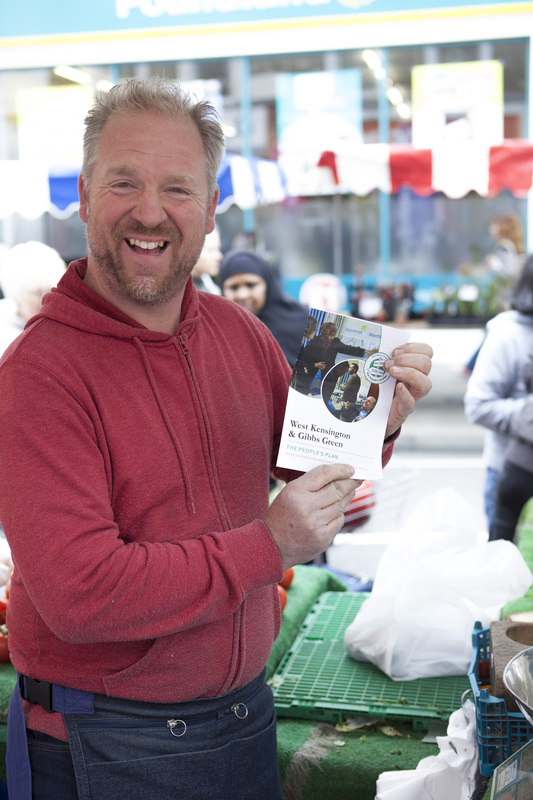 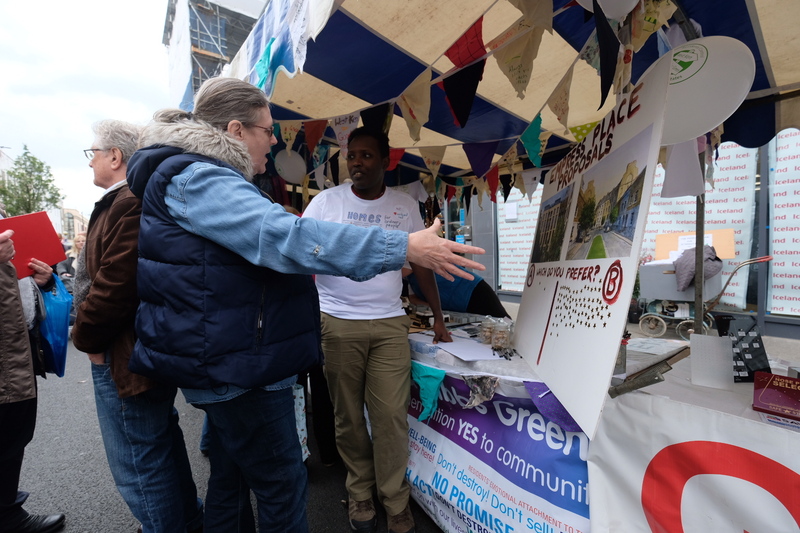 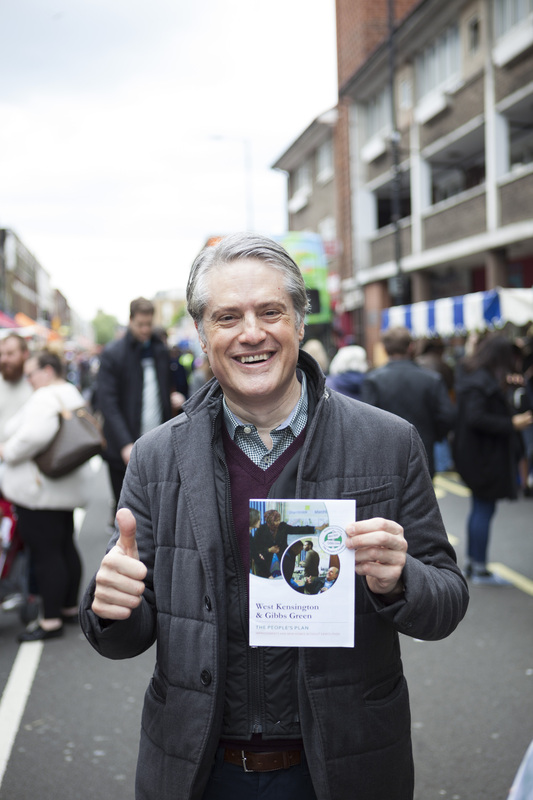 Clive Robotham says this about the People’s Plan: “I think it’s a good idea – a lot of people have been here a long time, I’ve been here coming up to ten years, in the area since 1994. 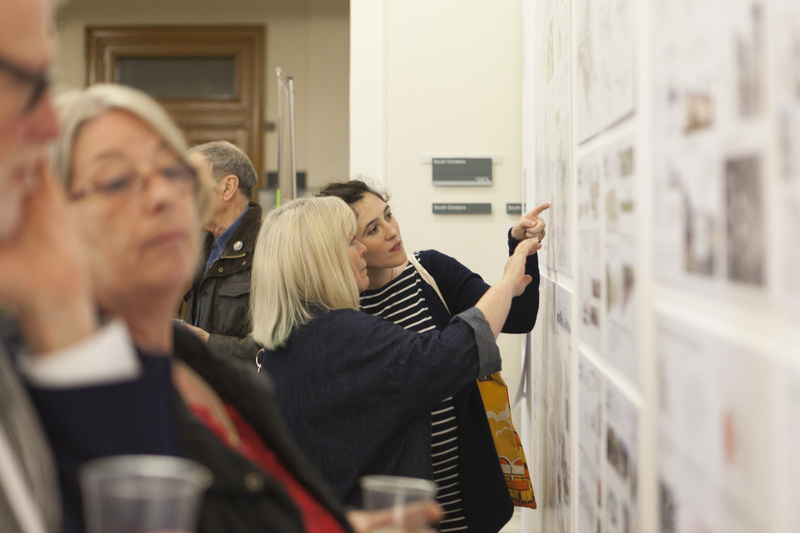 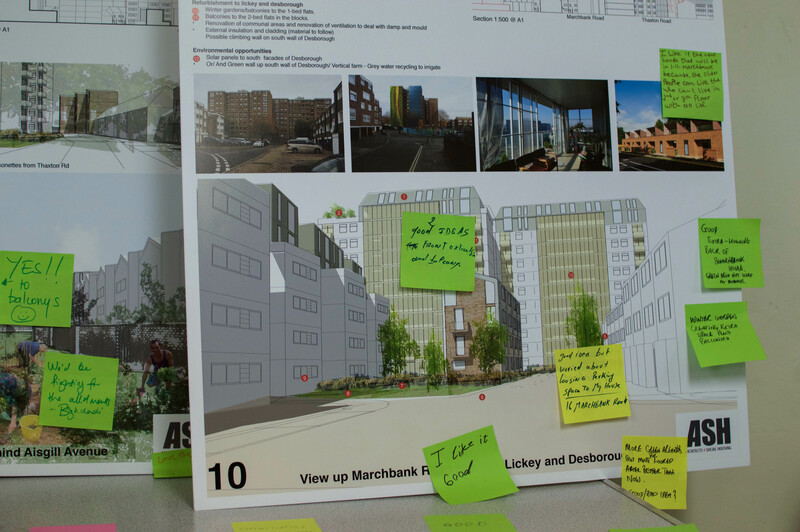 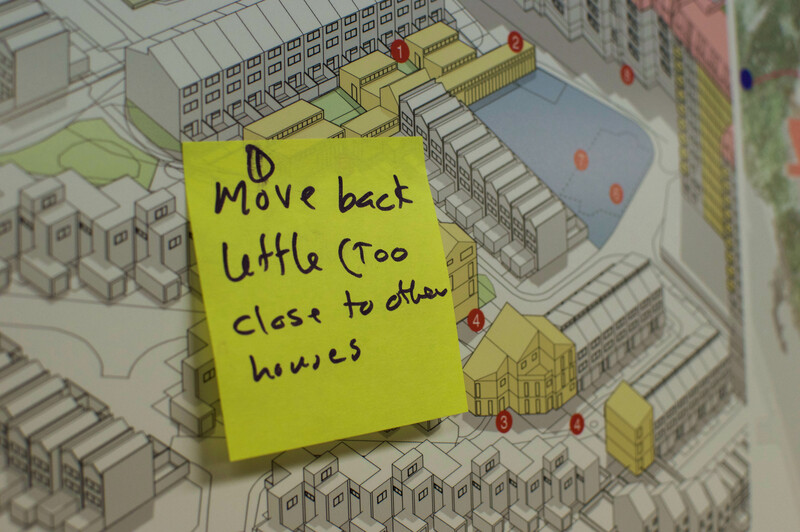 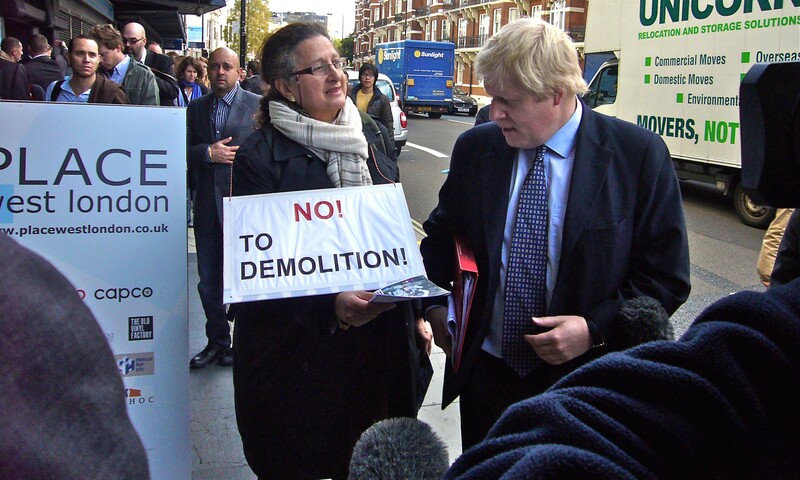 There’s no need for demolition to build new homes – the plan shows that. 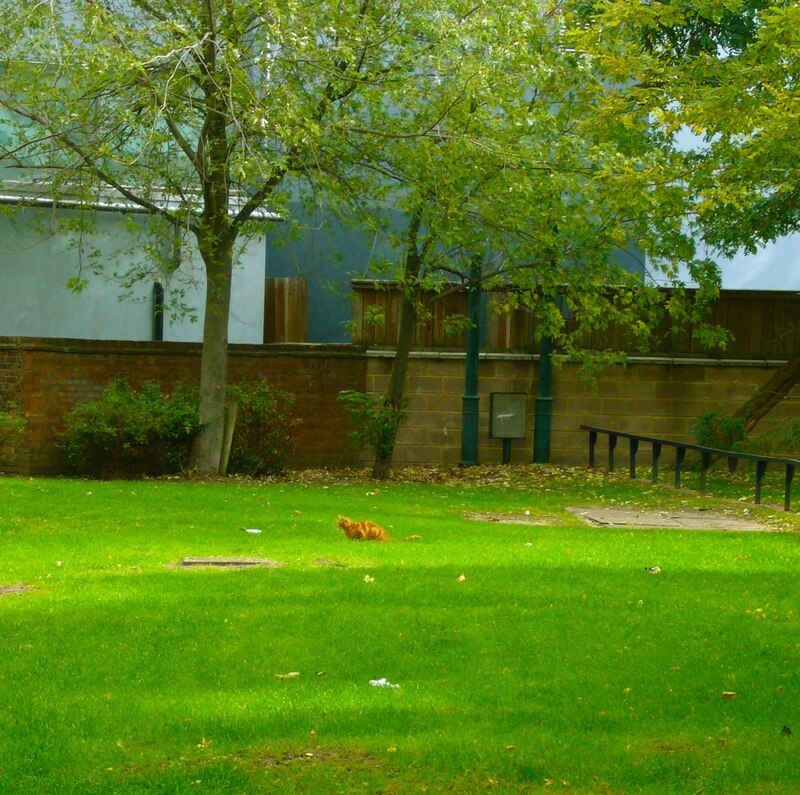 It’s a nice area, I feel safe”. 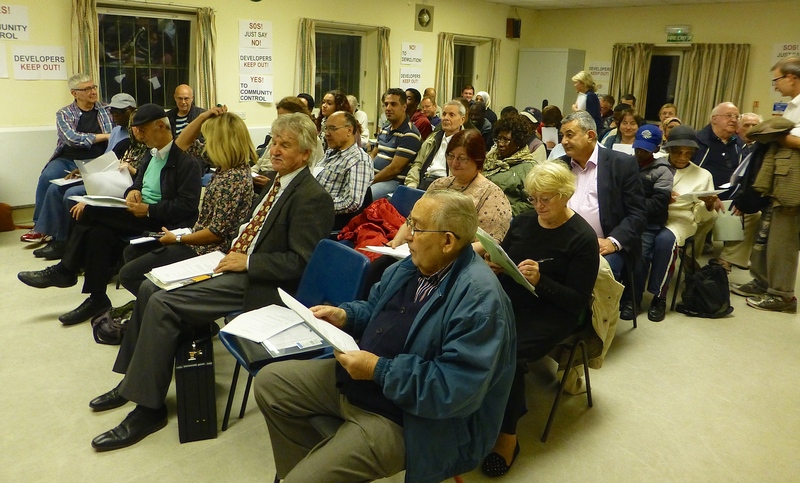 4 October 2016: AGM. 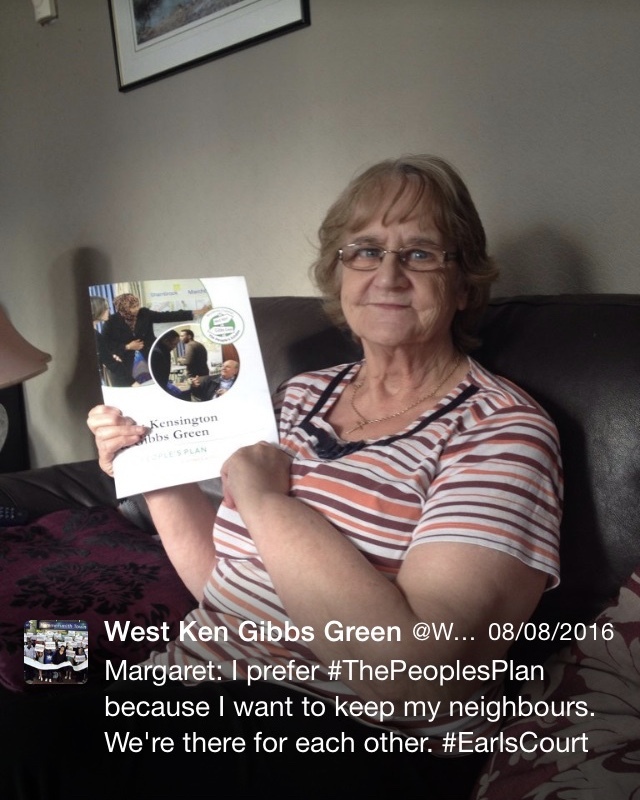 June Dyball says this about the People’s Plan: “I think it’s a great idea. 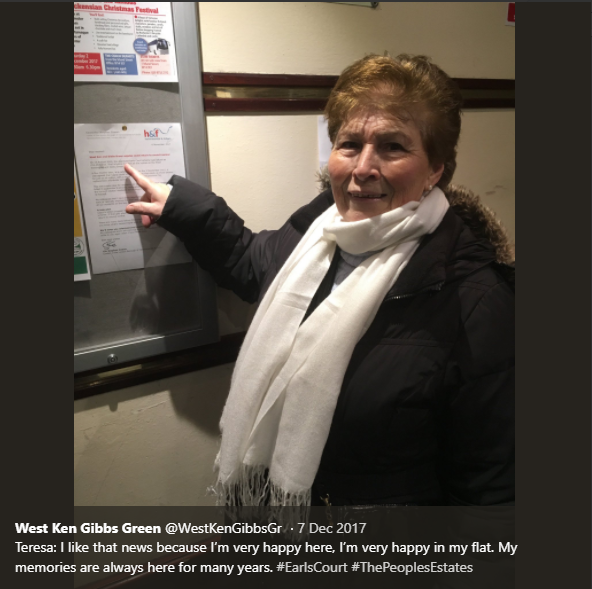 I’ve been here 44 years. 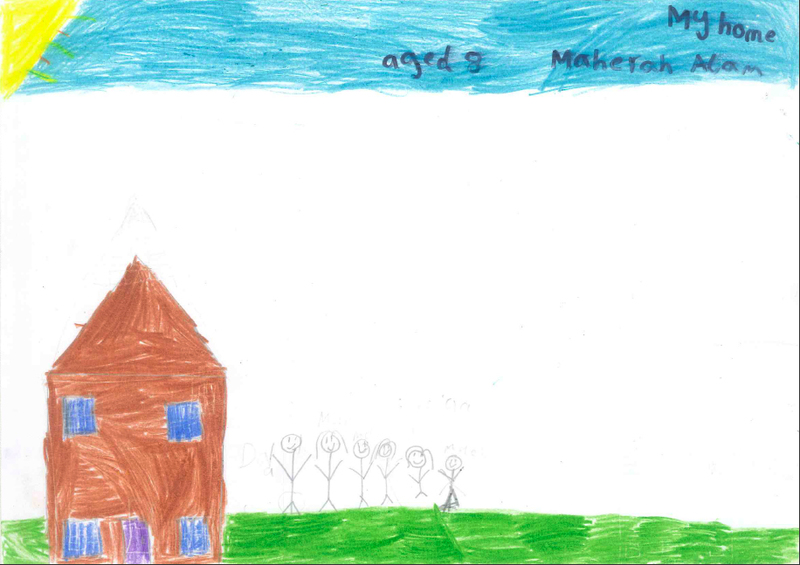 Behind our house was a building site when we first moved in, our house was the last house. 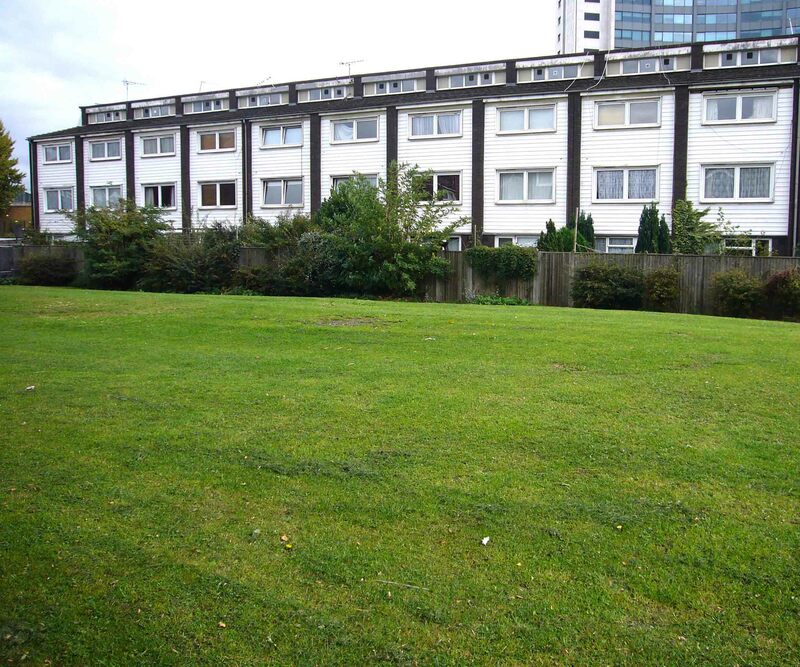 When our family visit they think it’s so peaceful, they can’t believe it’s in the middle of a big estate. 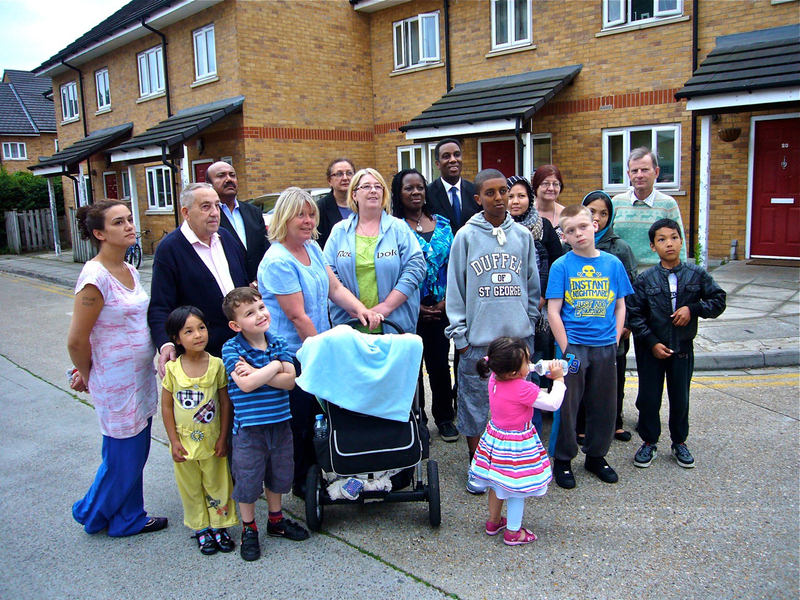 It’s not a council estate it’s a home”. 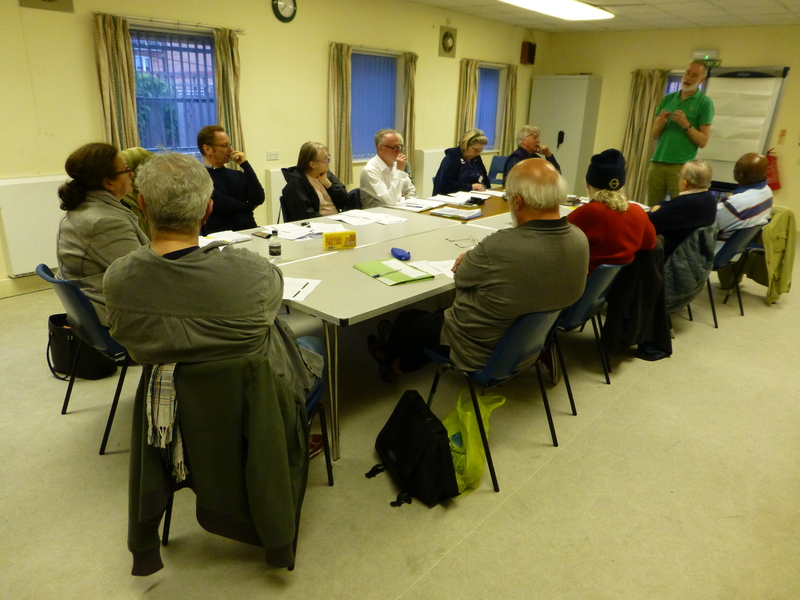 4 October 2016: AGM. 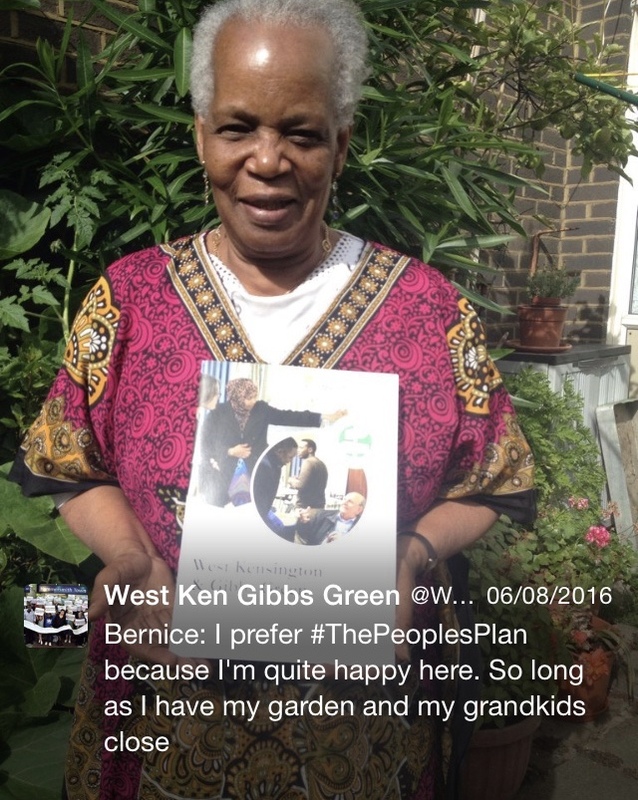 Derek Dyball says: “I’m 100% behind the People’s Plan. 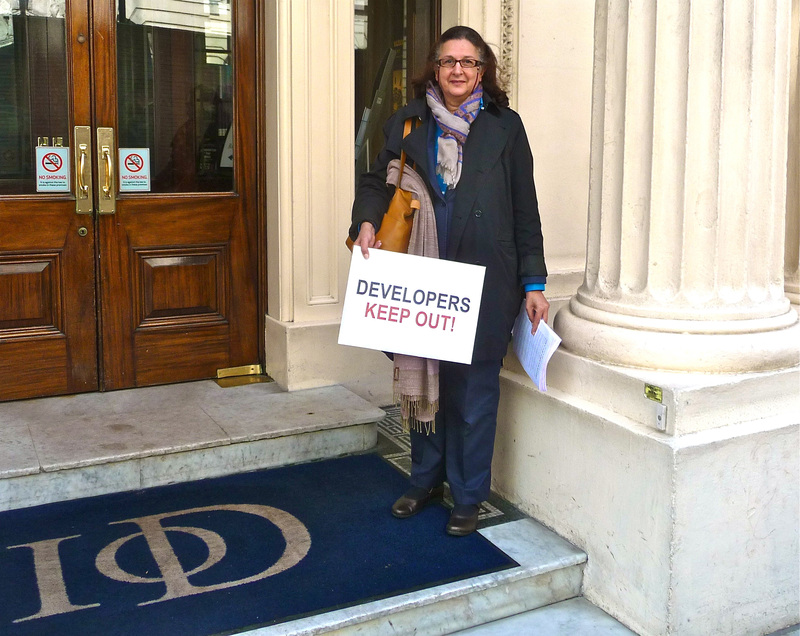 These big developers don’t give a damn about anyone. 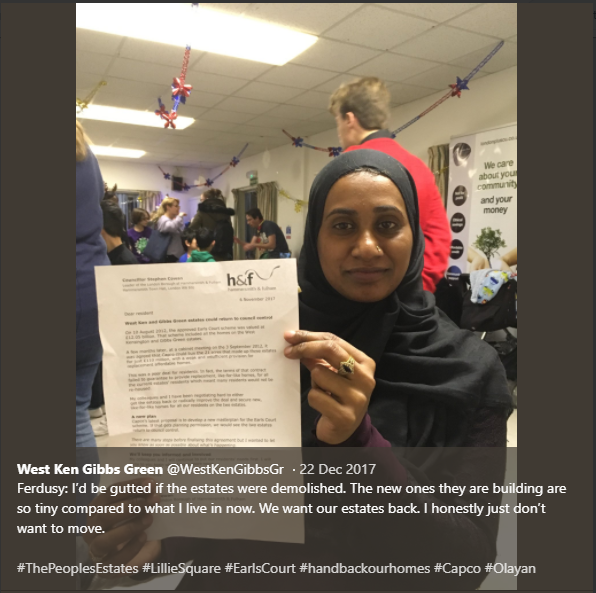 People have been forced out of London. 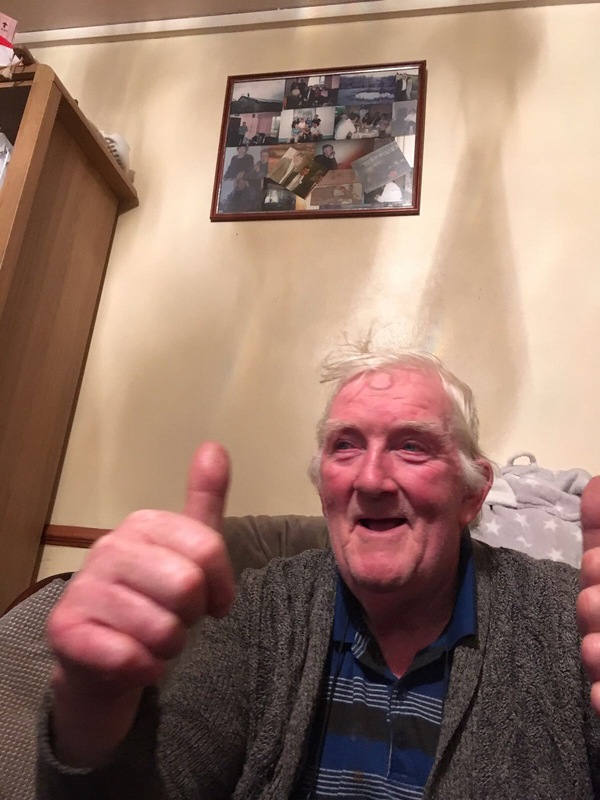 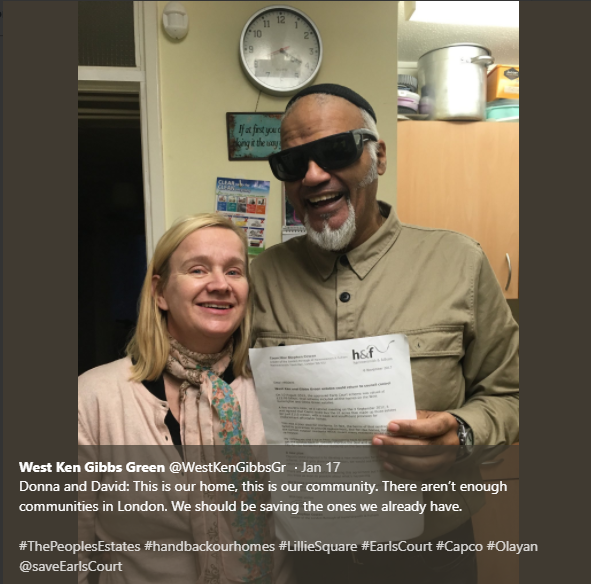 This community – life is all about looking after each other”. 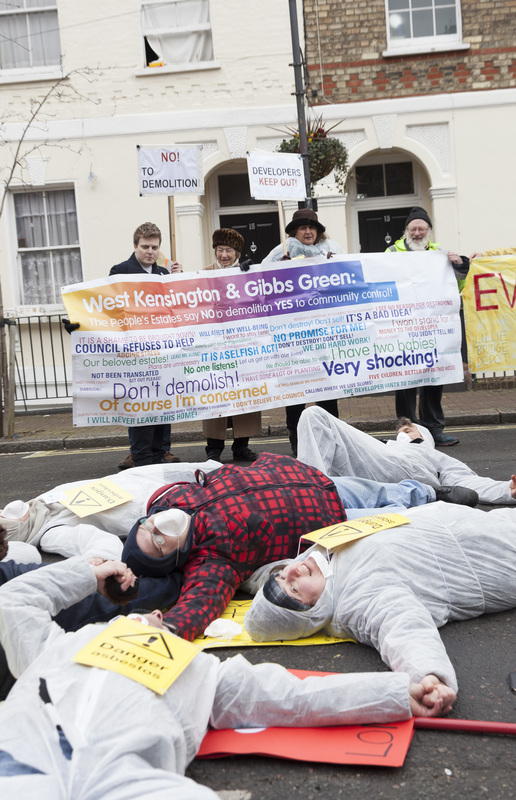 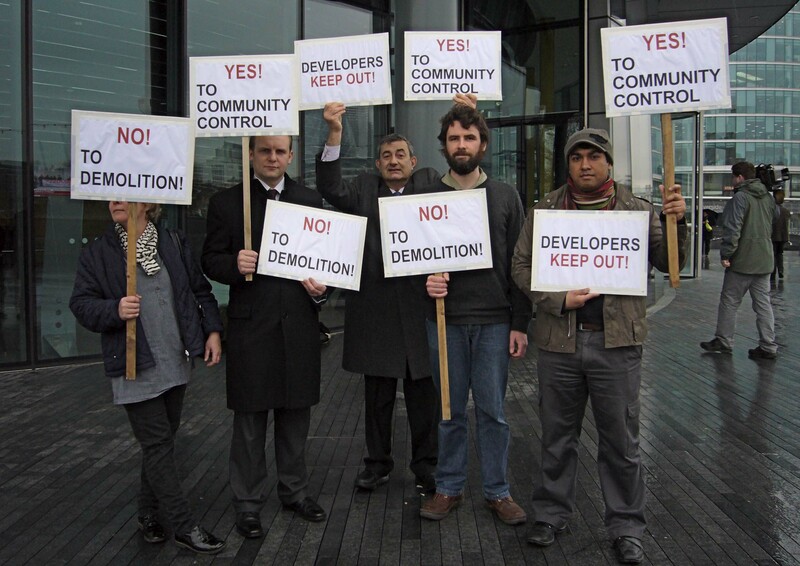 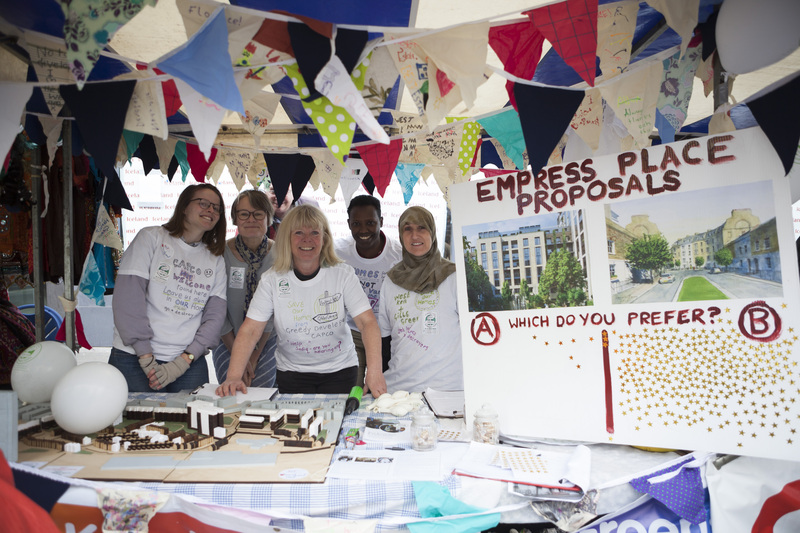 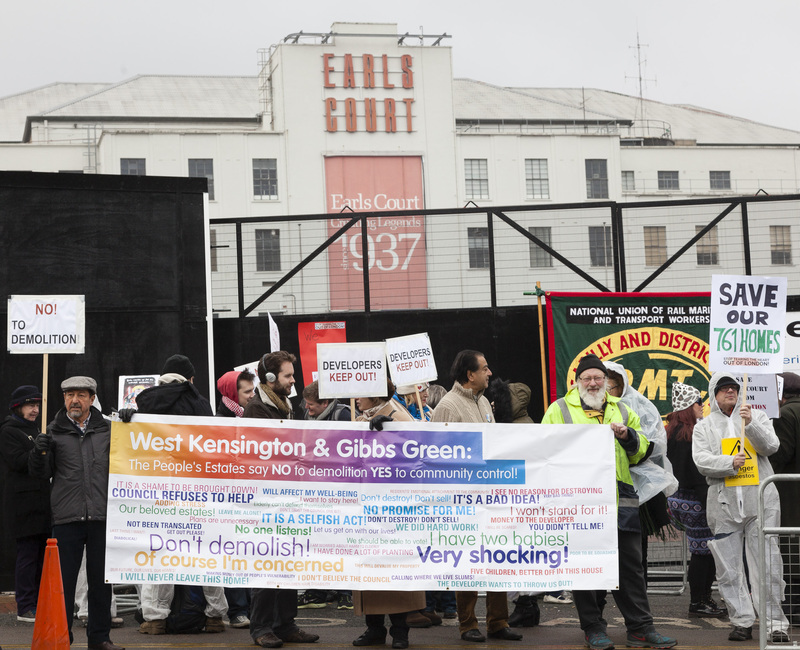 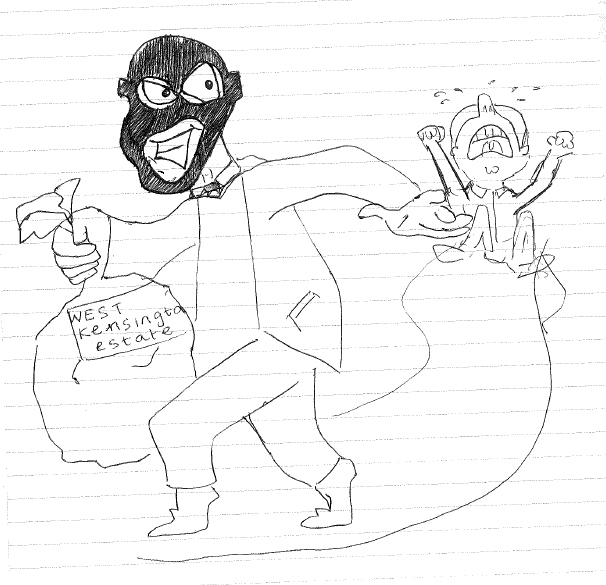 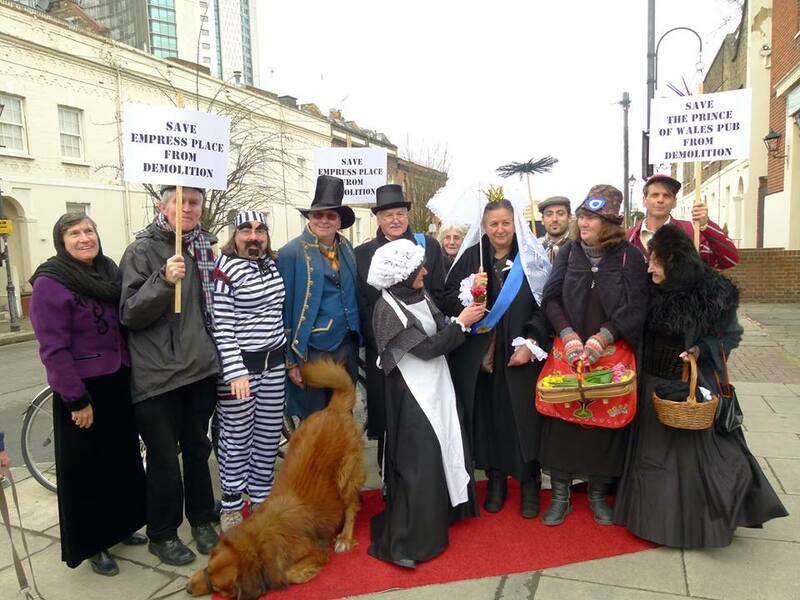 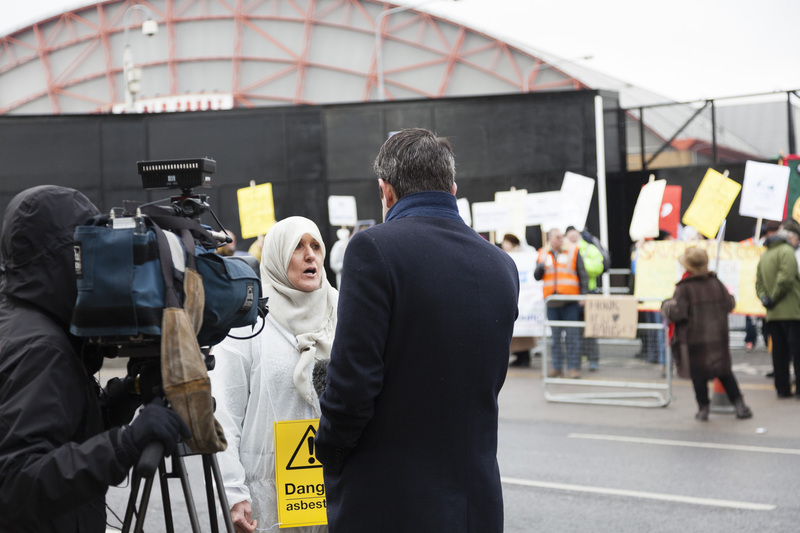 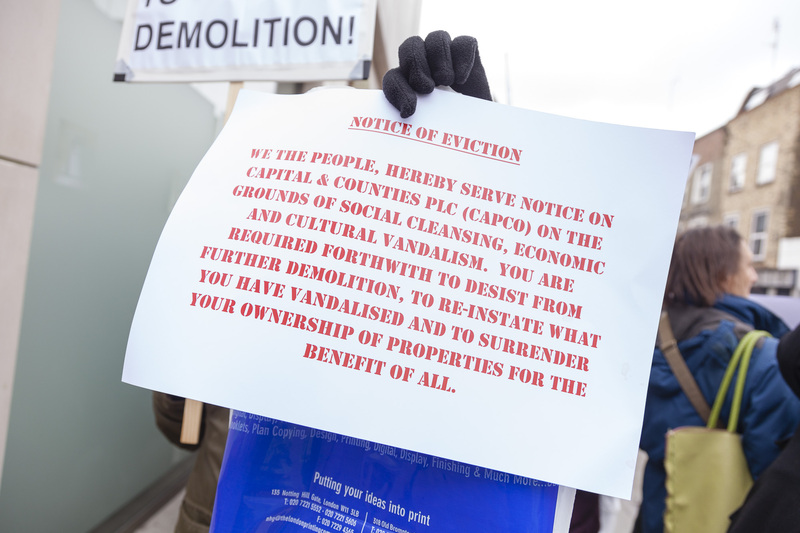 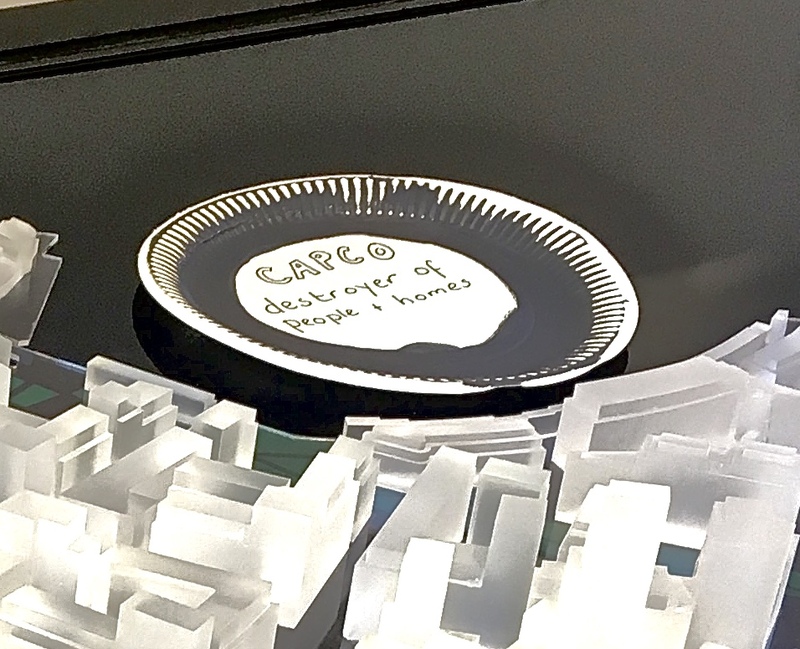 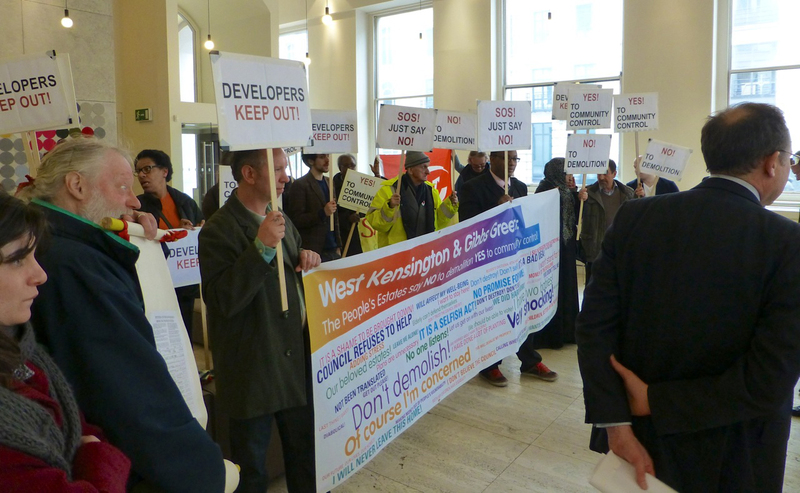 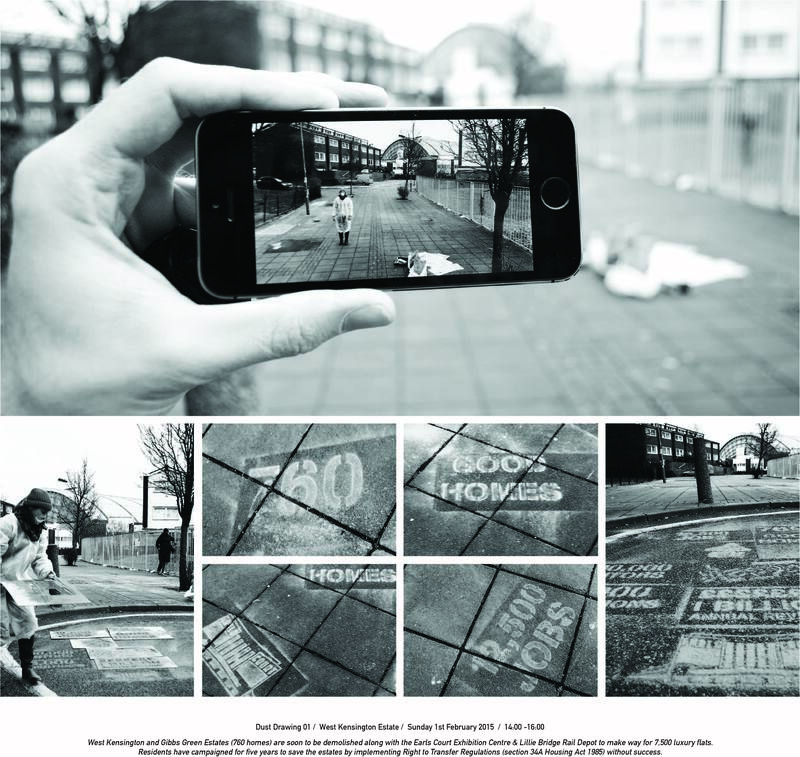 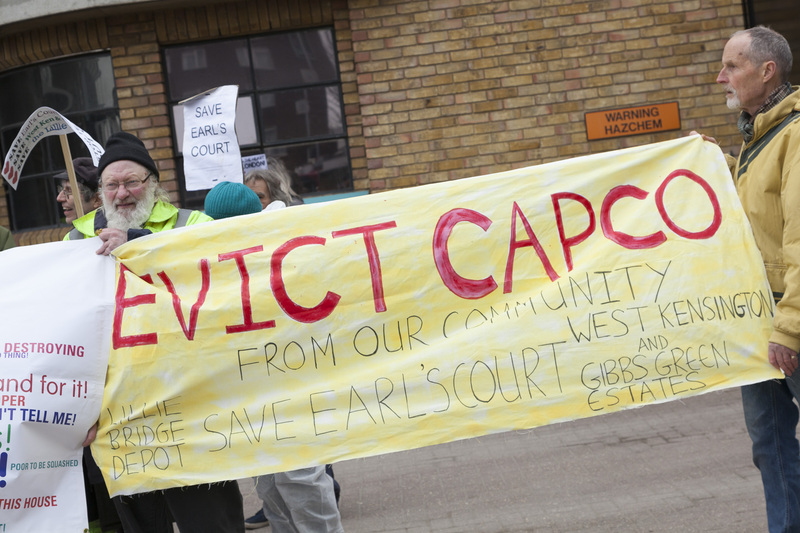 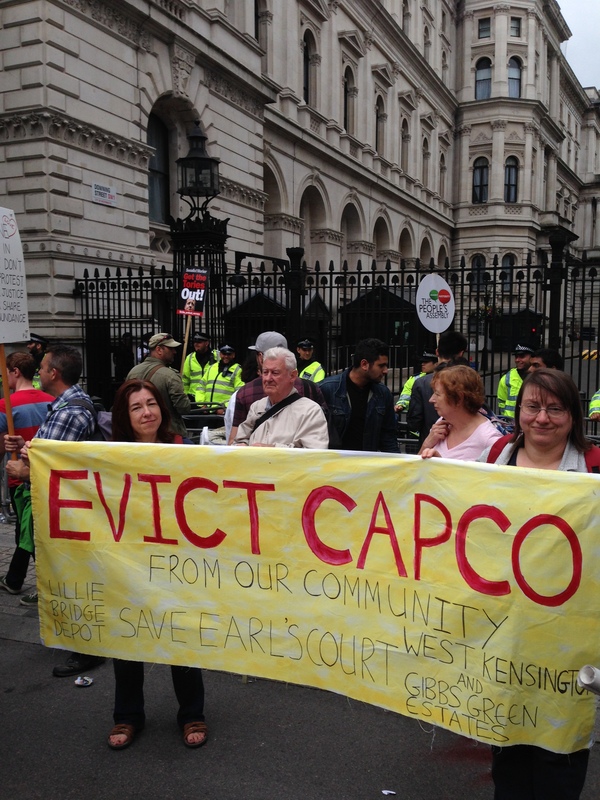 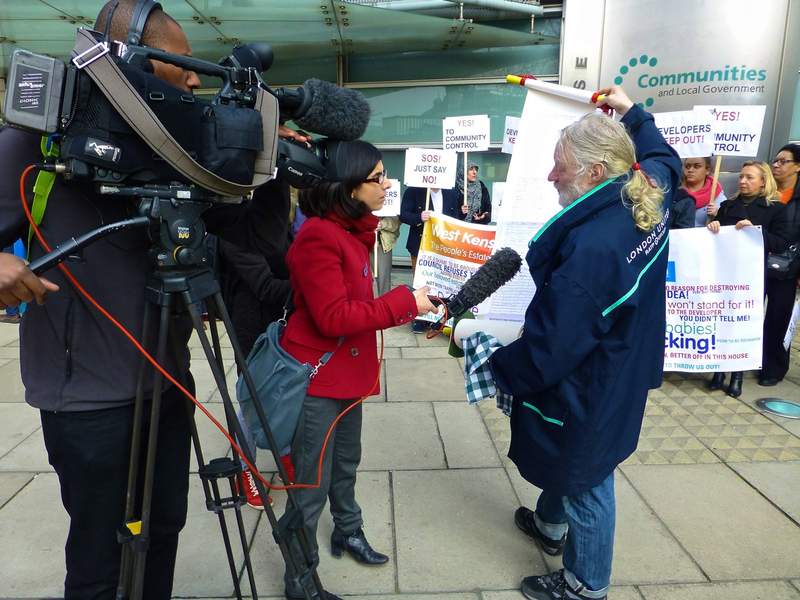 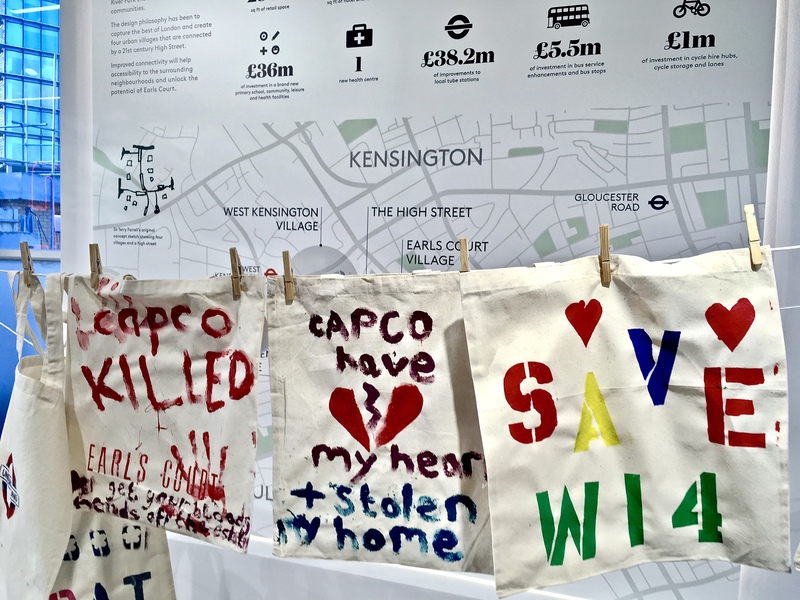 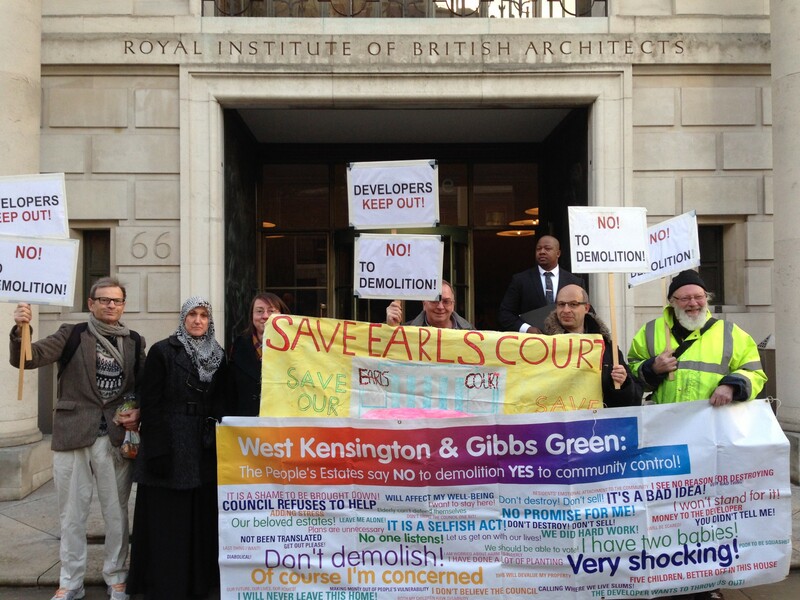 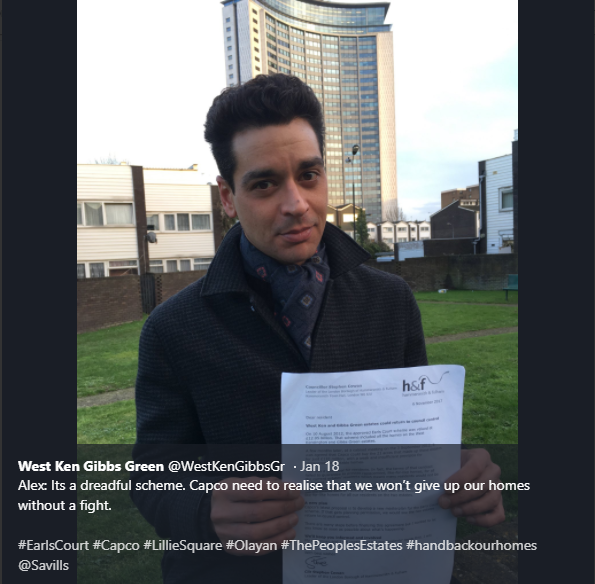 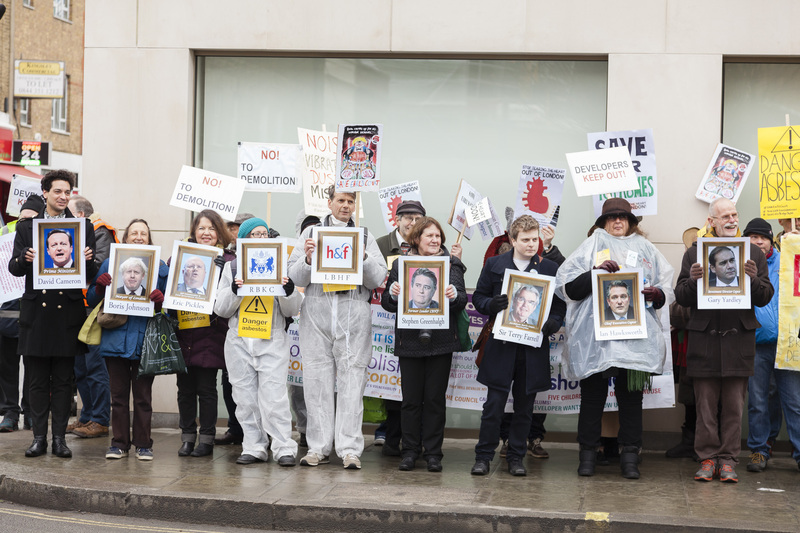 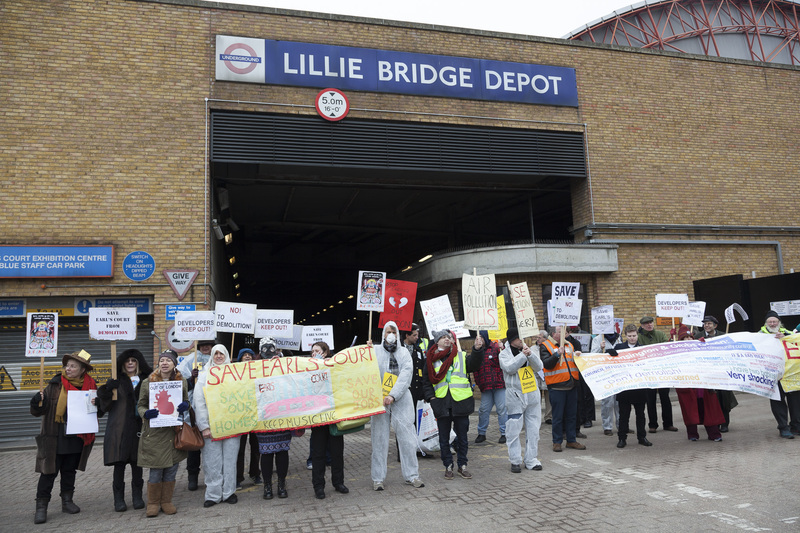 24 March 2015: Protest against the launch of City Villages report which uncritically promoted the Earl’s Court scheme, was riddled with errors and advocated the demolition of London’s council estates. 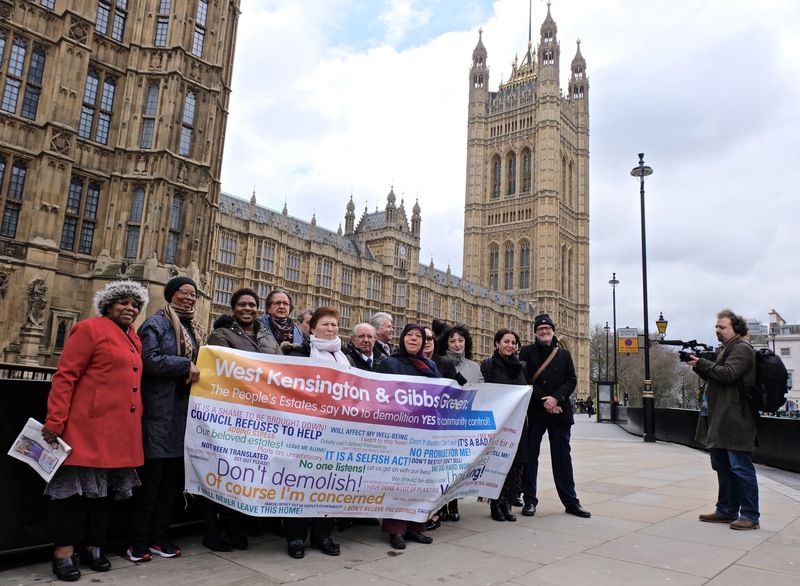 17 March 2015: WKGGCH Members vote 100 to 1 in favour of serving Right to Transfer proposal Notice on Hammersmith & Fulham Council. 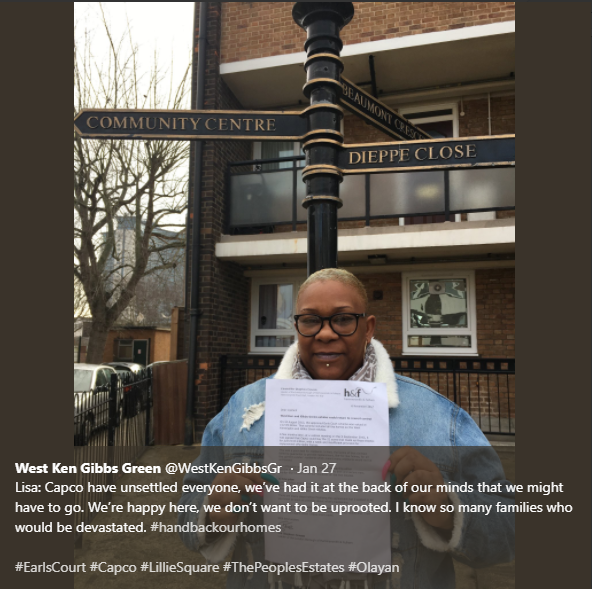 17 March 2015: WKGGCH Board Member, Linda Sanders bans options for estates’ future that would set resident against resident. 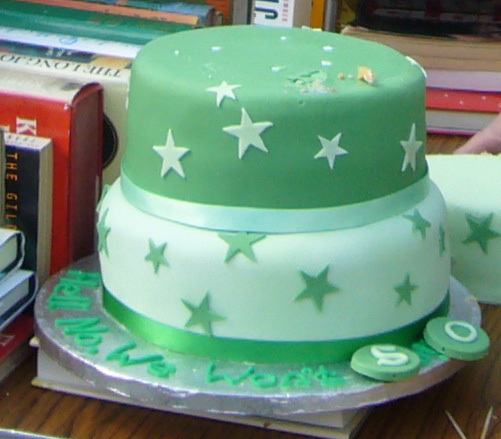 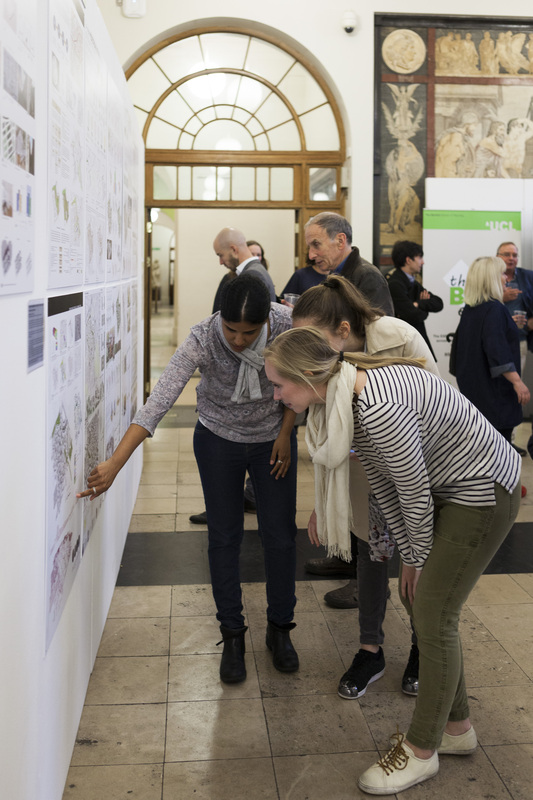 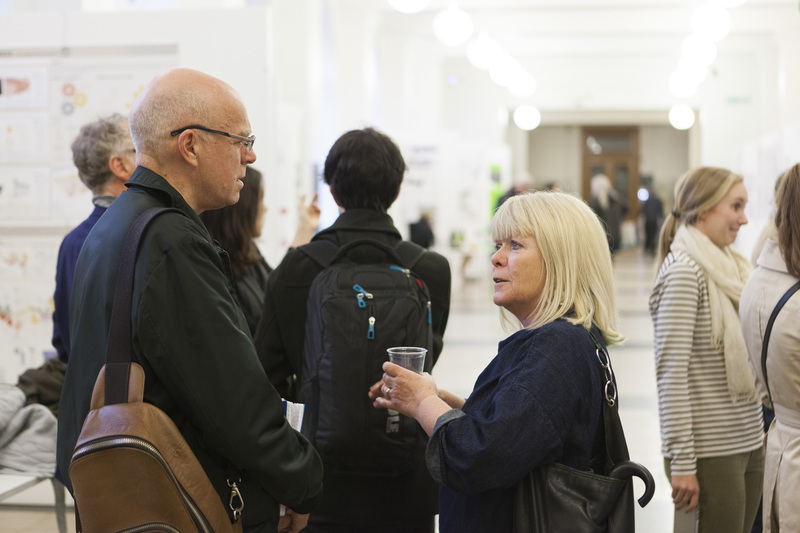 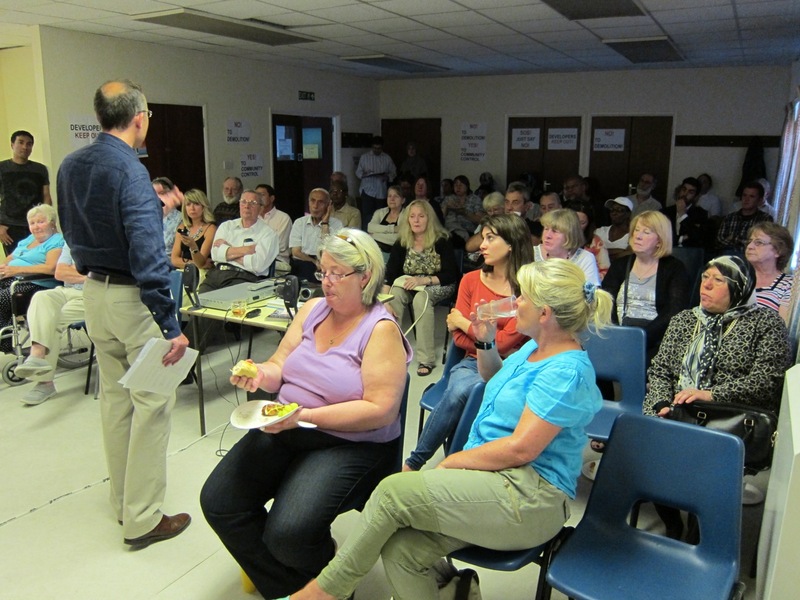 23 September 2014: WKGGCH AGM in the Gibbs Green Hall. 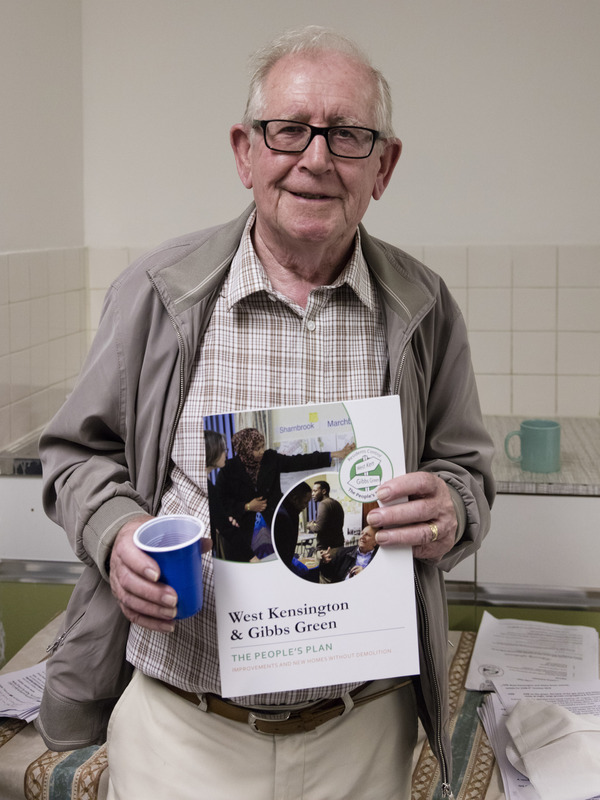 23 September 2014: WKGGCH AGM congratulates Charlie Treloggan (left) on his 90th birthday. 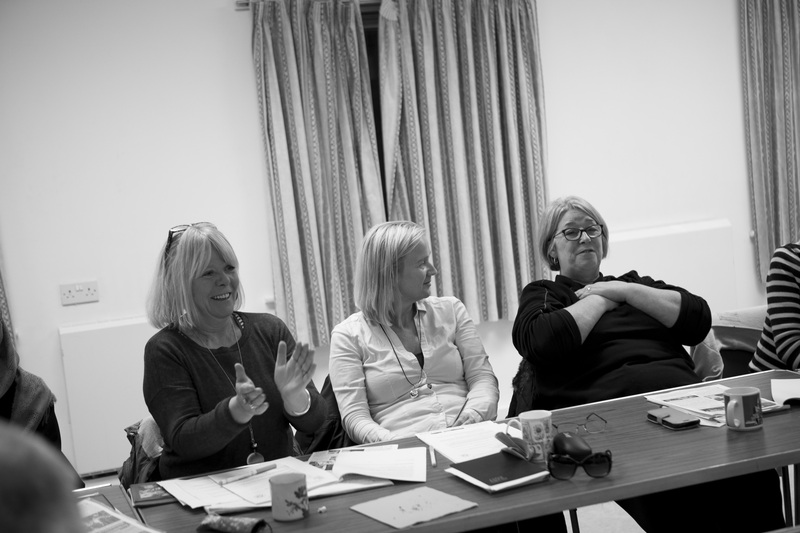 22 July 2014: Left to right, WKGGCH Board Members Diana Belshaw, Charlie Treloggan and Linda Sanders. 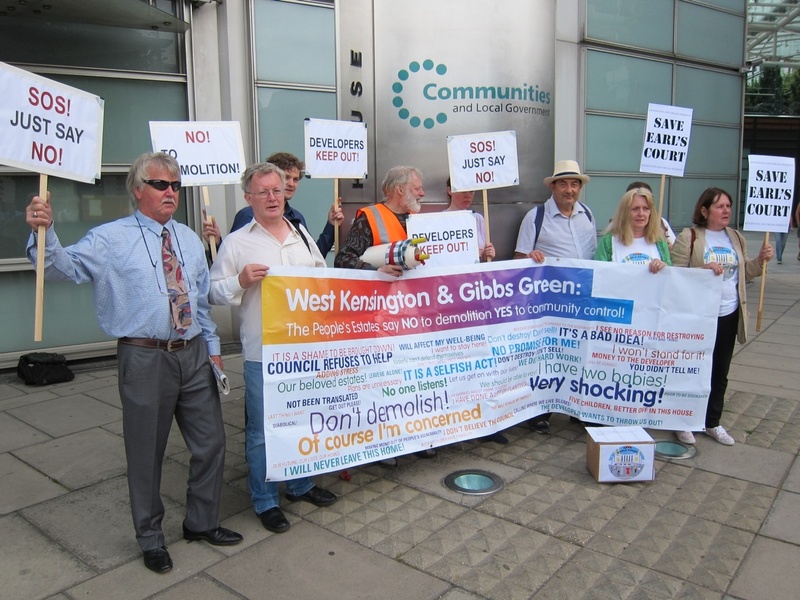 22 July 2014: WKGGCH Board considers whether to serve a Right to Transfer Proposal Notice. 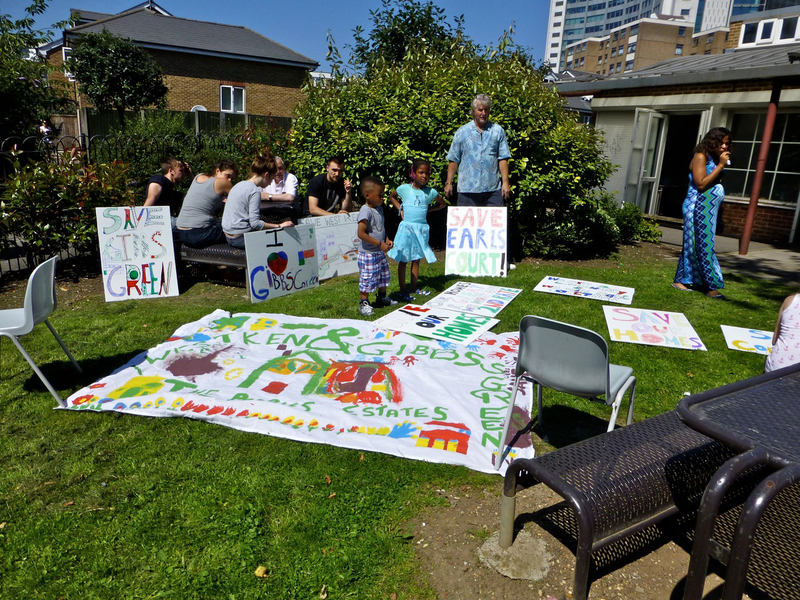 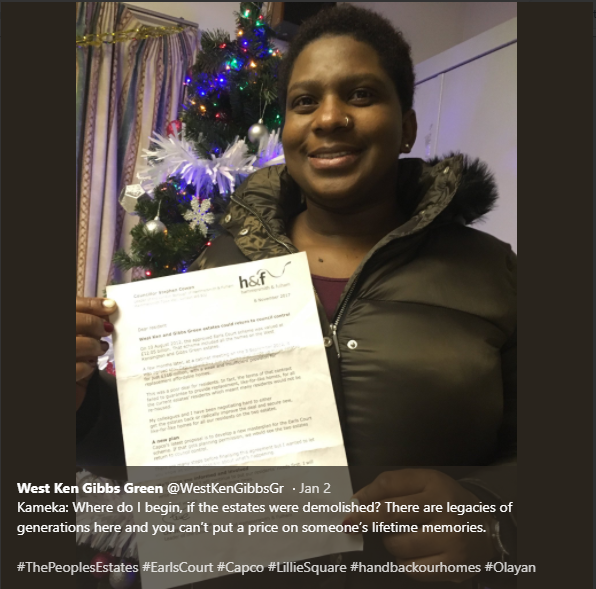 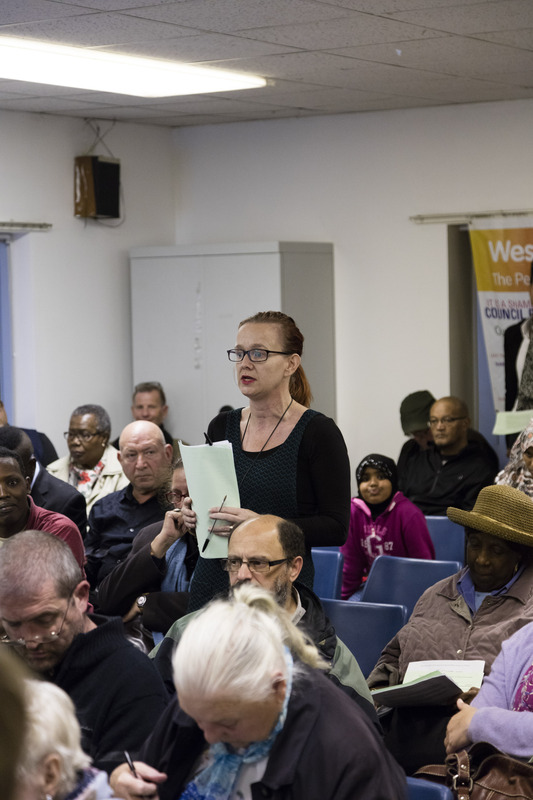 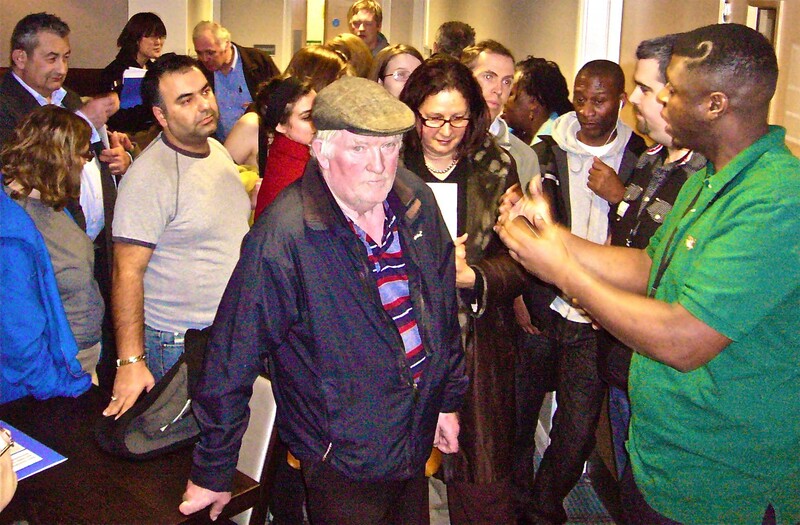 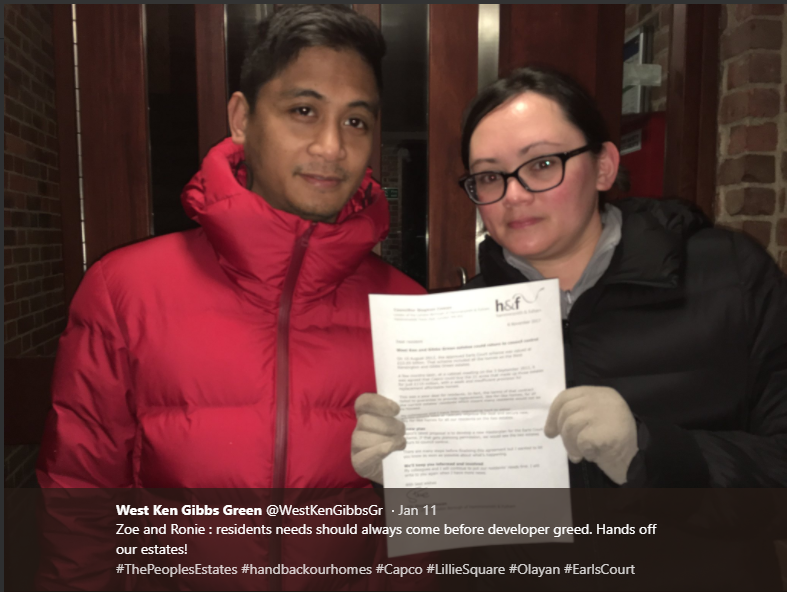 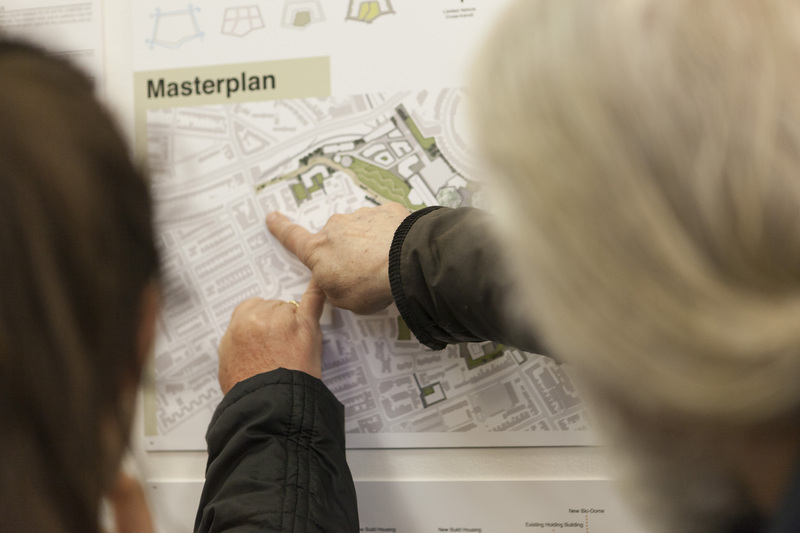 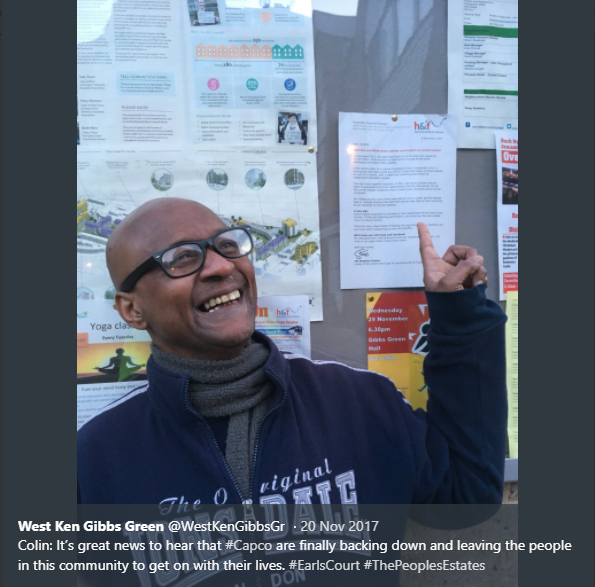 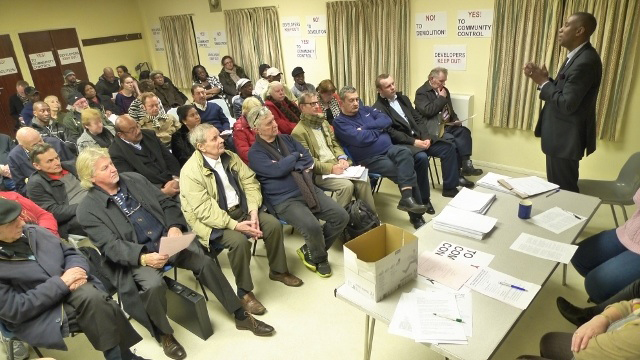 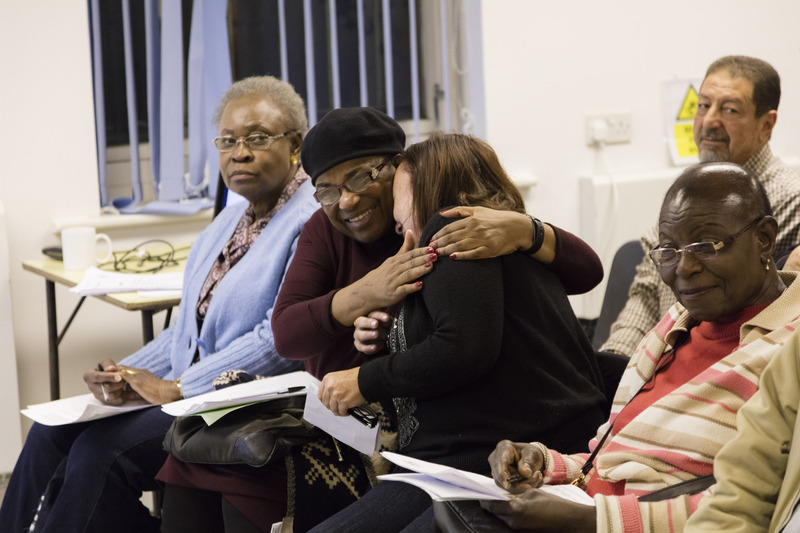 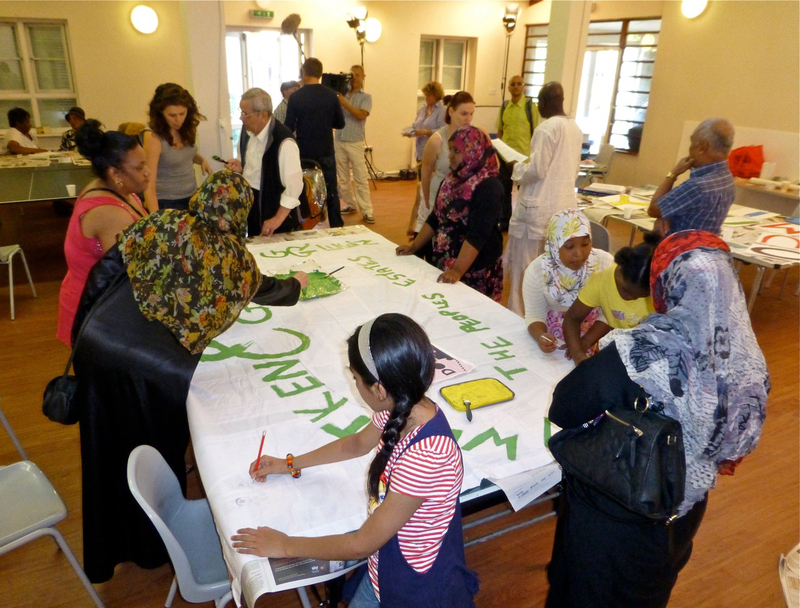 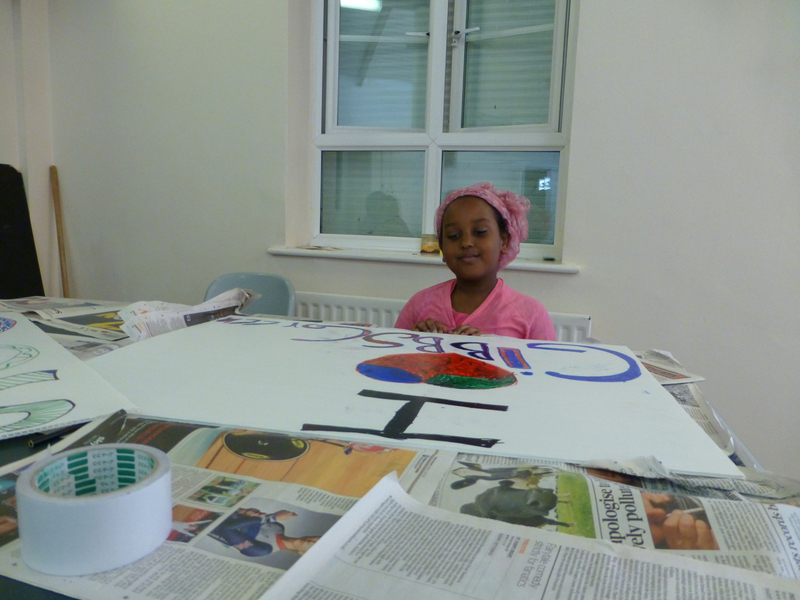 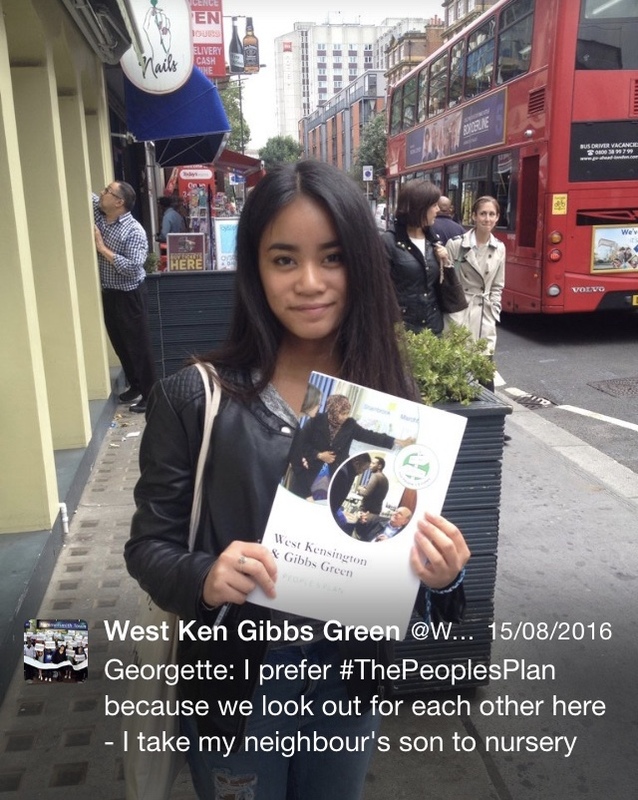 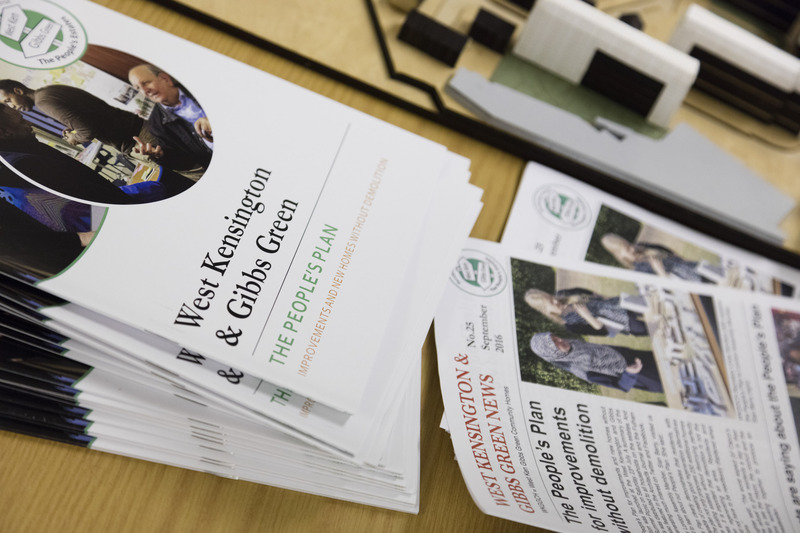 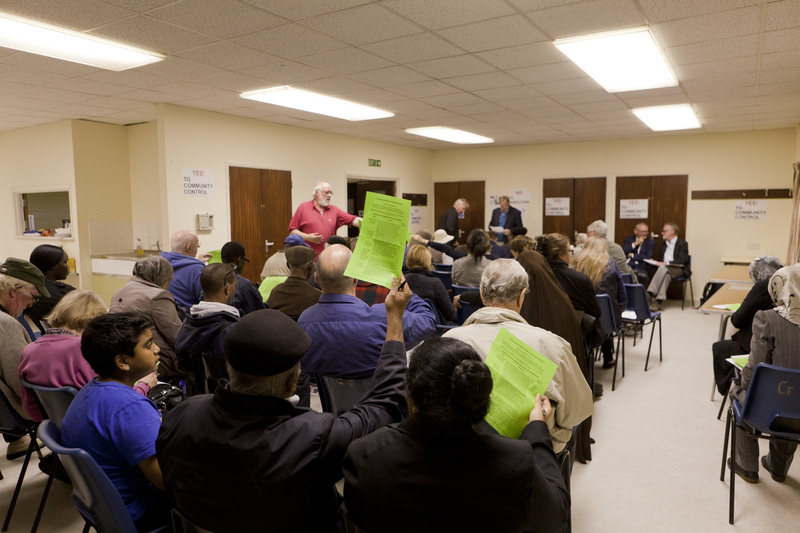 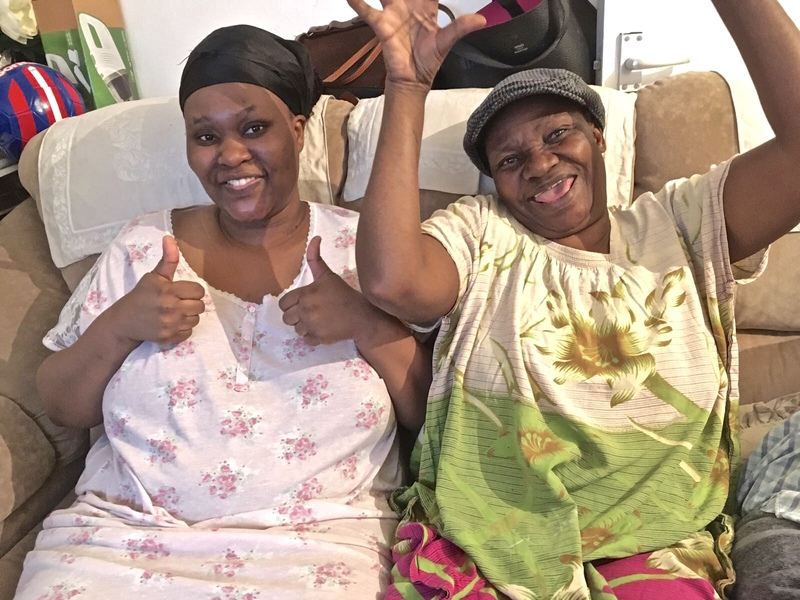 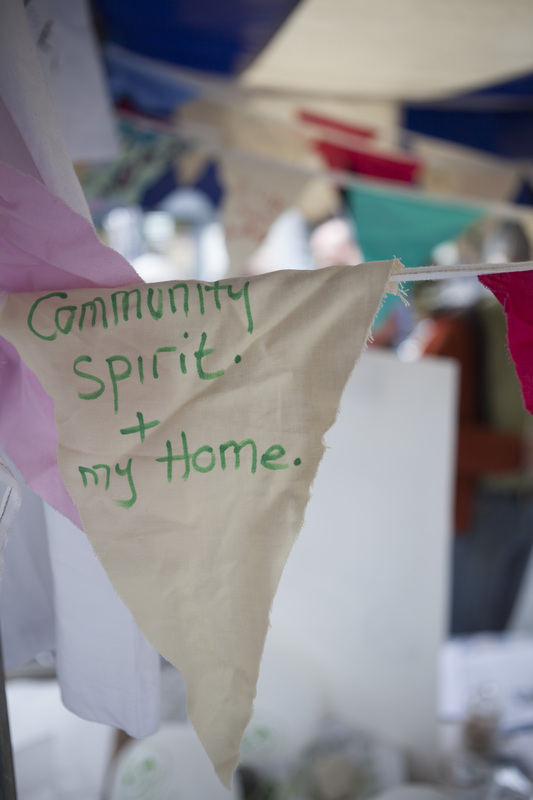 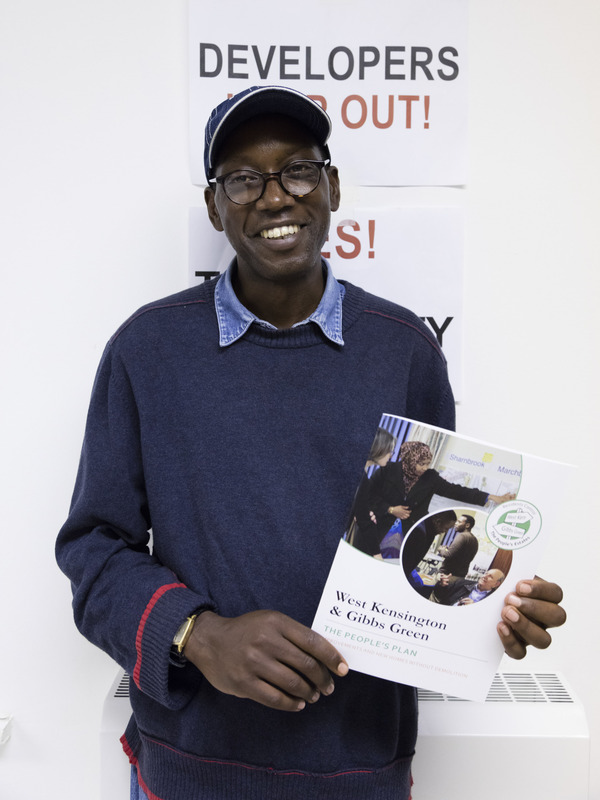 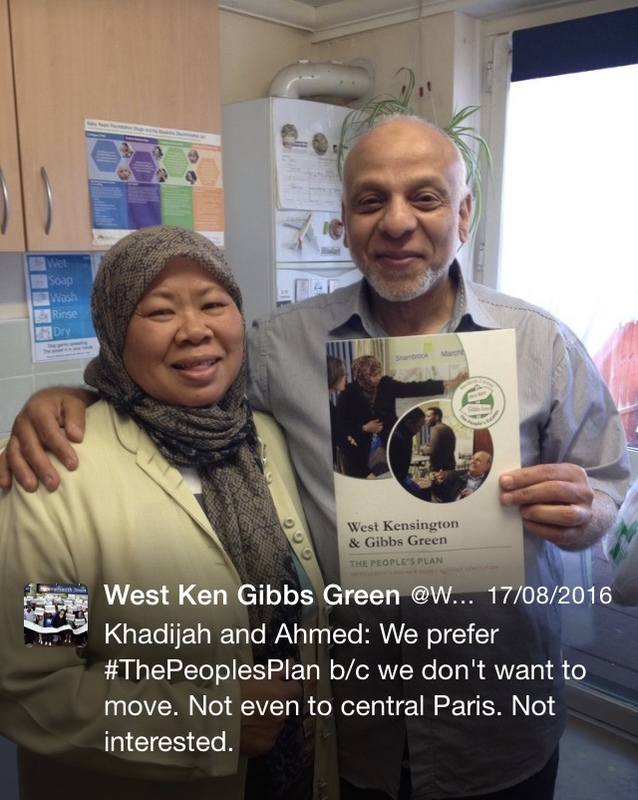 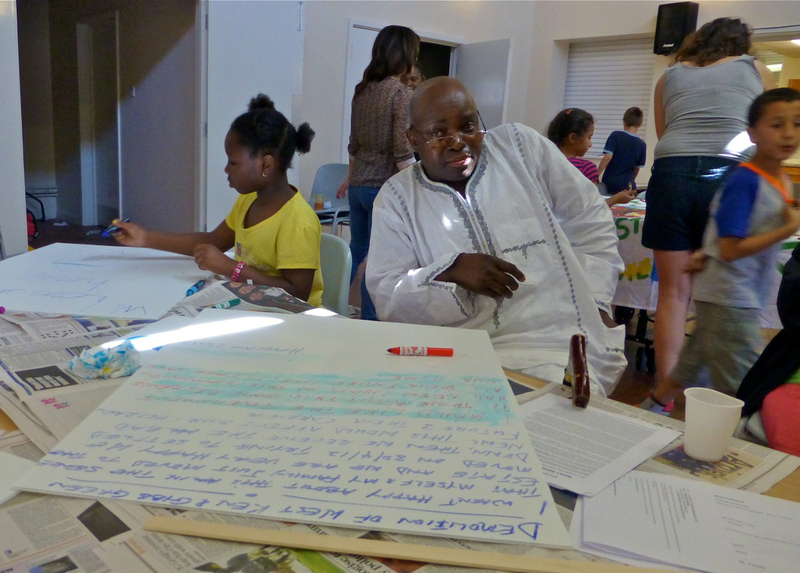 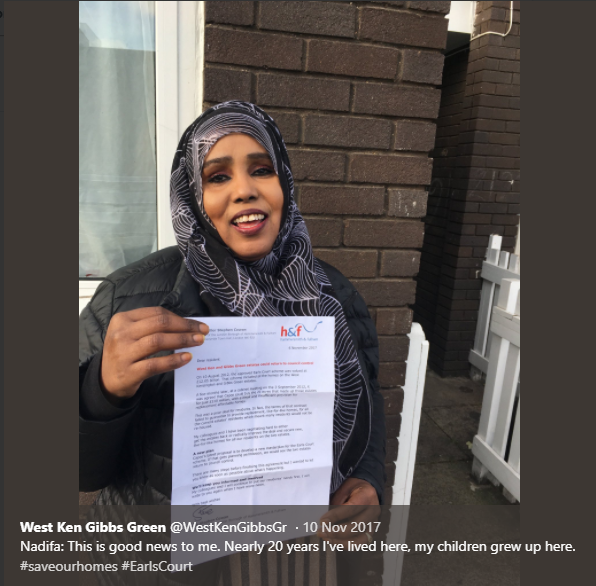 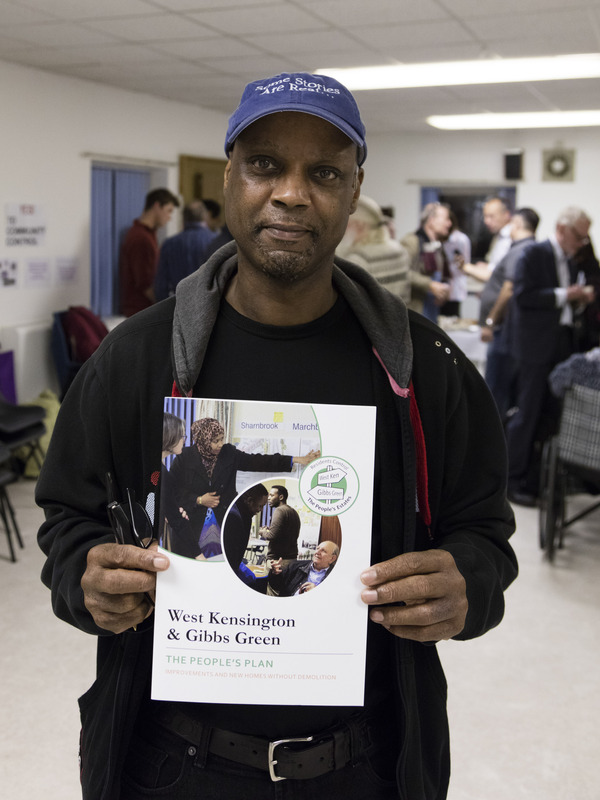 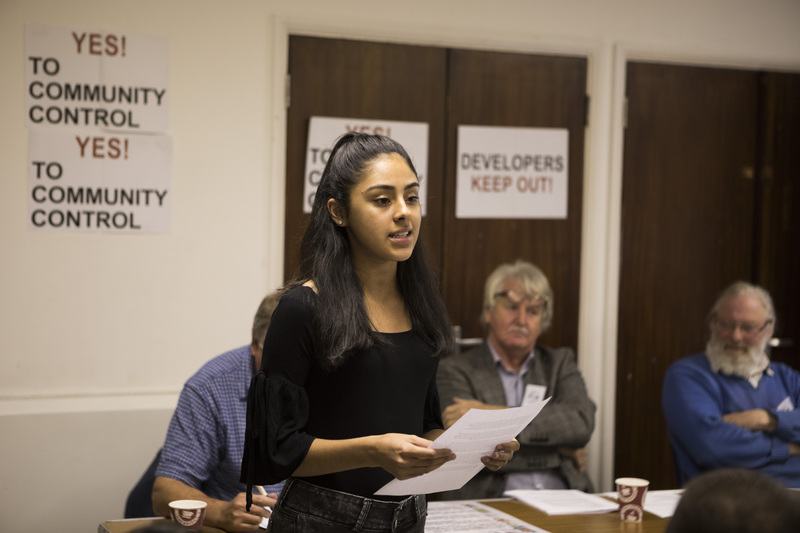 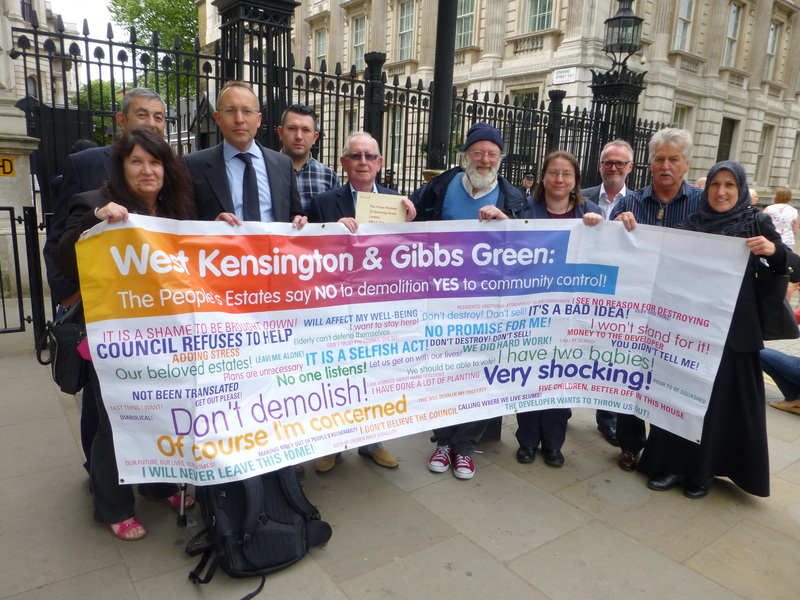 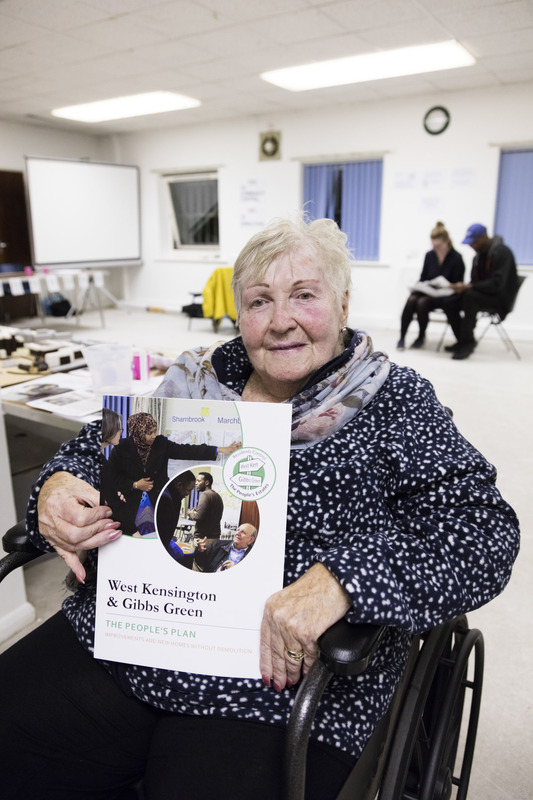 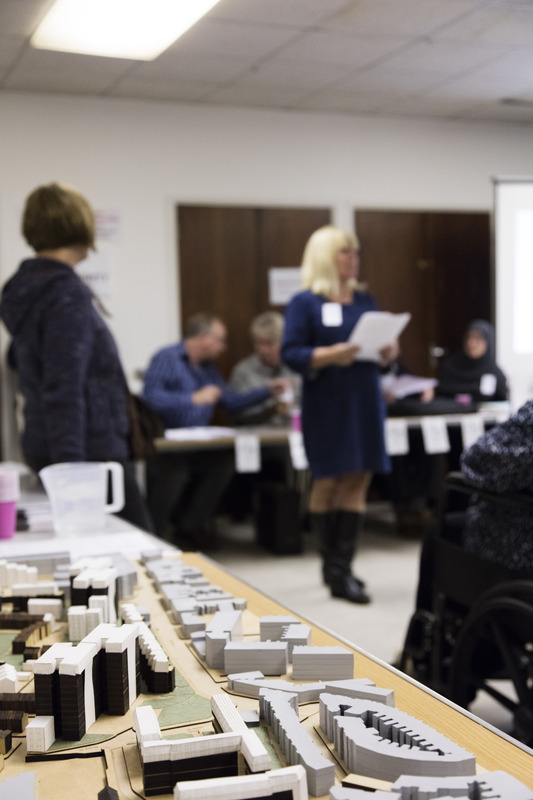 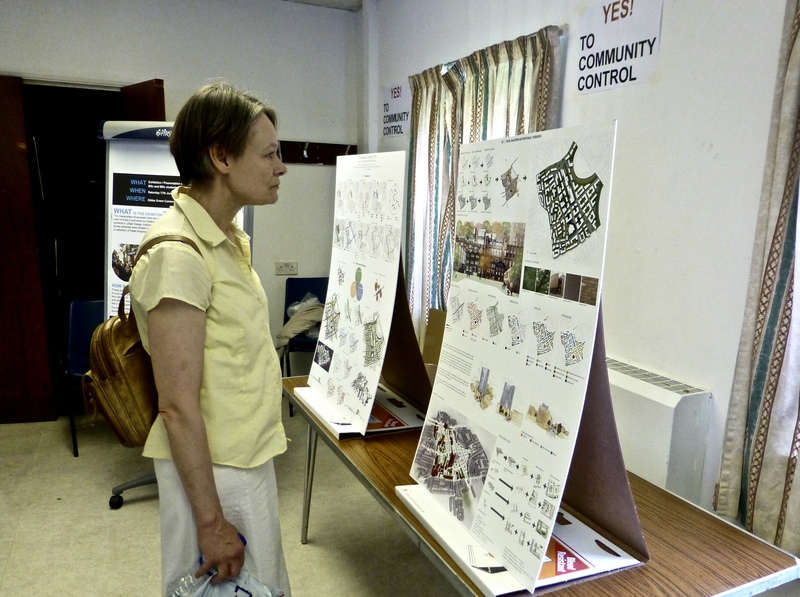 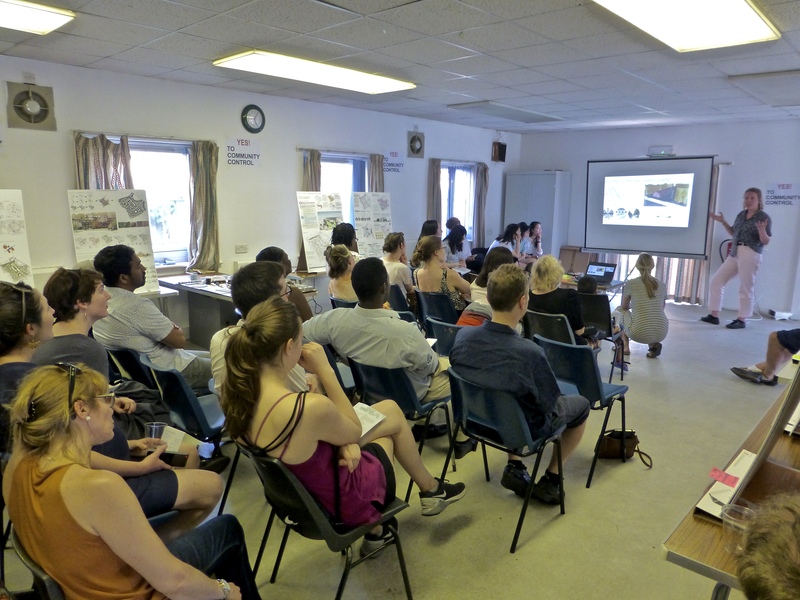 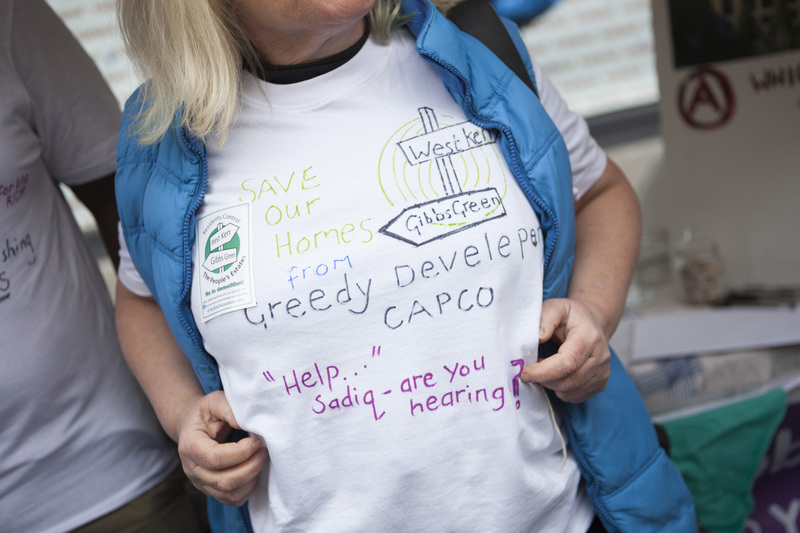 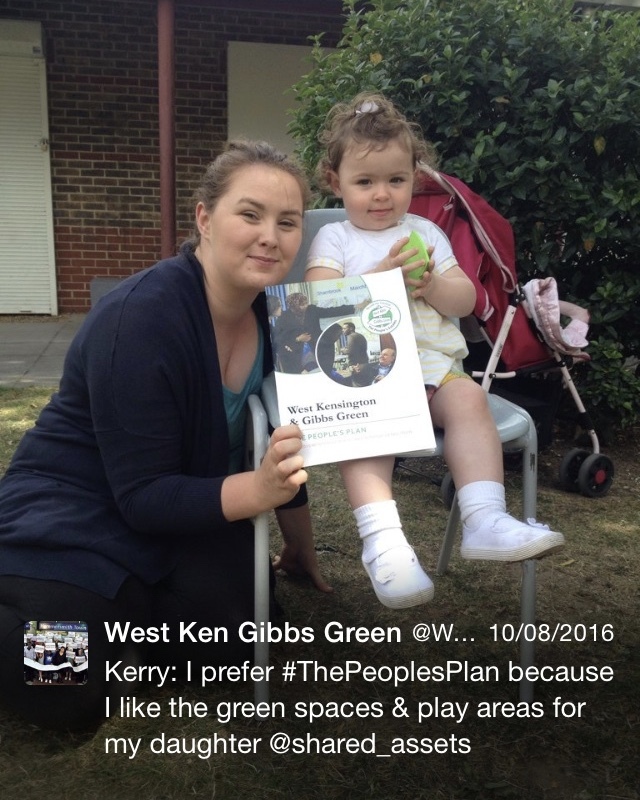 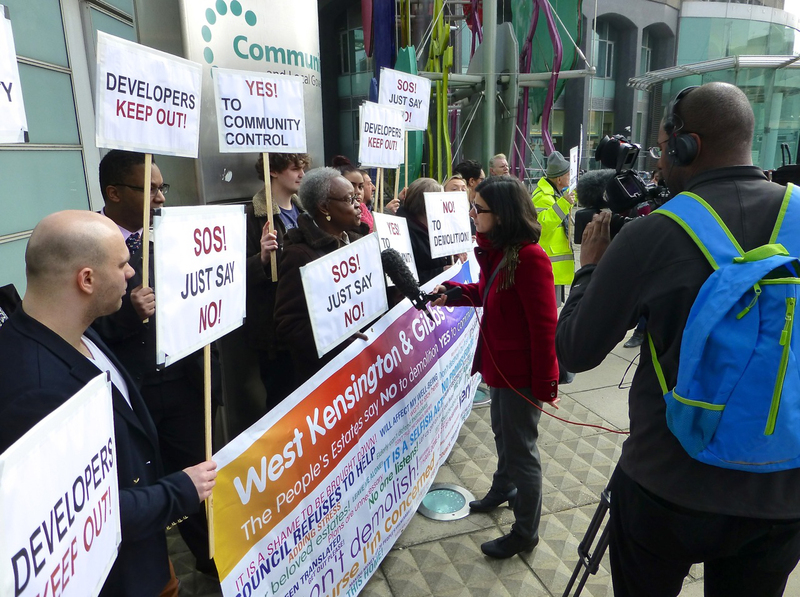 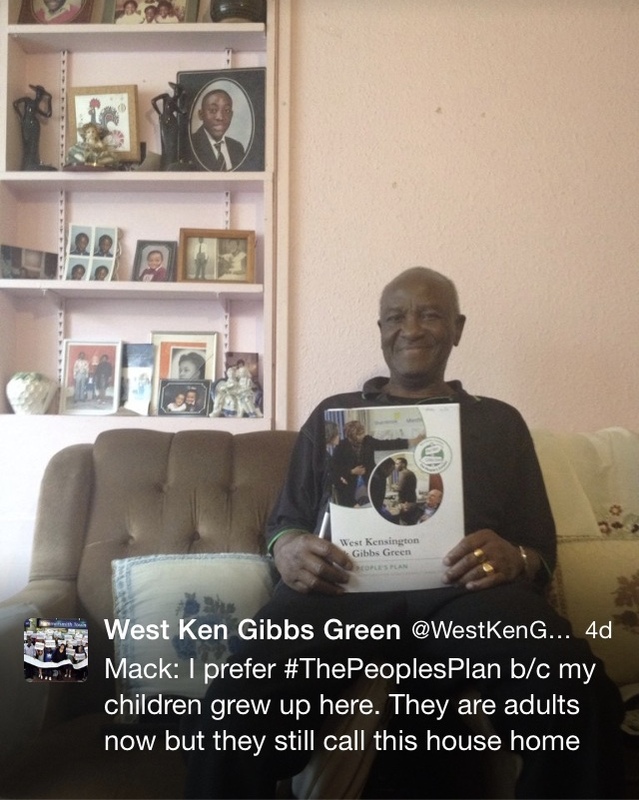 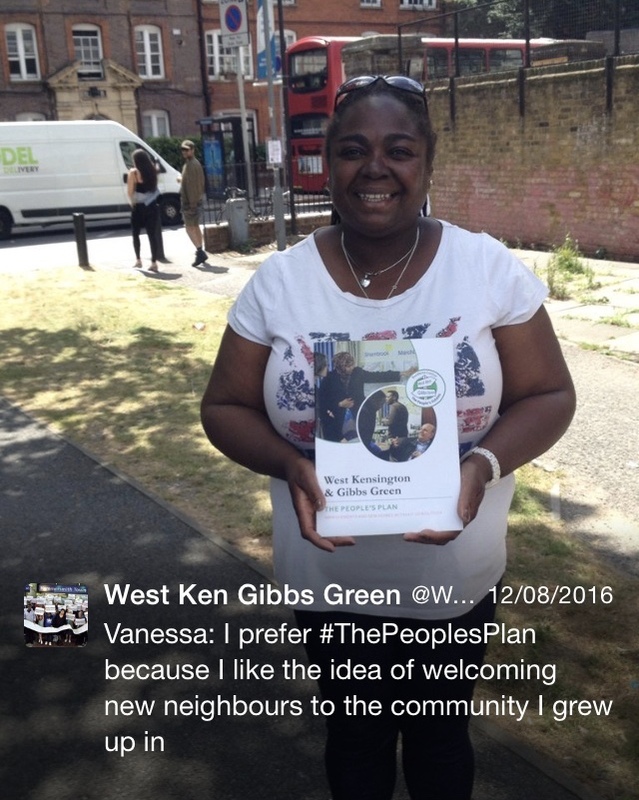 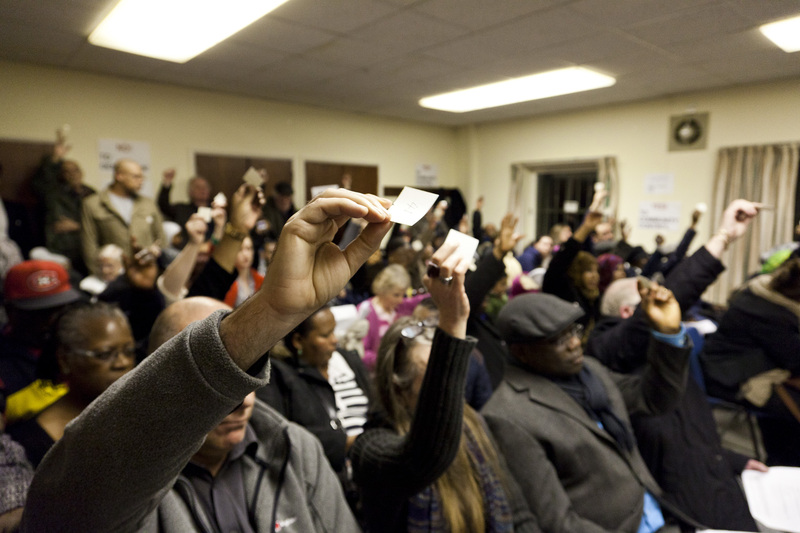 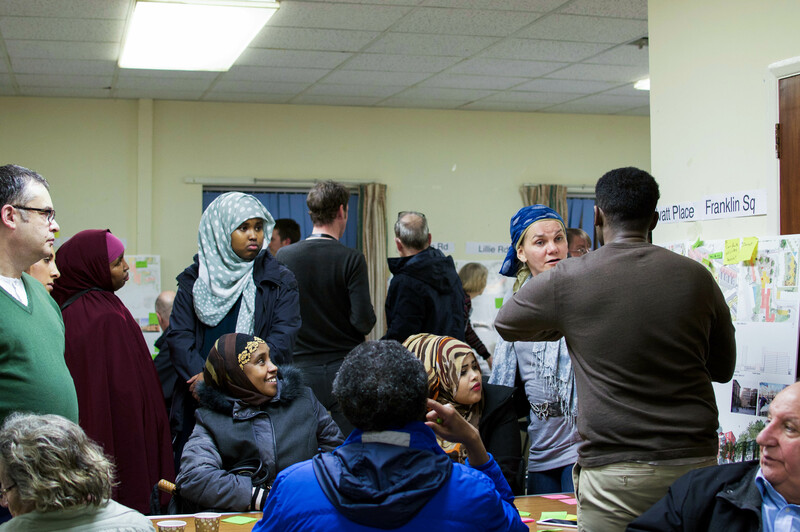 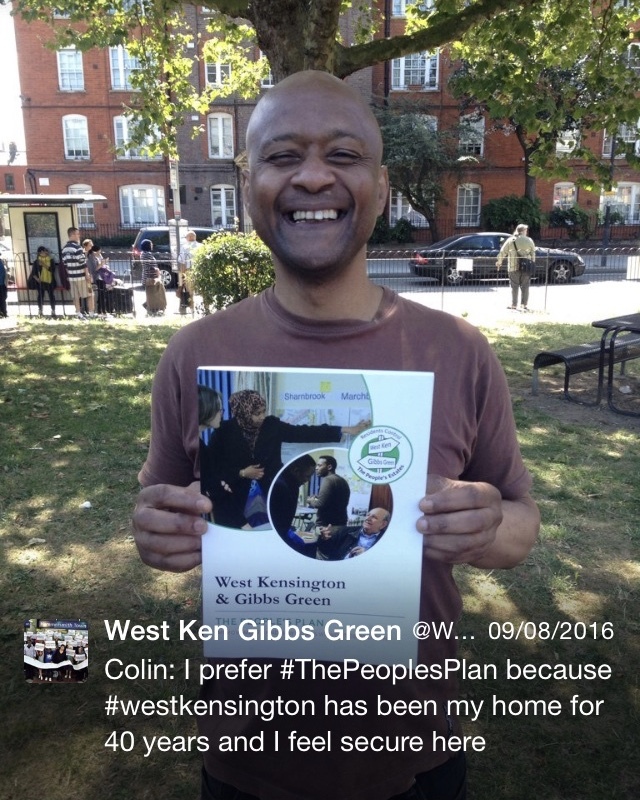 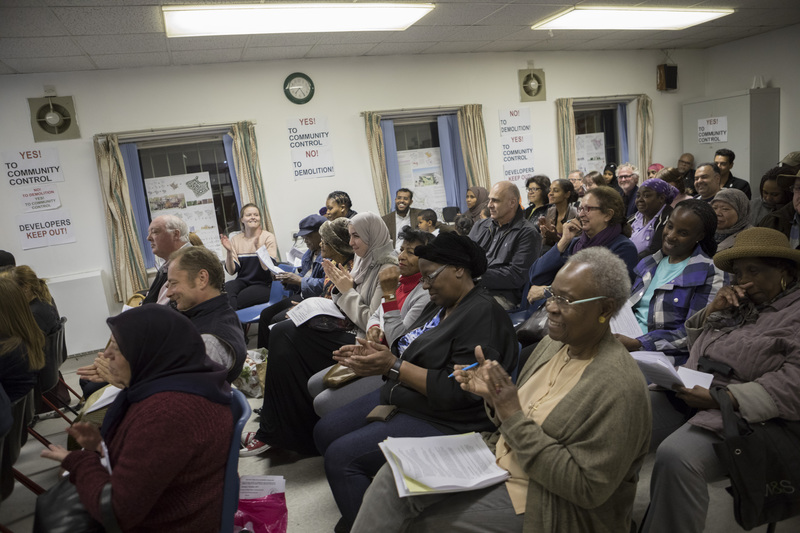 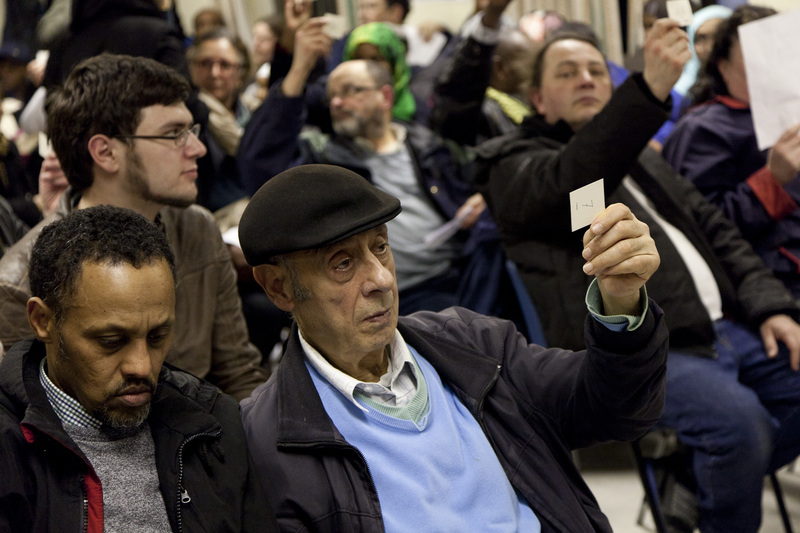 1 July 2014: 120 residents attend the General Meeting of West Ken Gibbs Green Community Homes to decide whether to serve a Right to Transfer proposal notice. 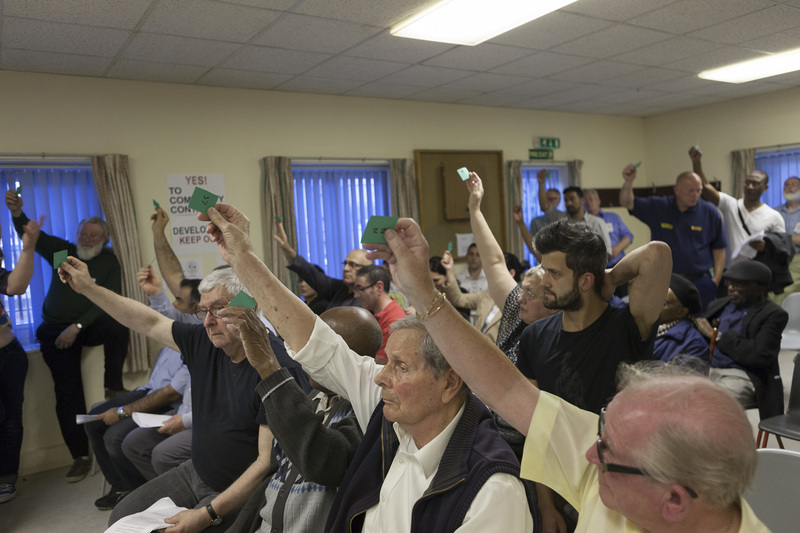 79 members voted in favour: noe voted against. 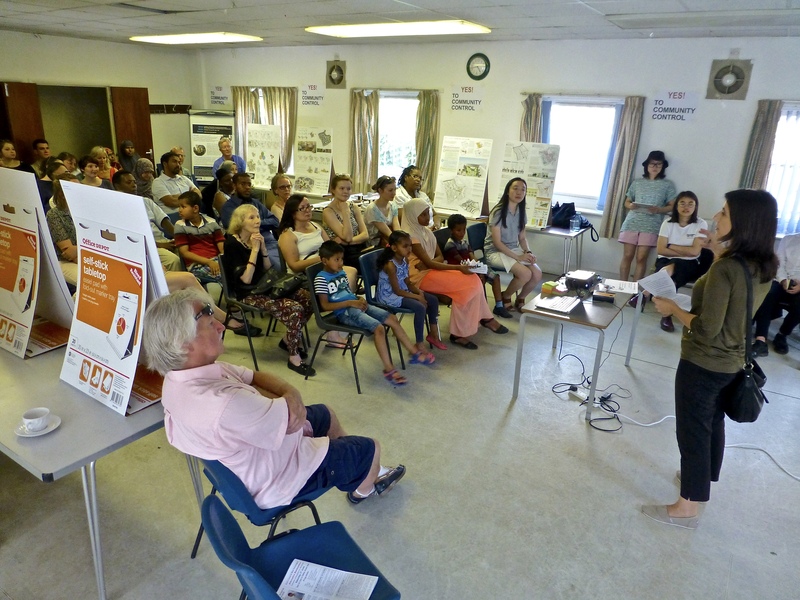 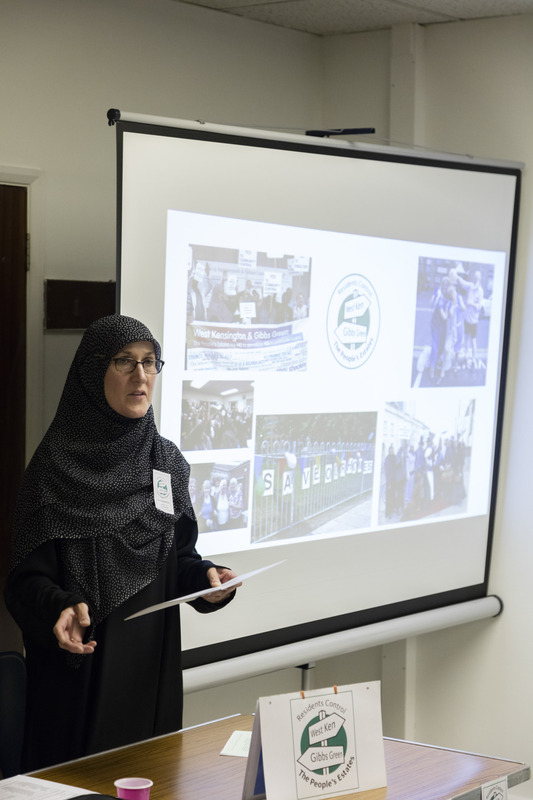 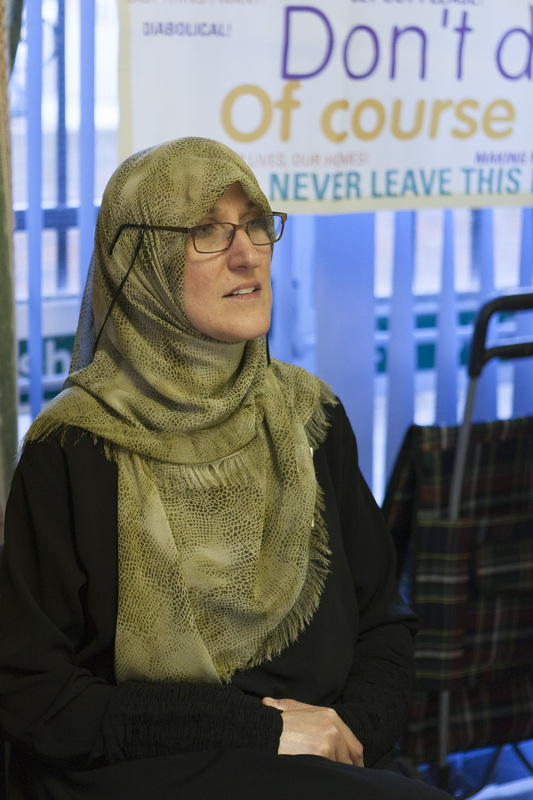 1 July 2014: Board Member and Company Secretary Linda Sanders who spoke to residents about the history of the campaign to save the estates. 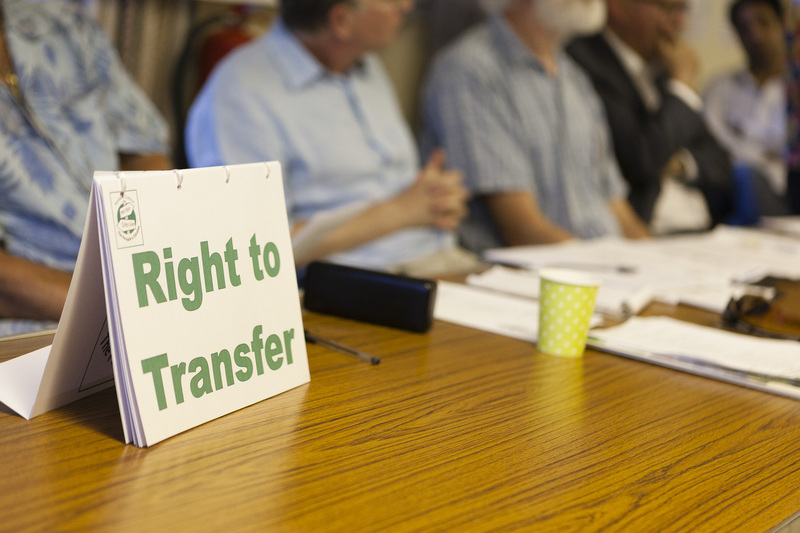 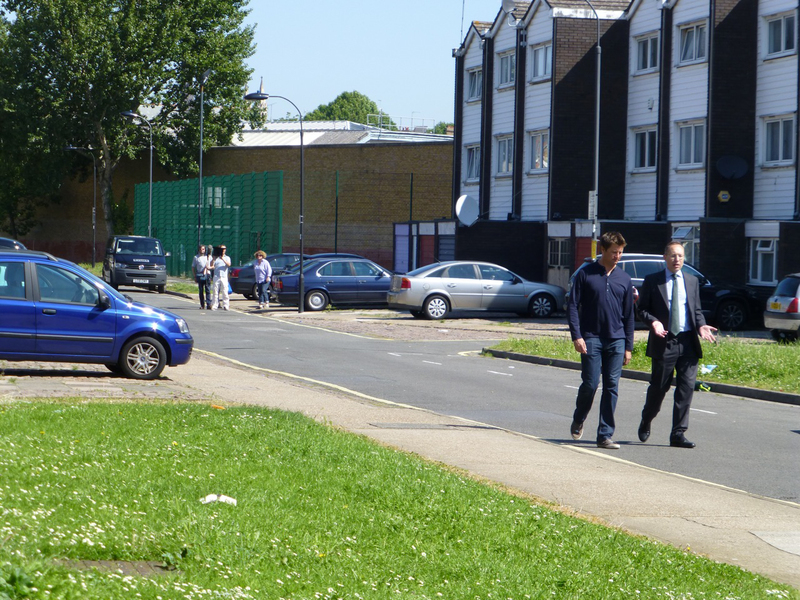 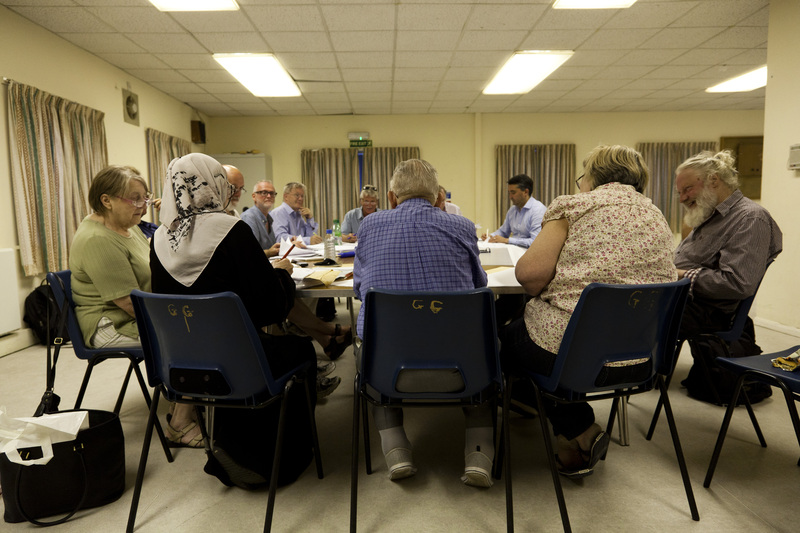 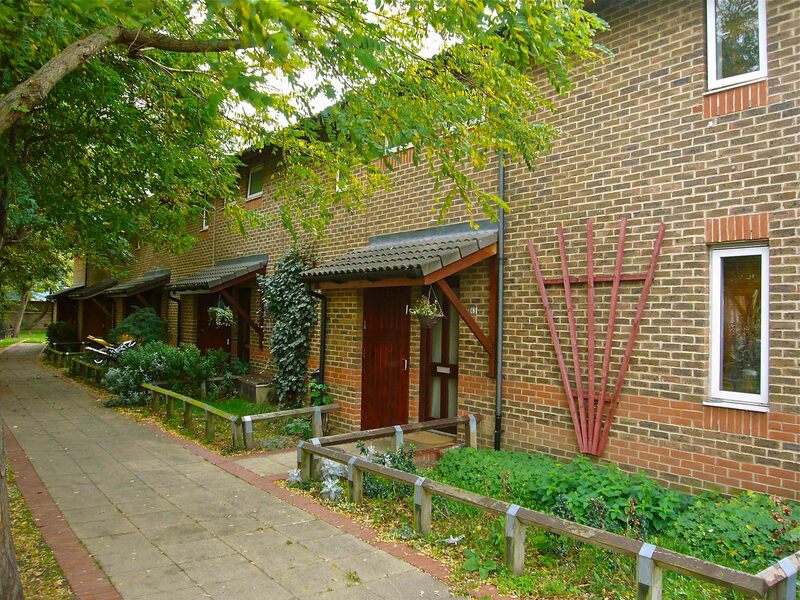 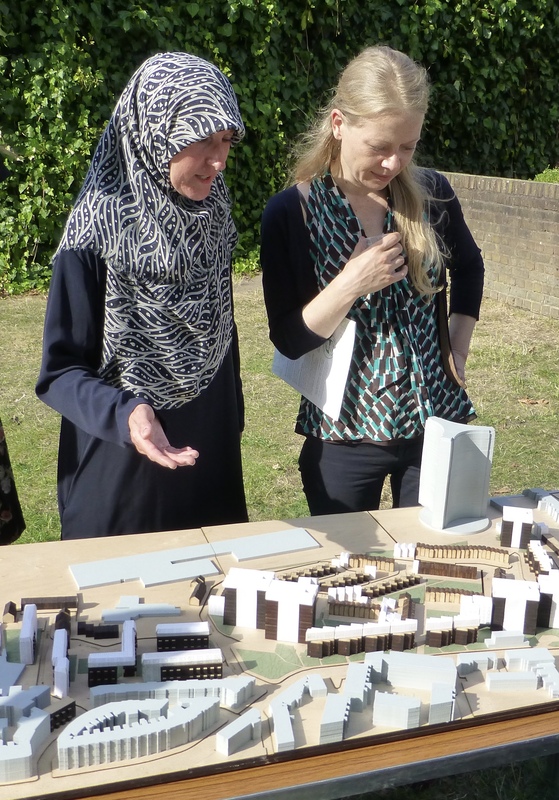 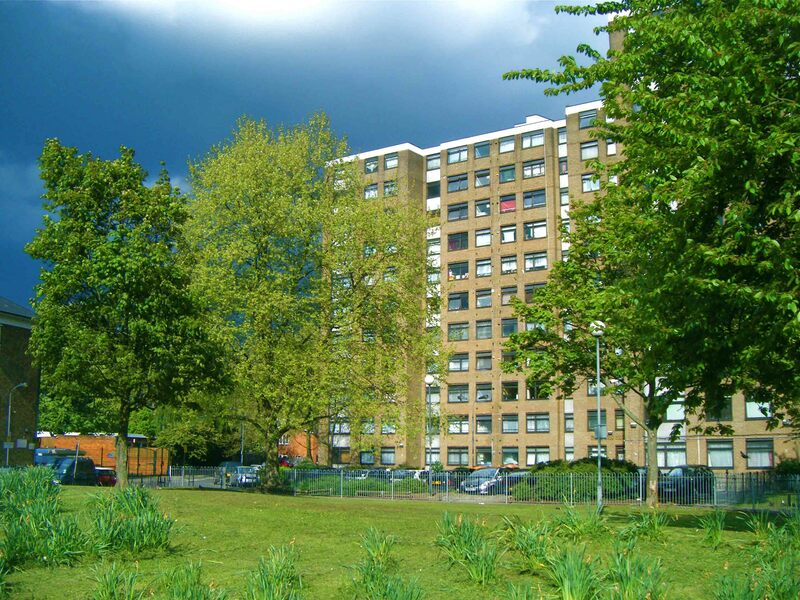 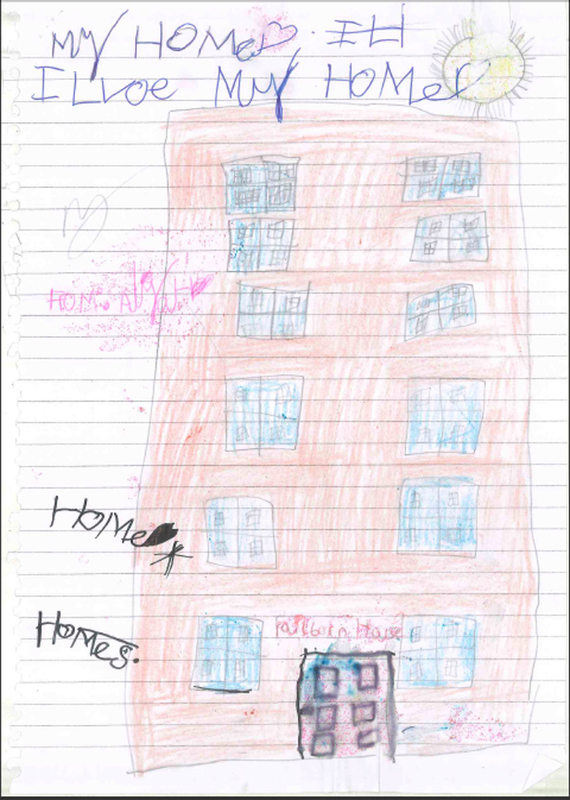 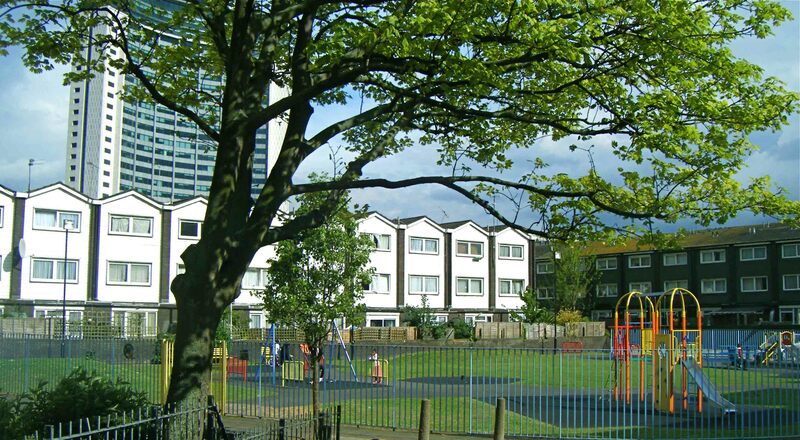 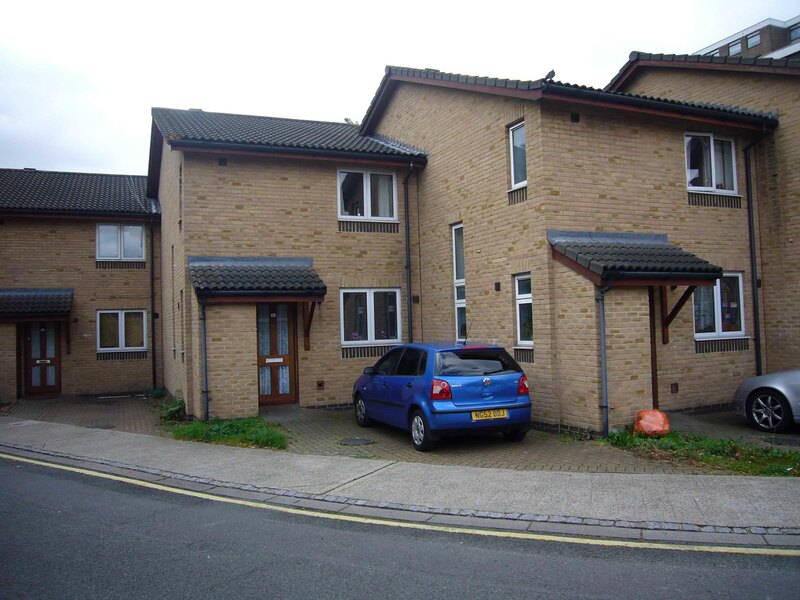 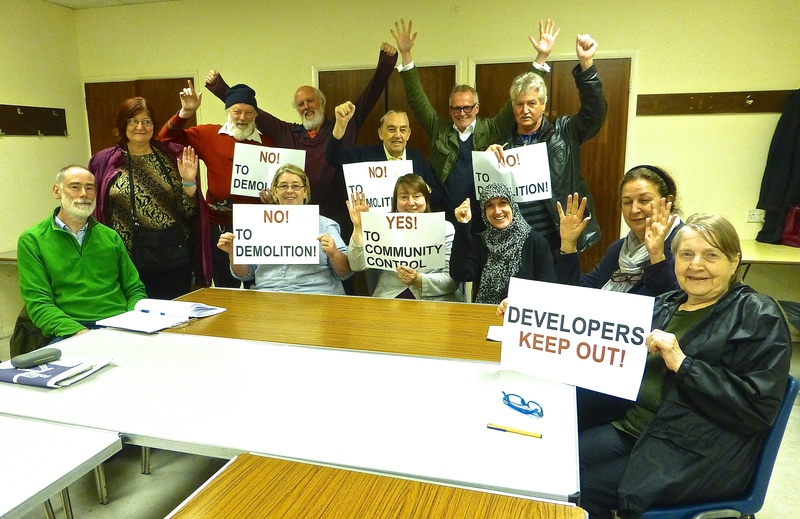 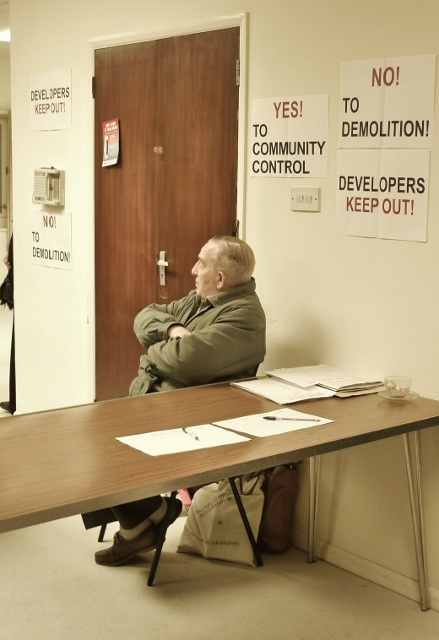 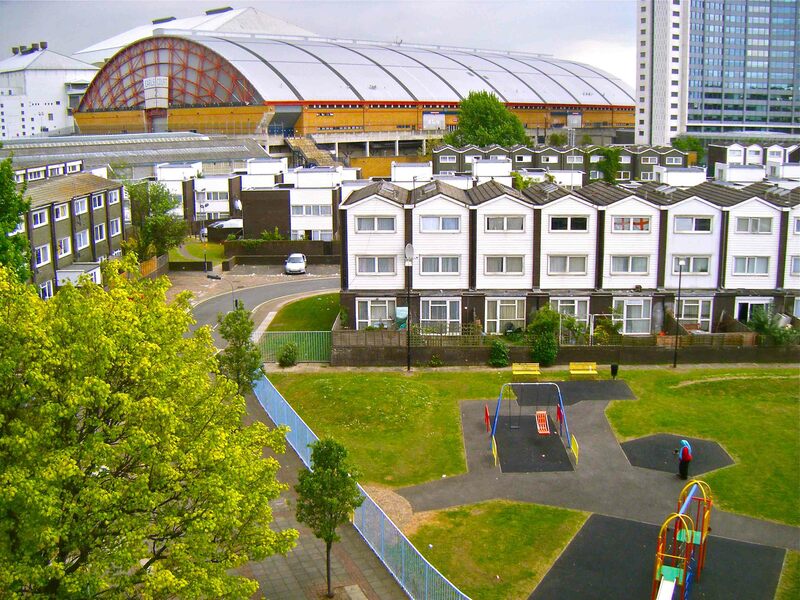 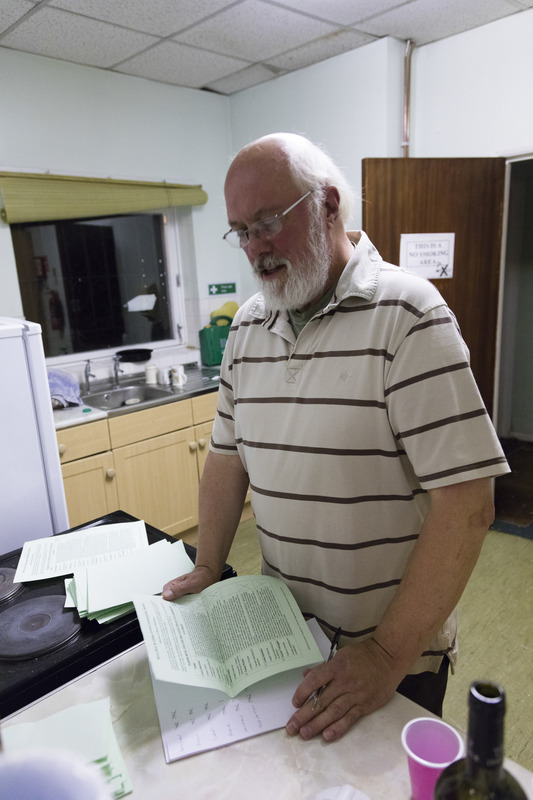 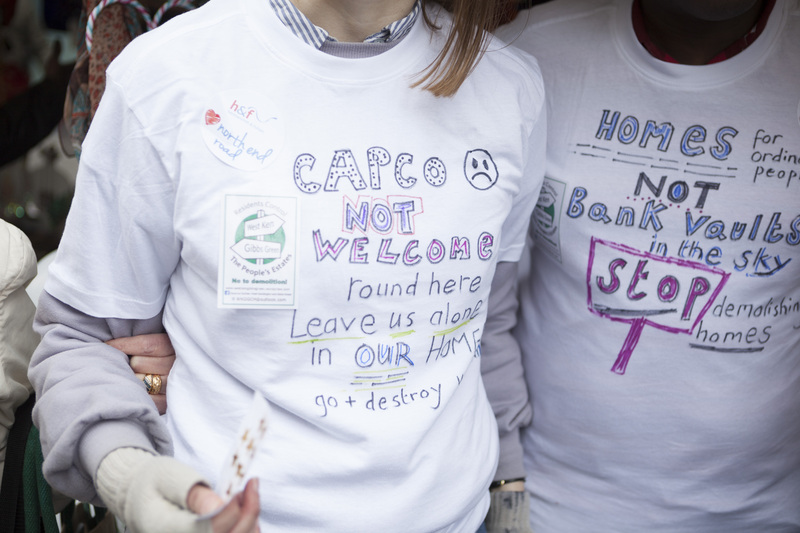 1 July 2014: At the General Meeting residents agreed to serve a Right to Transfer proposal notice to investigate the transfer of the estates to a community owned housing association. 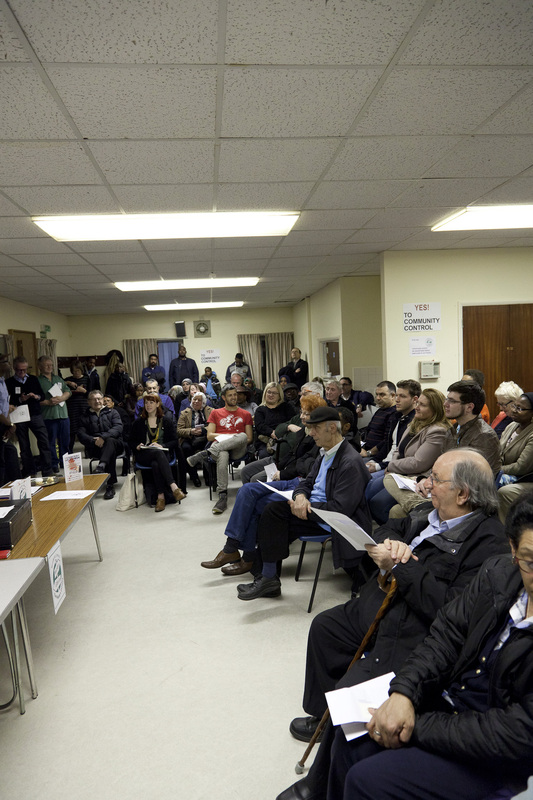 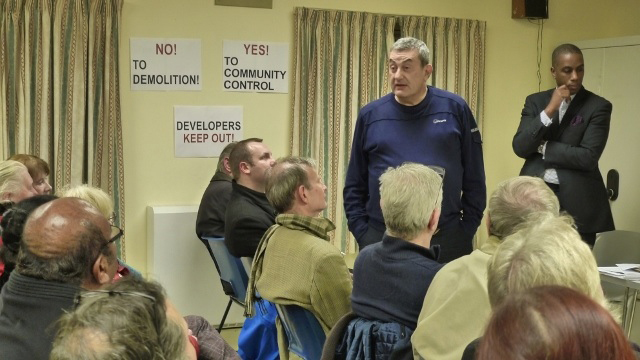 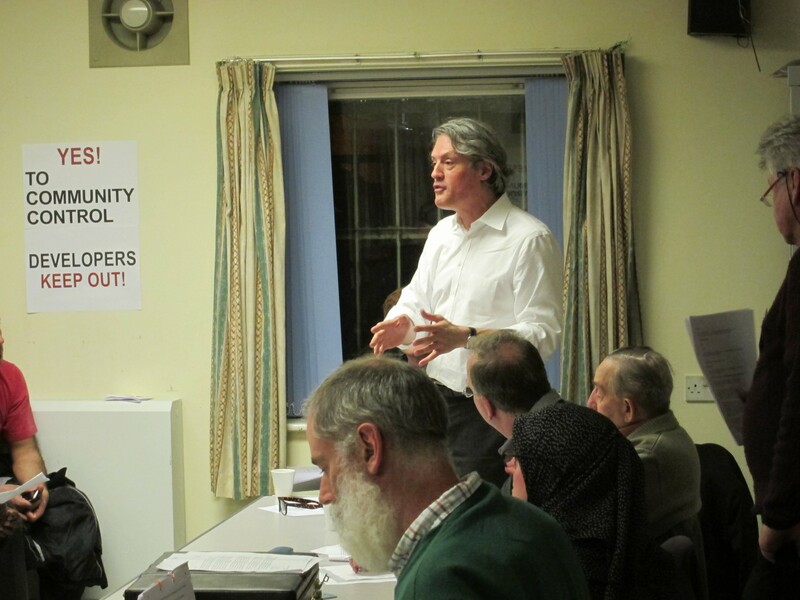 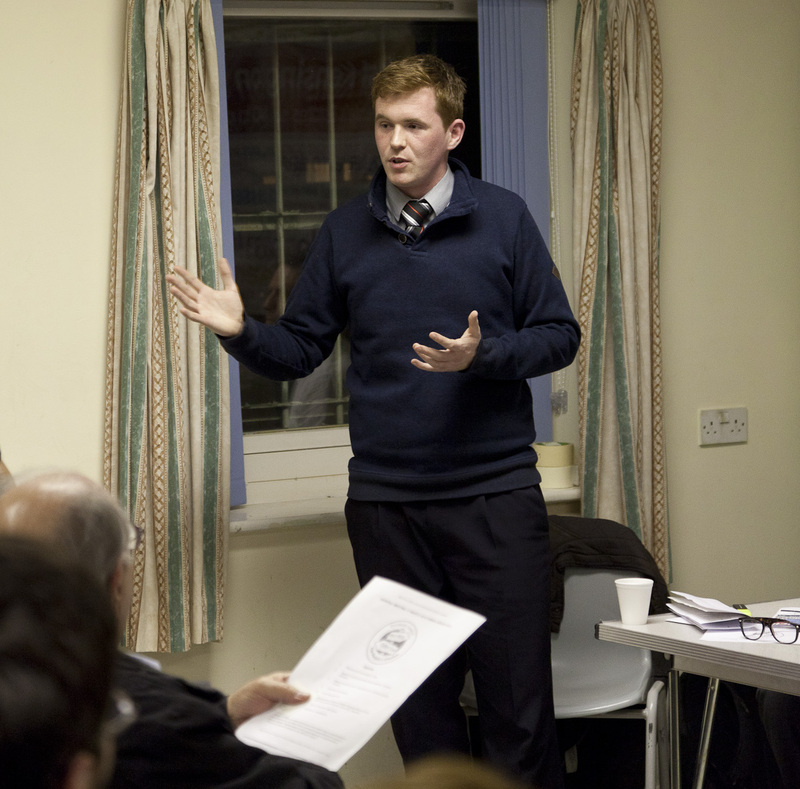 1 July 2014: Andy Slaughter MP address residents at their General Meeting. 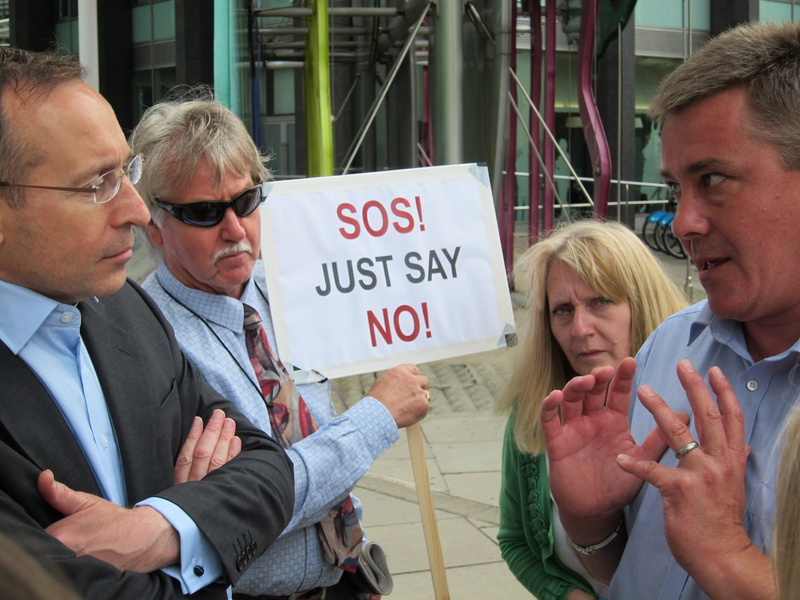 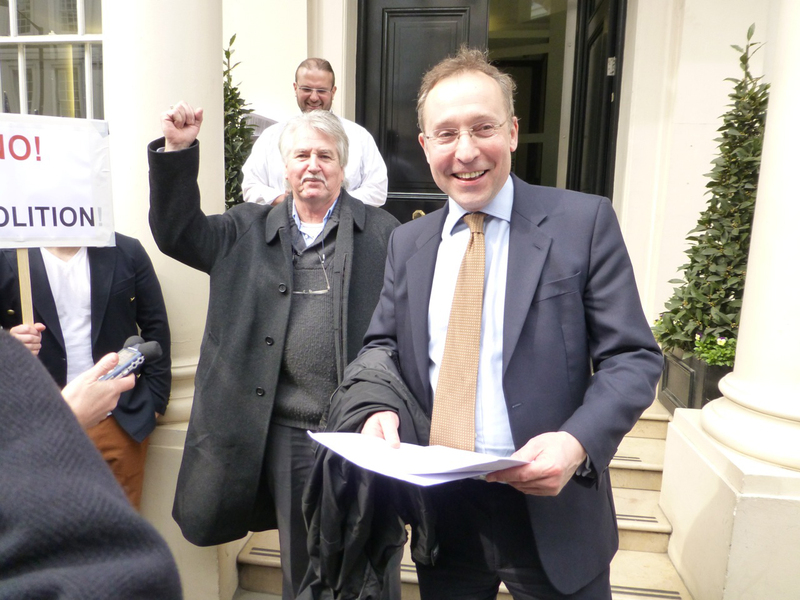 1 July 2014: WKGGCH Board member Lancelot Webb votes to serve a Right to Transfer proposal notice on the Council. 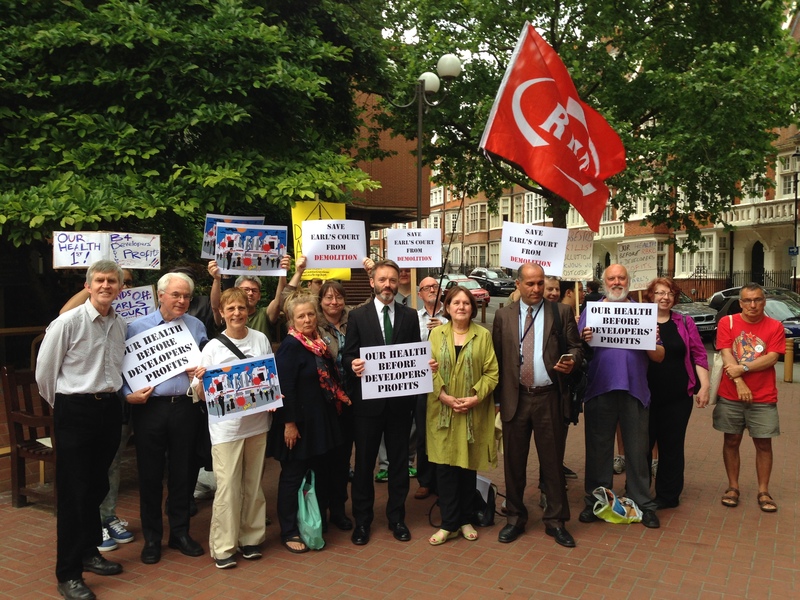 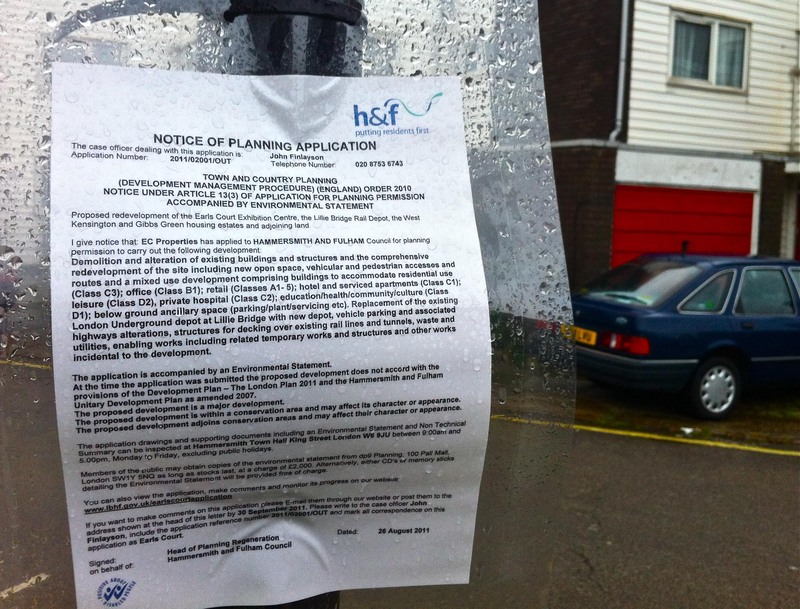 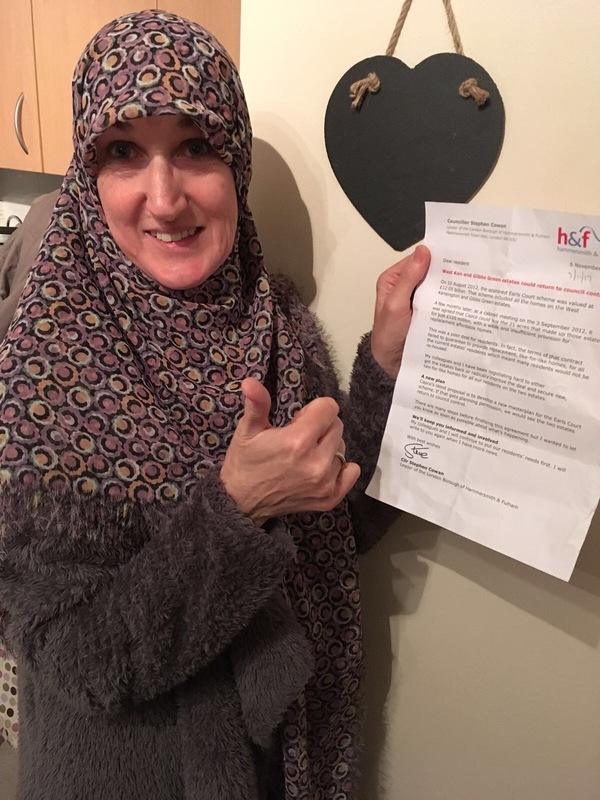 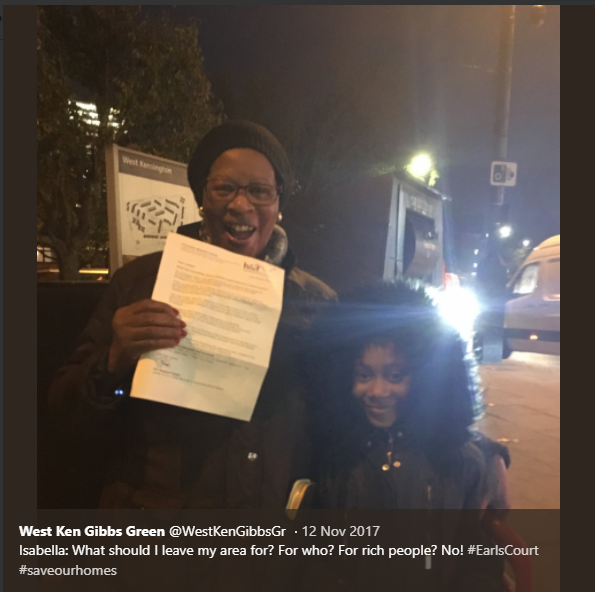 1 July 2014: Residents vote in favour of WKGGCH serving a Right to Transfer prtoposal notice on Hammersmith & Fulham Council. 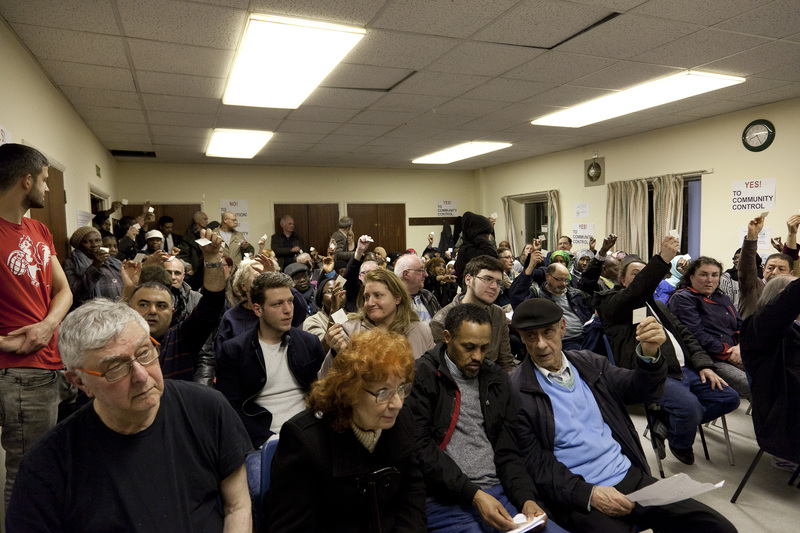 1 Jluy 2014: residents applaud the unanimous vote to serve a Right to Transfer proposal notice on the Council. 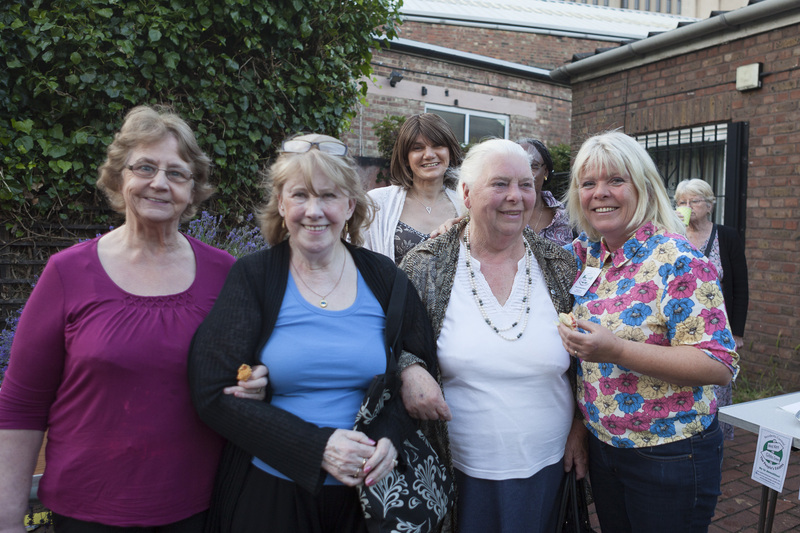 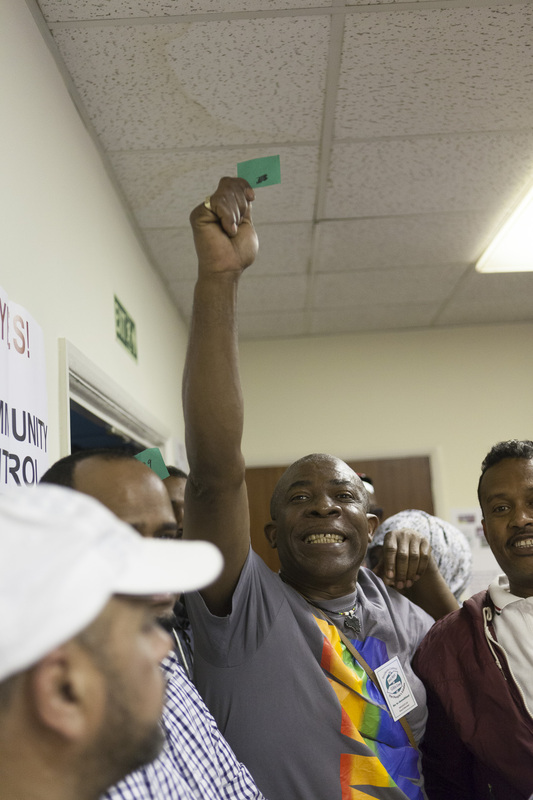 1 July 2014: After the General Meeting, residents are happy with the result. 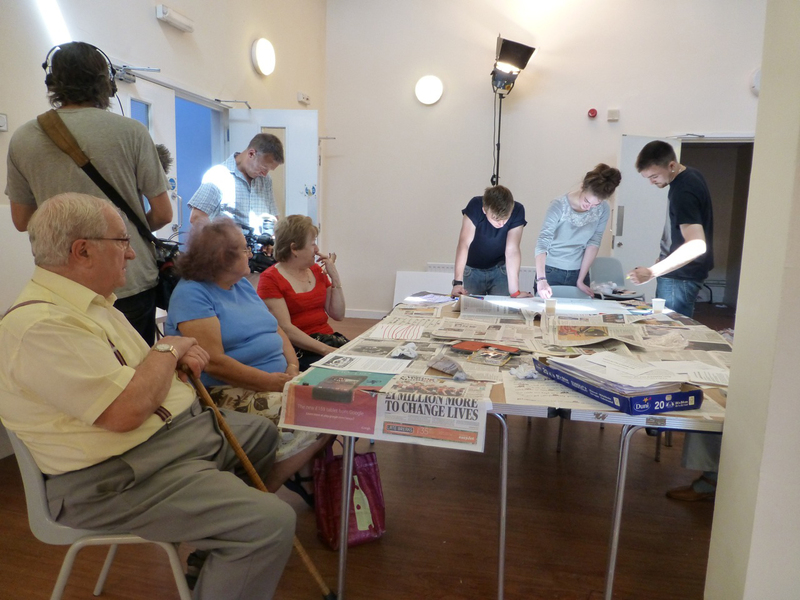 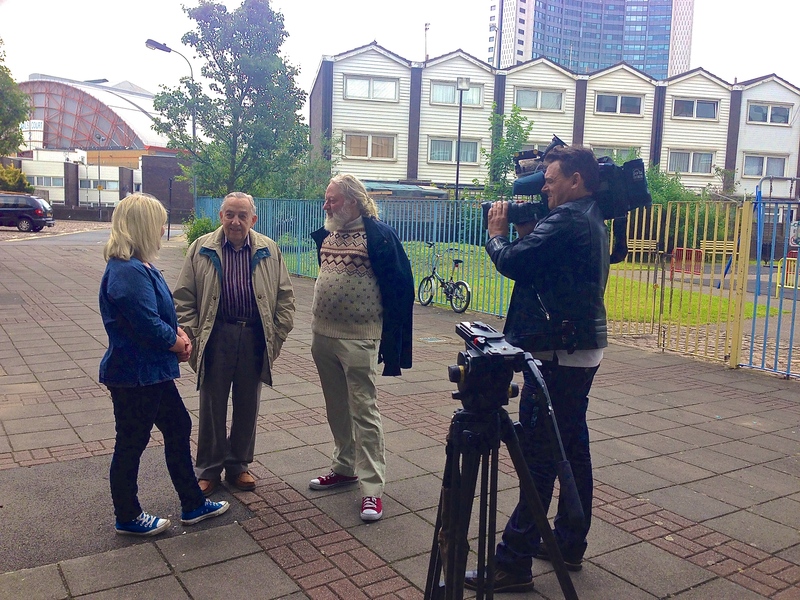 30 May 2014: Residents Sally Taylor, Charlie Treloggan and Harold Greatwood are interviewed by ITN about how they feel following the shock downfall of the Conservative administration. 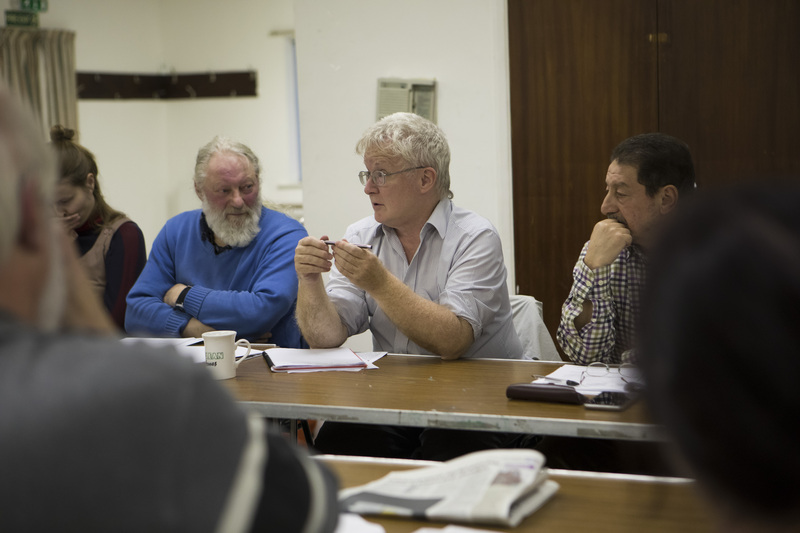 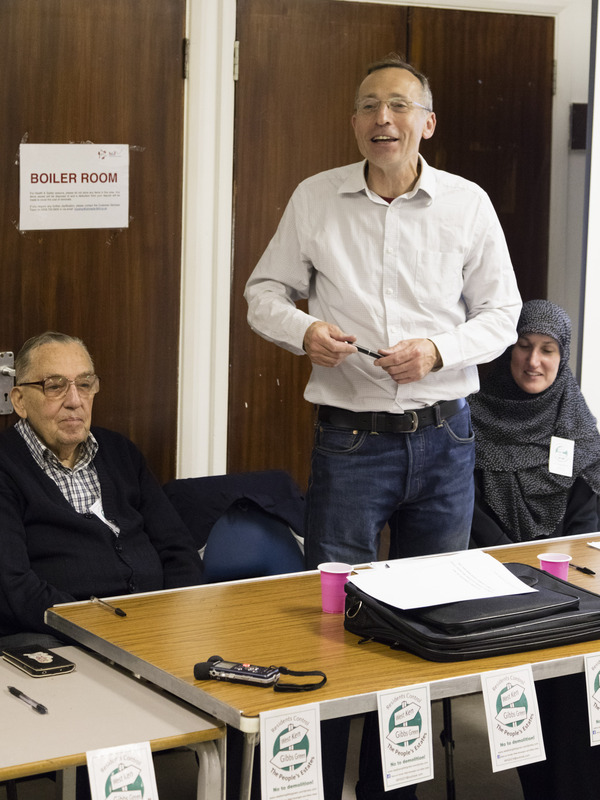 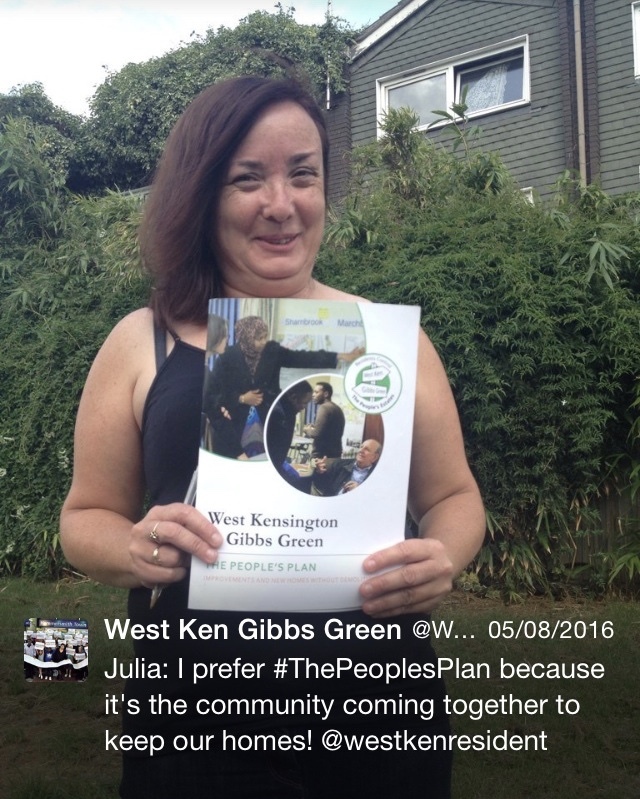 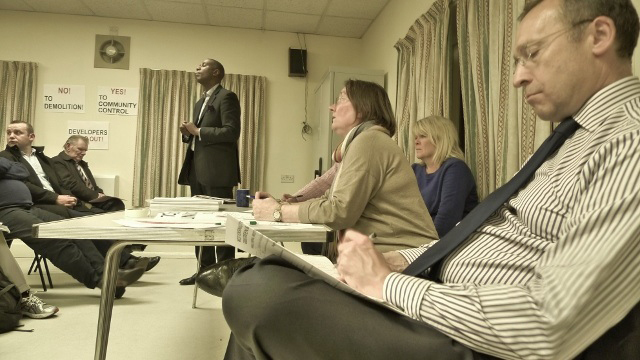 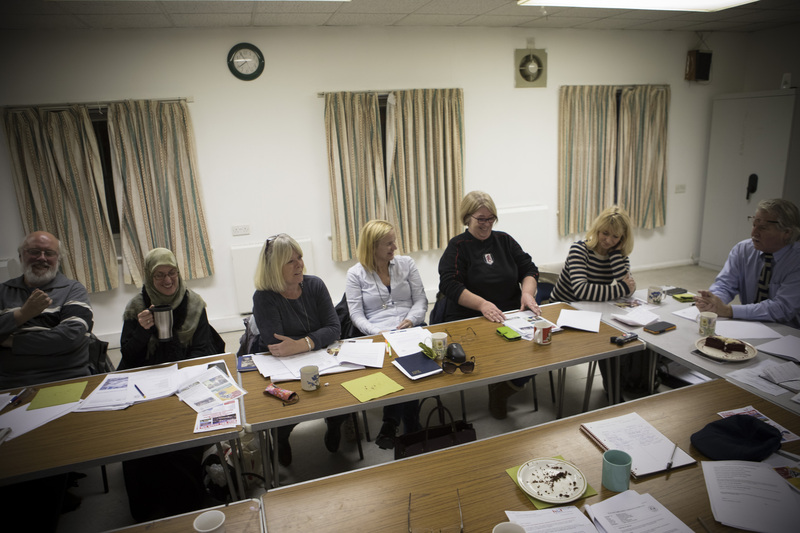 27 May 2014:West Ken Gibbs Green Board Members meet to discuss the implications of Labour winning control of the Council. 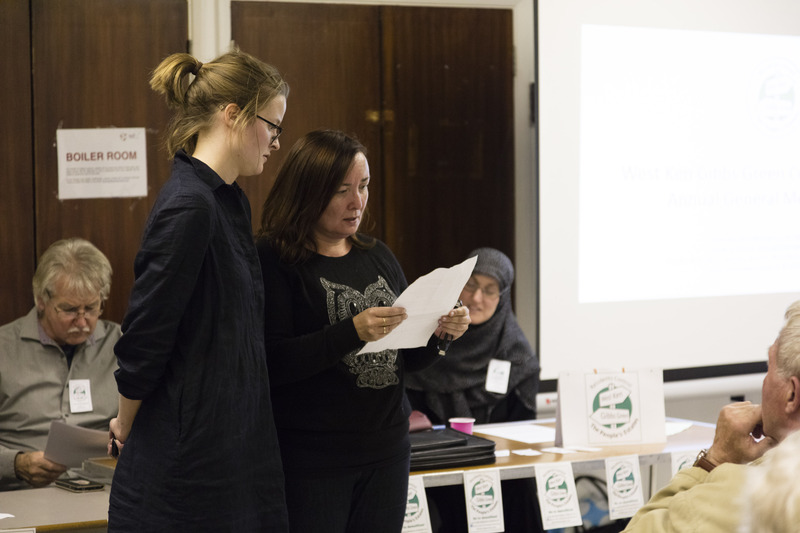 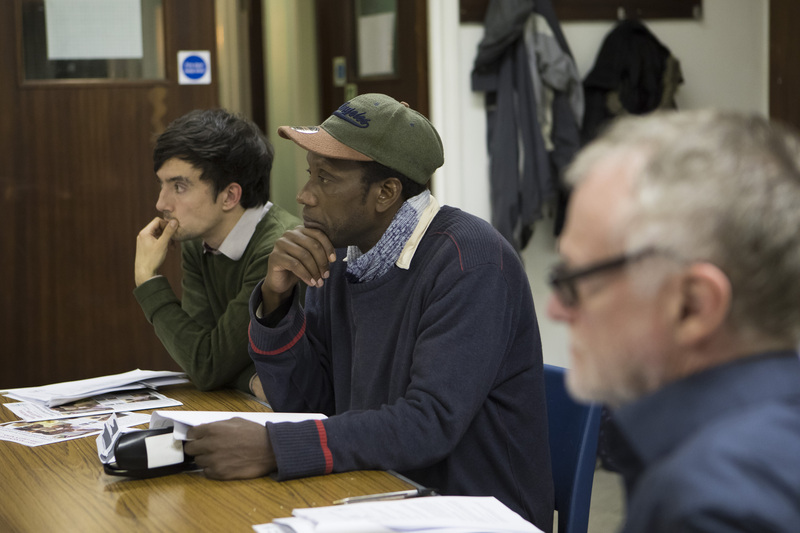 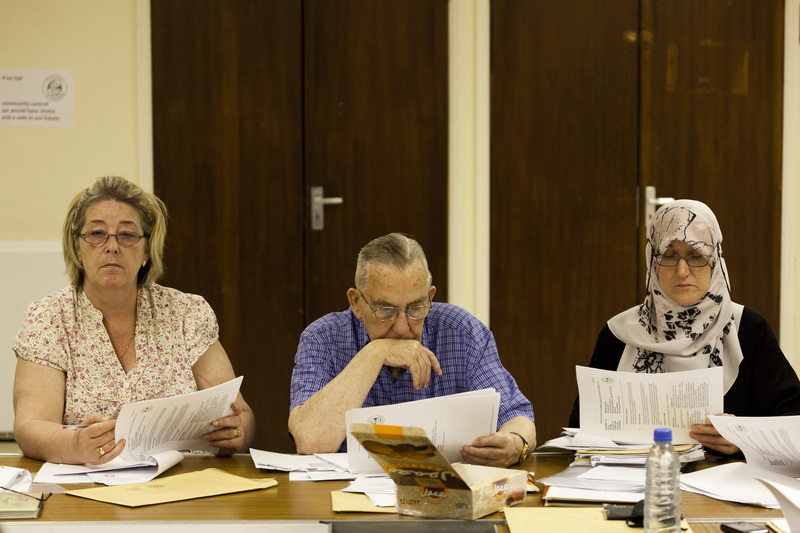 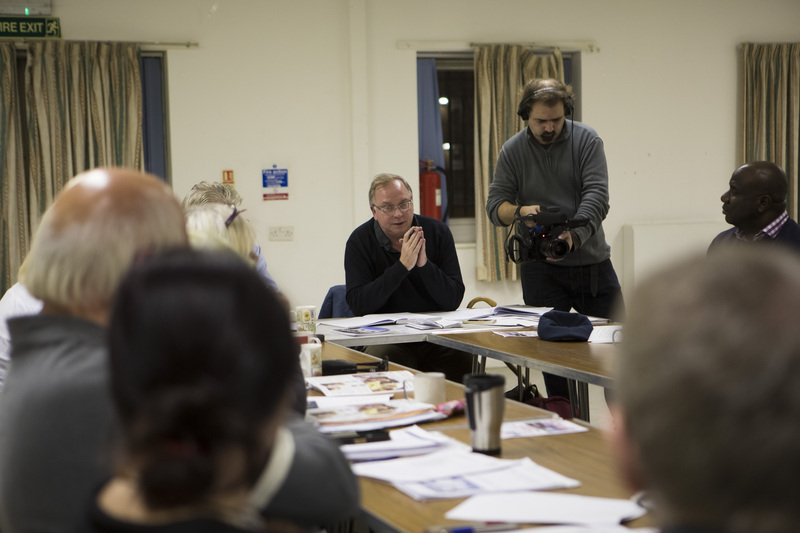 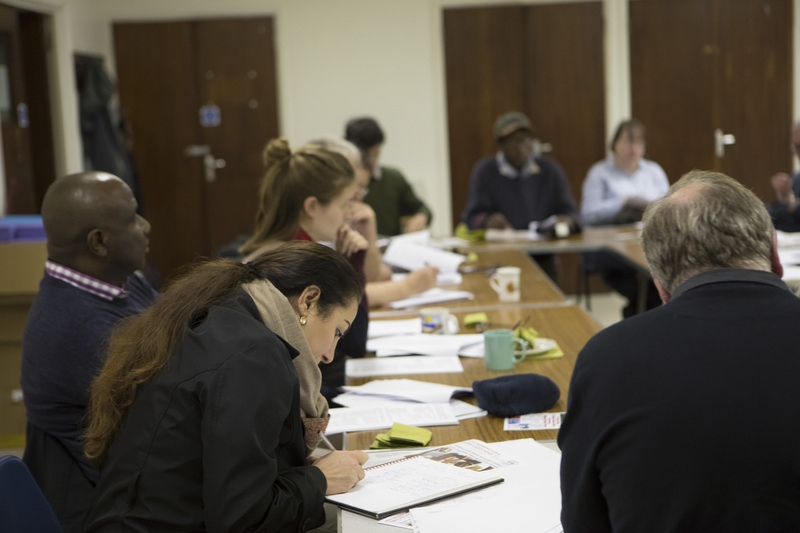 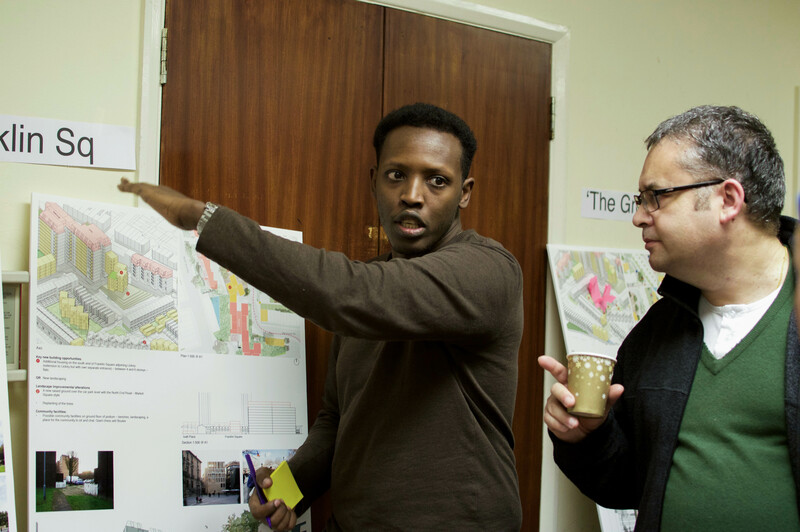 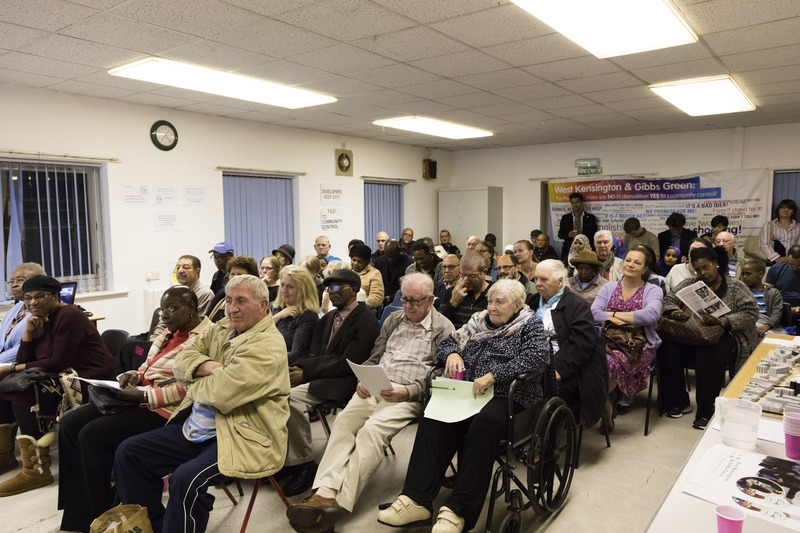 20 May 2014: West Ken Gibbs Green Community Homes Board Members attend a training session in the Gibbs Green Hall. 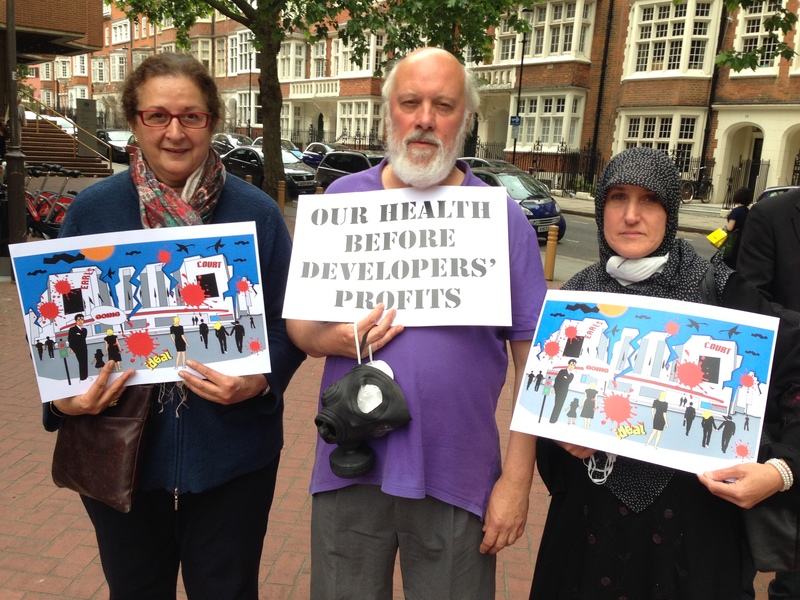 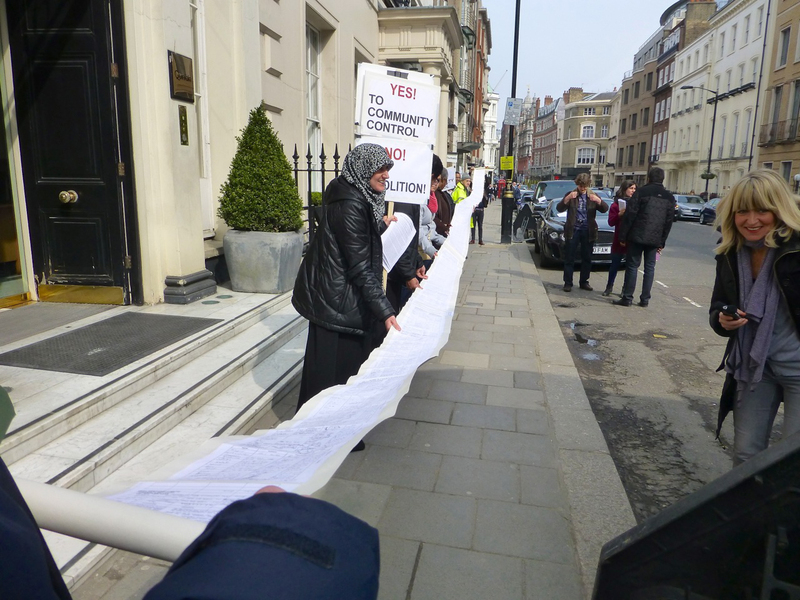 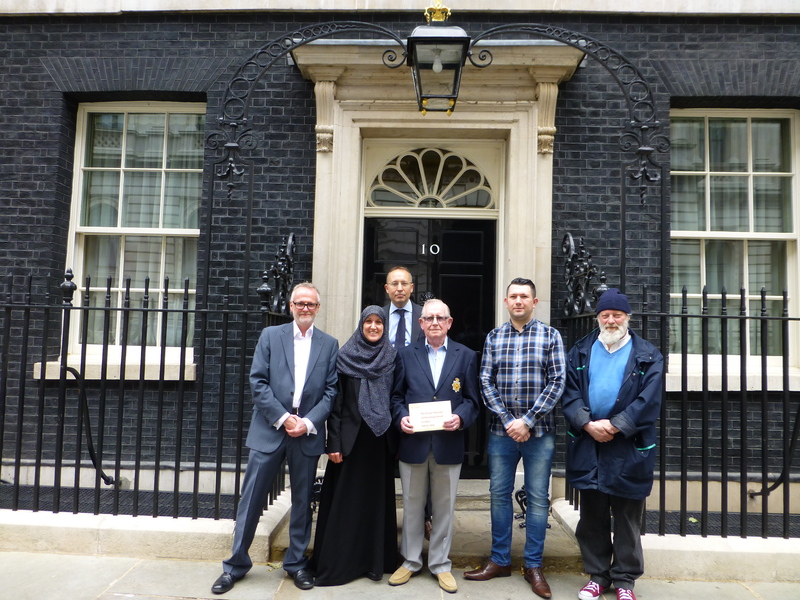 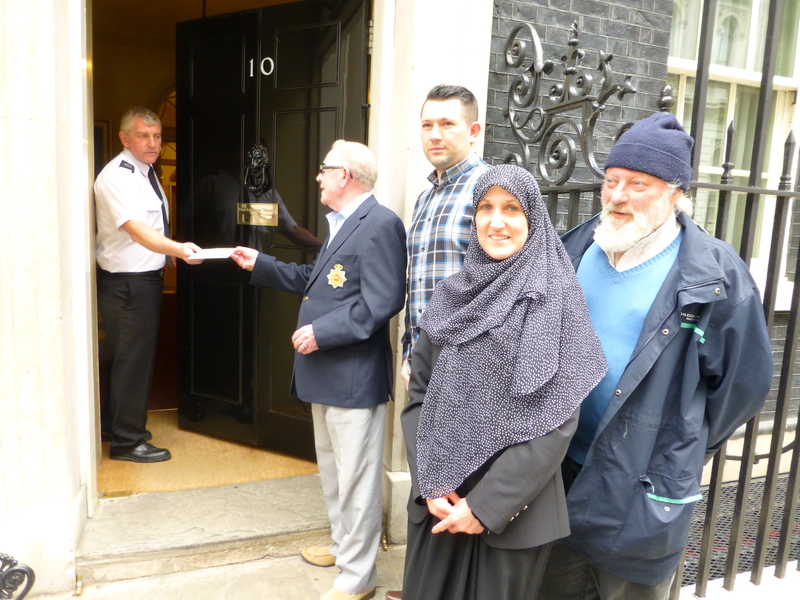 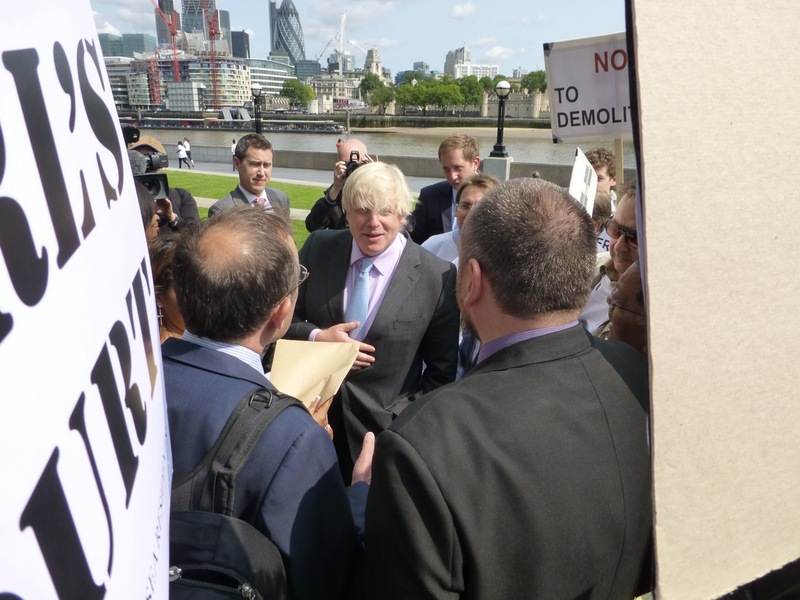 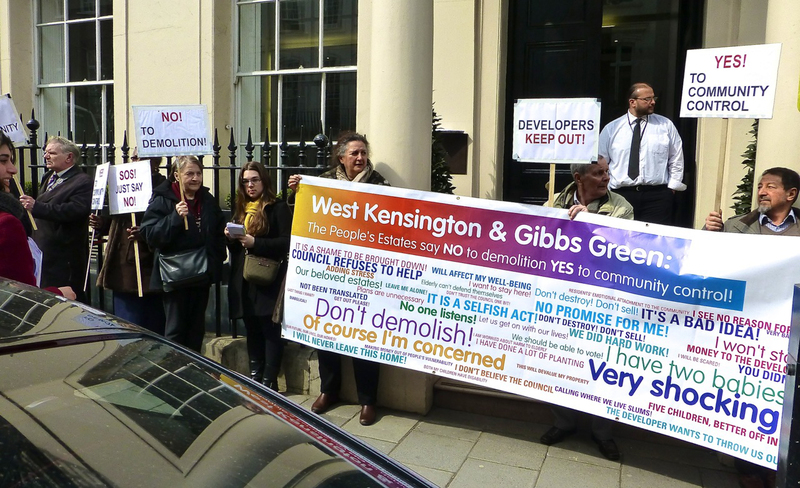 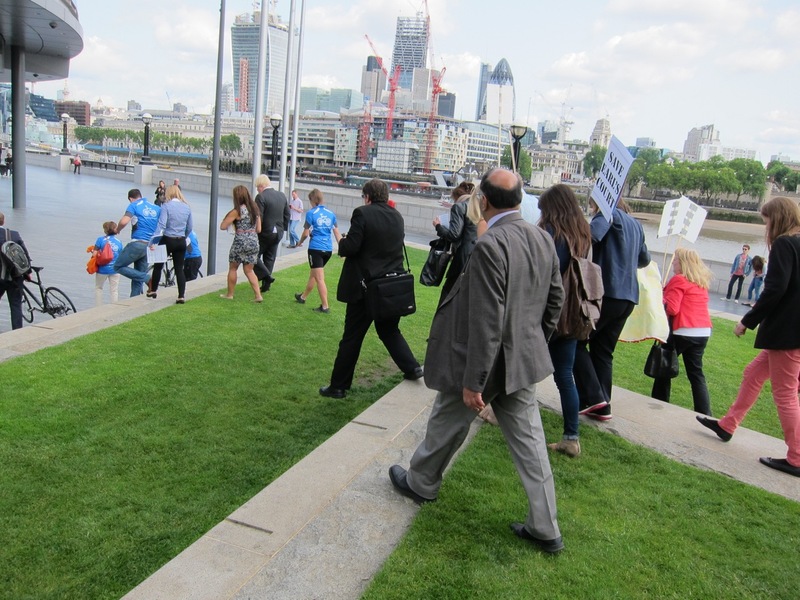 20 May 2014: Residents and supporters go to Downing Street with local MP Andy Slaughter to deliver letter from senior residents asking the Prime Minister to intervene to stop the demolition of their homes. 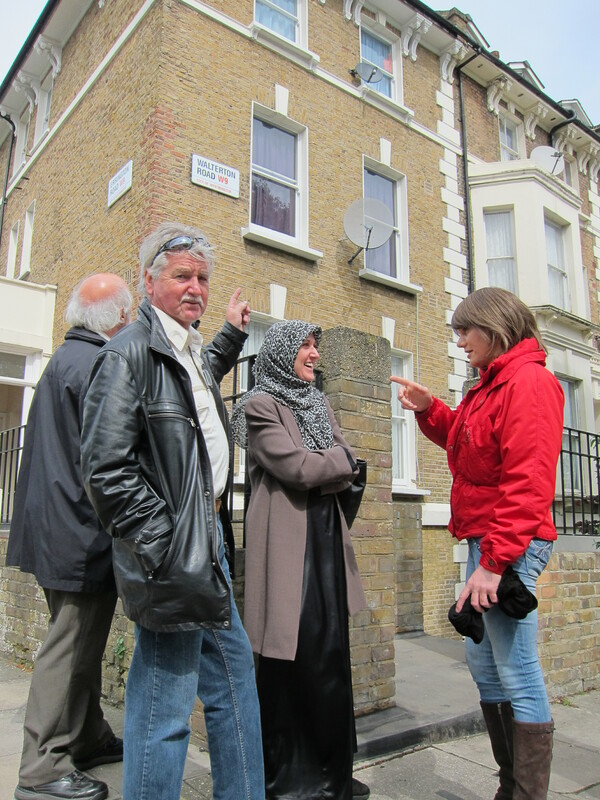 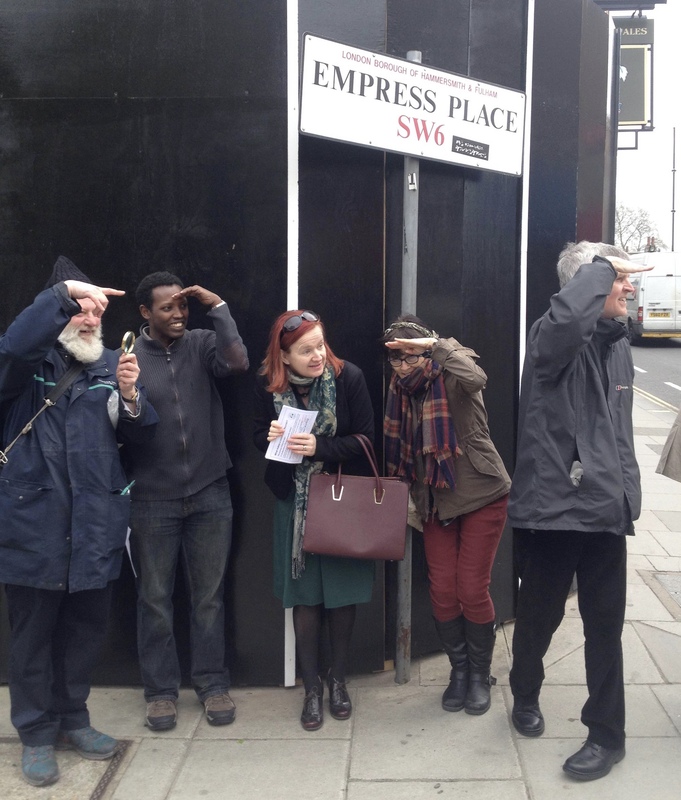 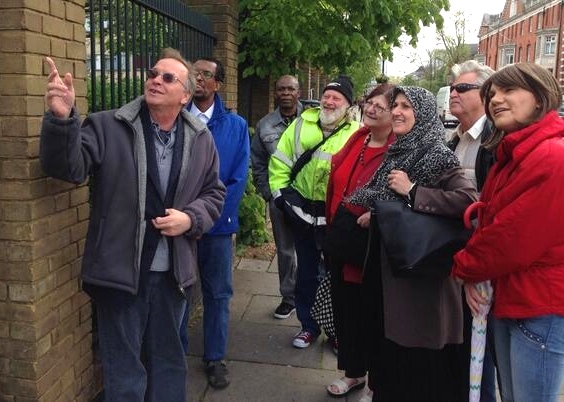 26 April 2014: West Ken Gibbs Green Community Homes Board Members on a study visit to Walterton & Elgin Community Homes, a community owned resident controlled housing association in London W9. 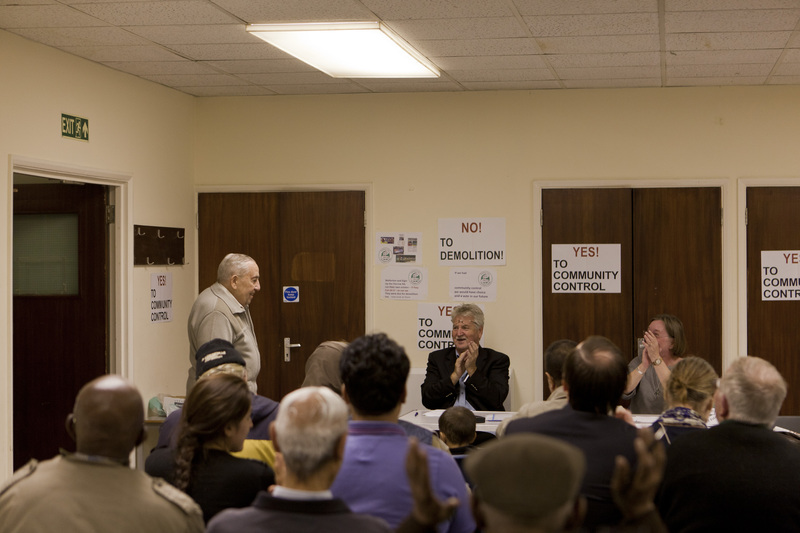 Community Organiser, Jonathan Rosenberg on the left points out the mural which conveys the historical background of the project. 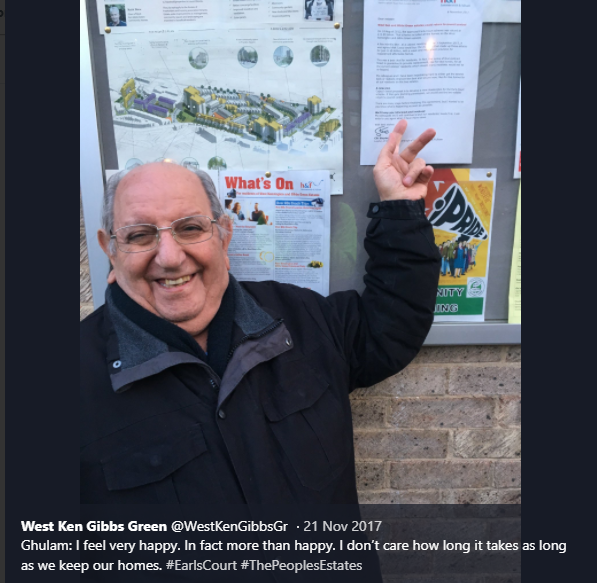 26 April 2014: Keith Drew, Chair of West Ken Gibbs Green Community Homes with other Board Members on the study visit to Walterton & Elgin Community Homes. 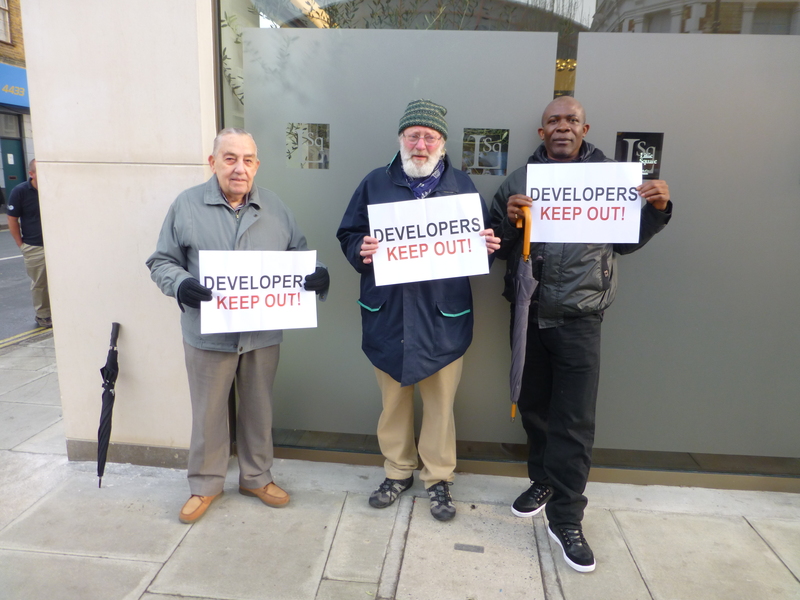 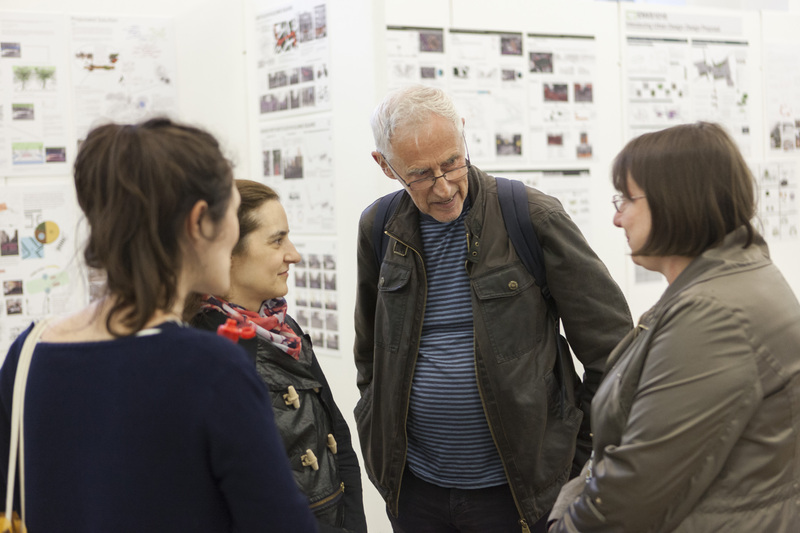 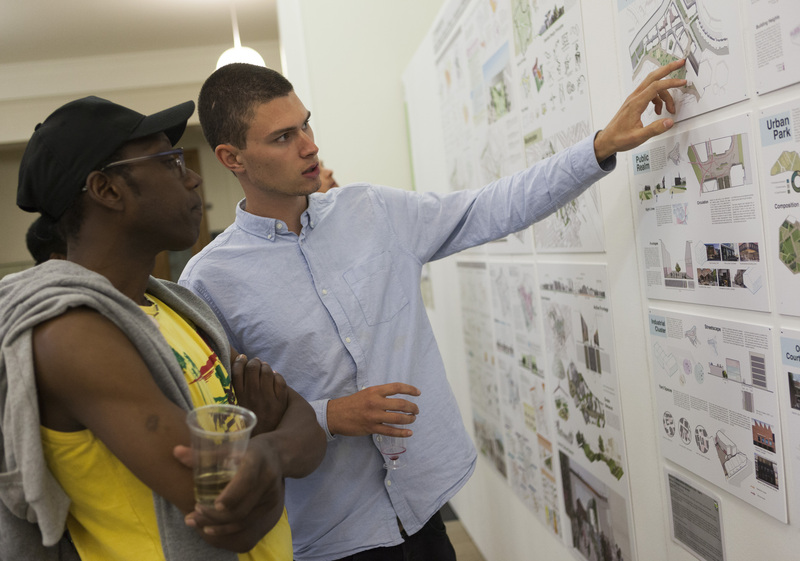 27 March 2014: Left to right: West Kensington estate tenants Charlie Treloggan, Harold Greatwood and Lancelot Webb at the opening of the marketing suite for Capco’s ‘Lillie Square’ development. 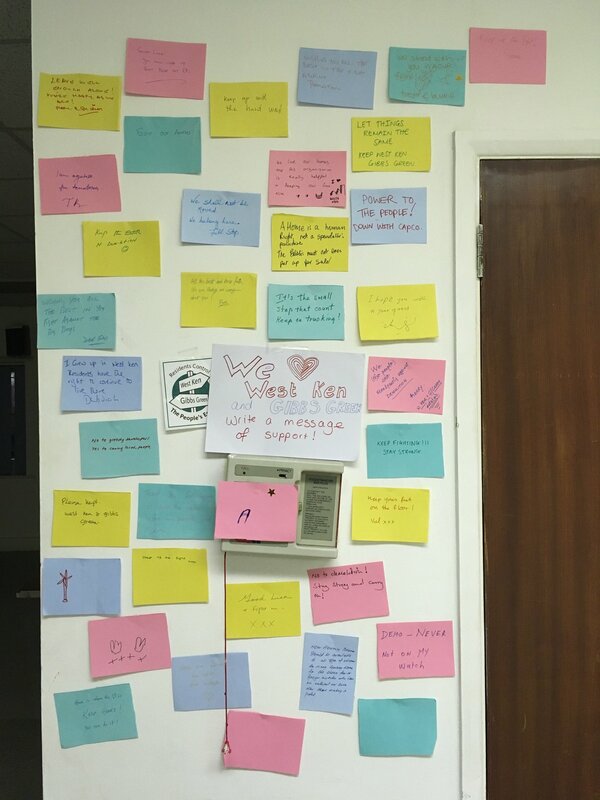 The next day it launched its sales operation in Hong Kong. 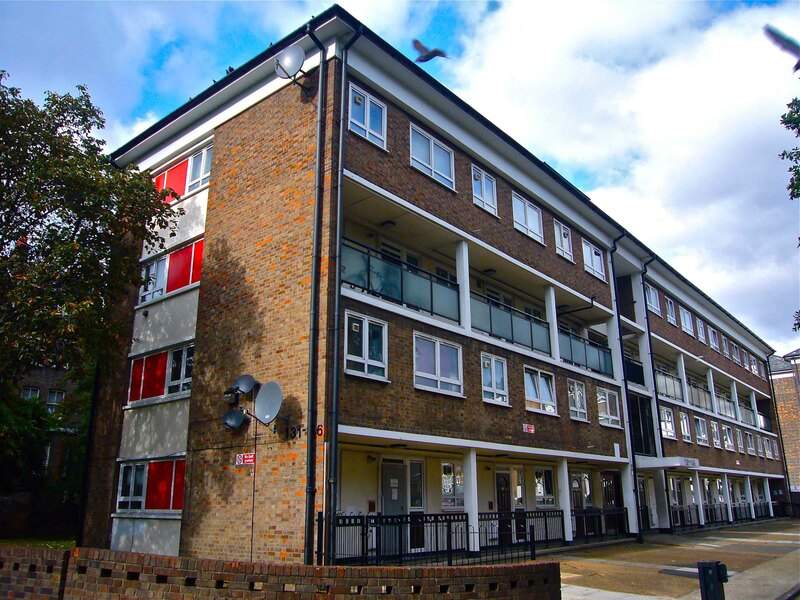 Prices for one bedroom flats start at £600,000. 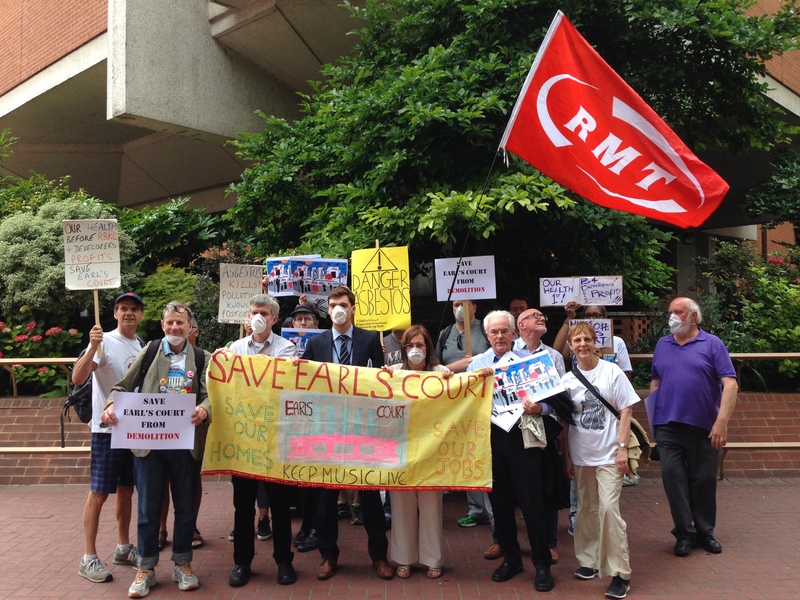 Prospective buyers queuing outside were handed Save Earl’s Court leaflets. 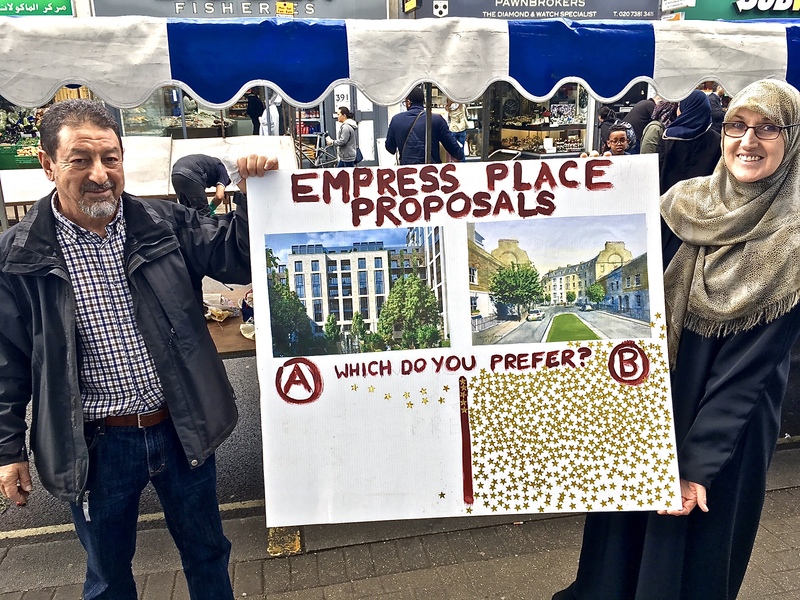 They were surprised to hear that the whole area would be a construction site for 20 years and that 7,000 more flats would be crammed into their surroundings. 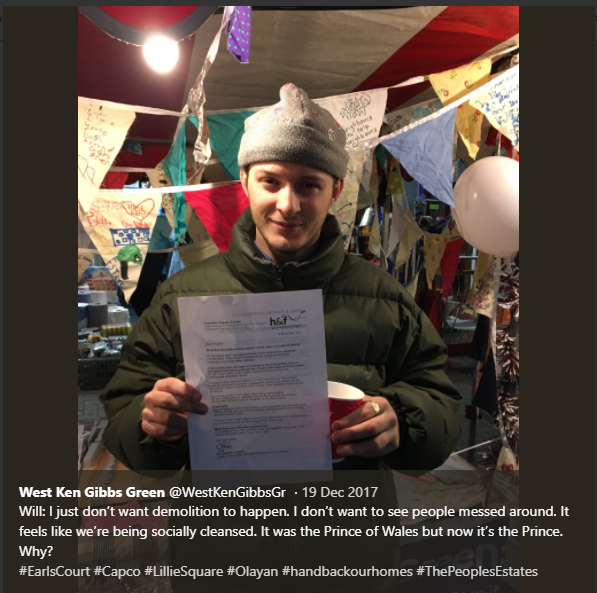 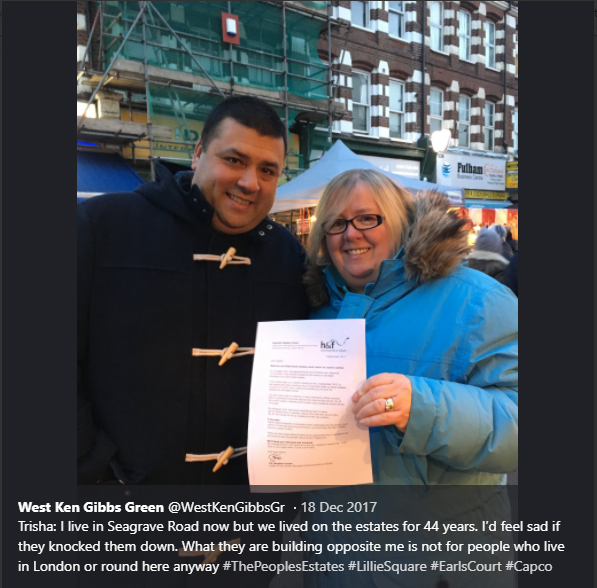 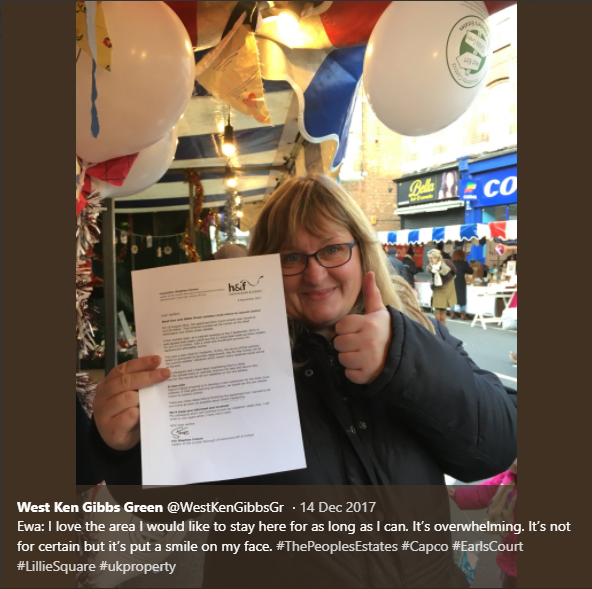 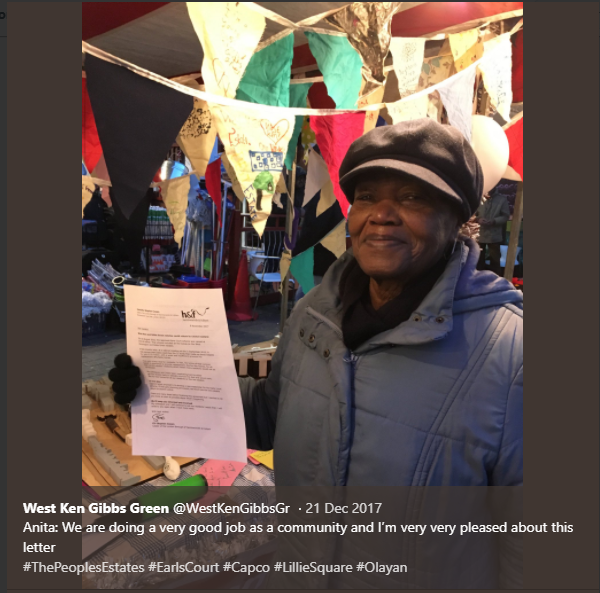 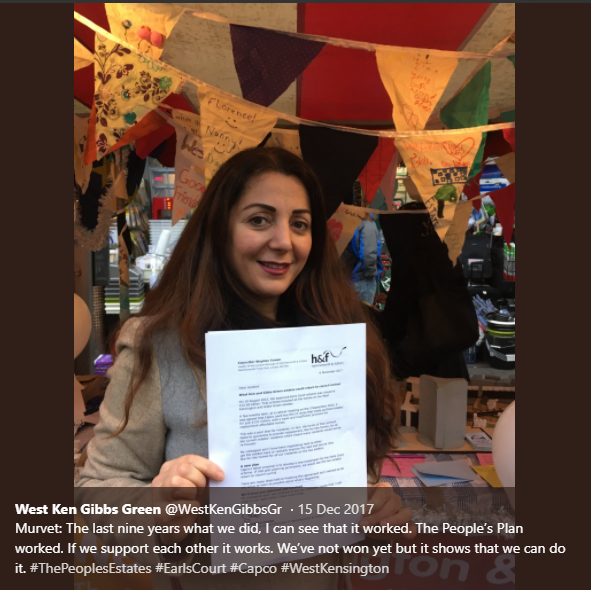 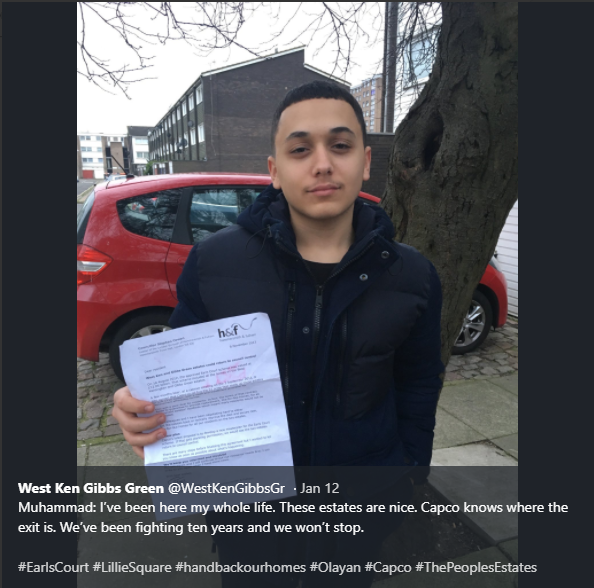 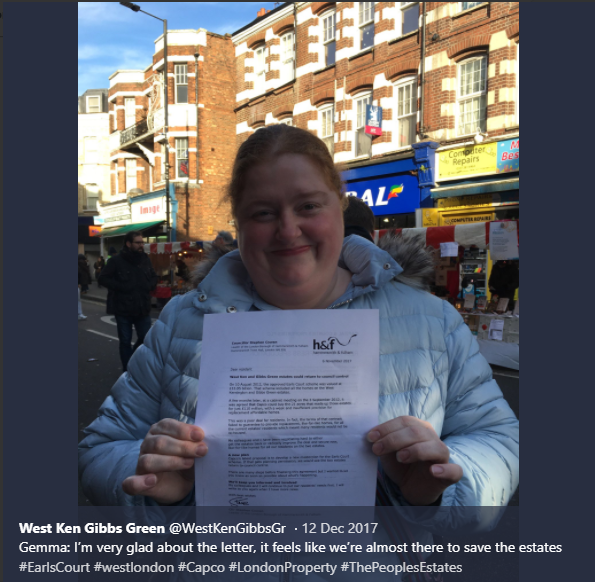 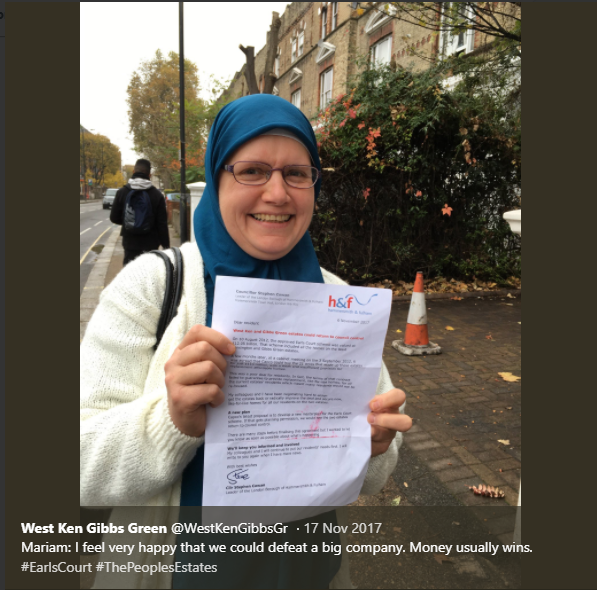 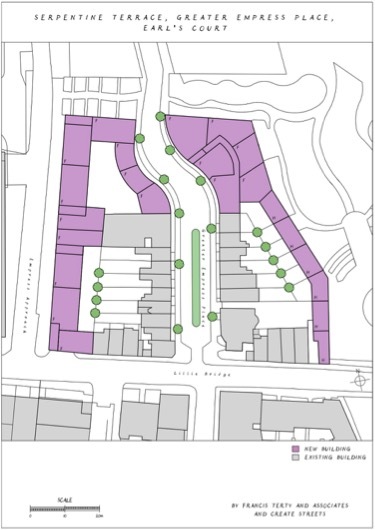 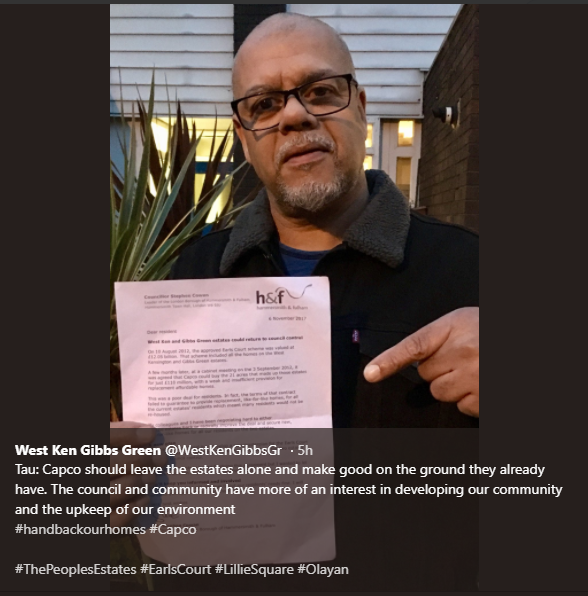 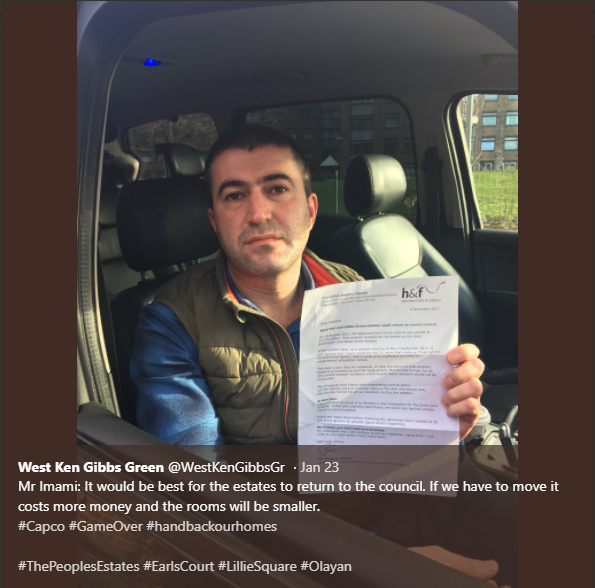 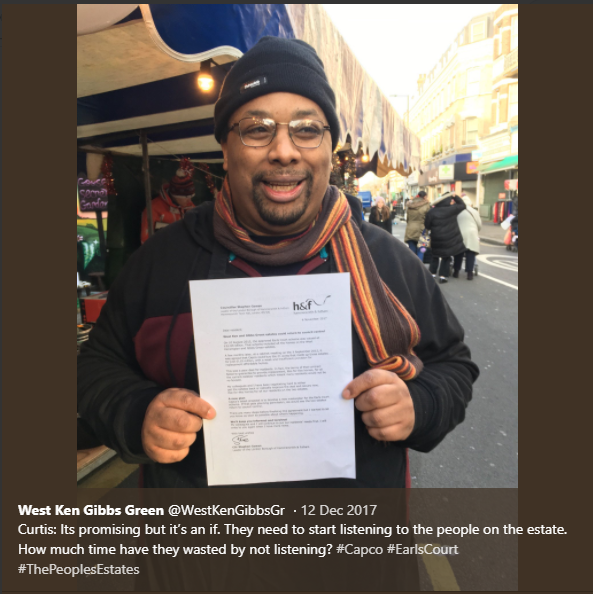 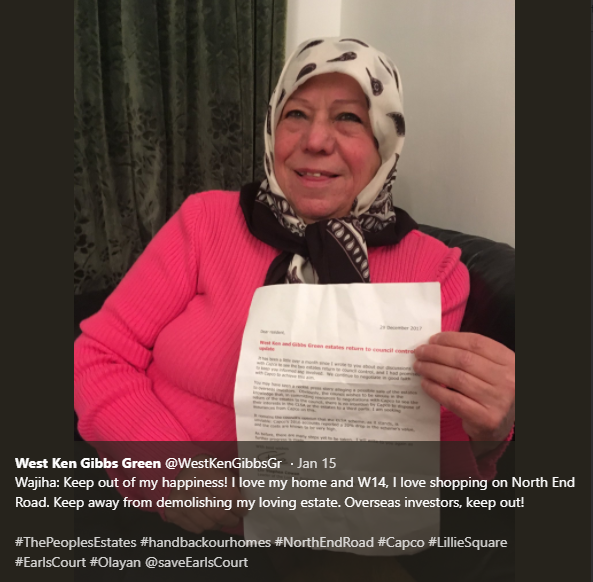 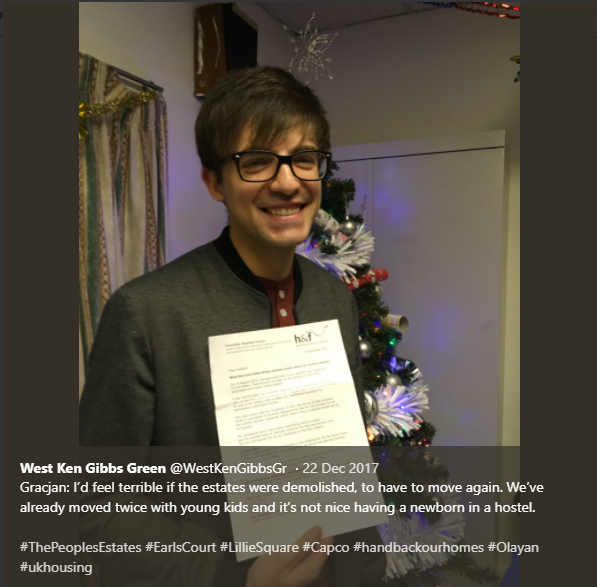 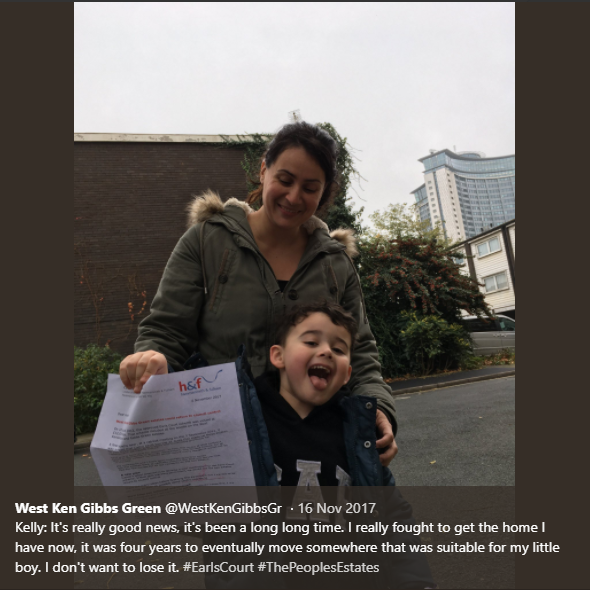 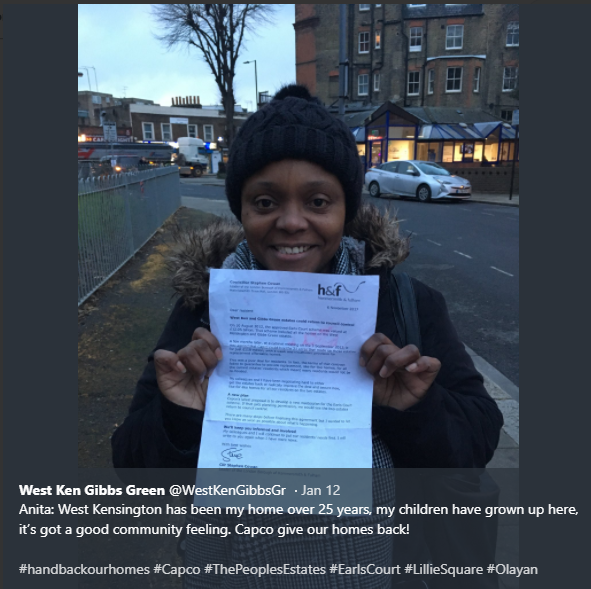 Some were alarmed to discover that 200 of the 800 flats in Lillie Square would be let to council tenants displaced from the West Kensington & Gibbs Green estates. 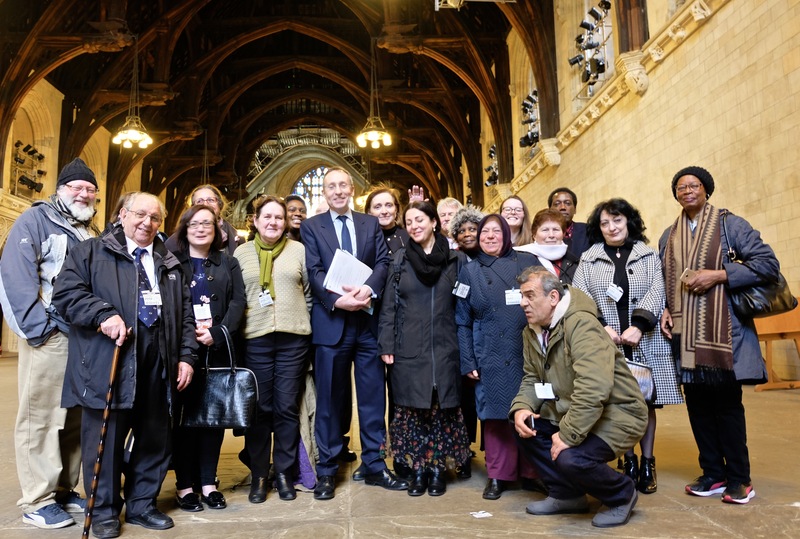 21 January 2014: WKGGCH Board Members and Earl’s Court Area Action Group members attend Parliamentary debate in Westminster Hall on the cultural and economic case for preserving the Earl’s Court Exhibition Centres. 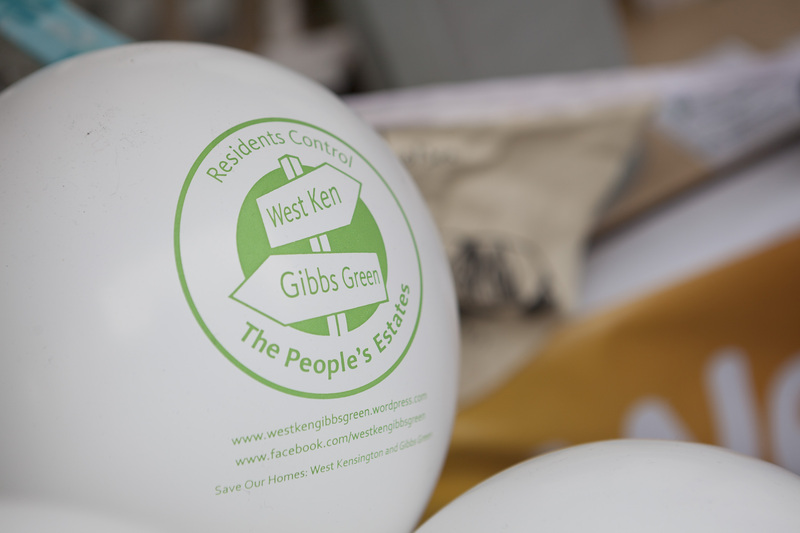 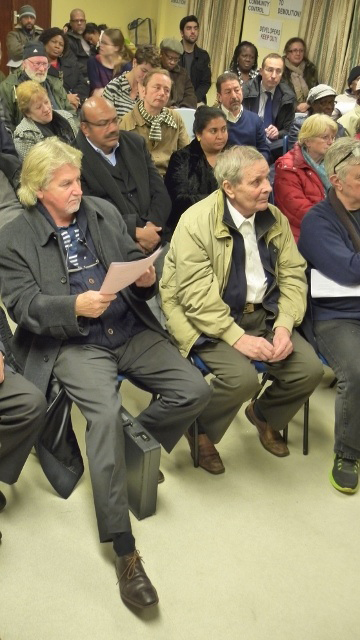 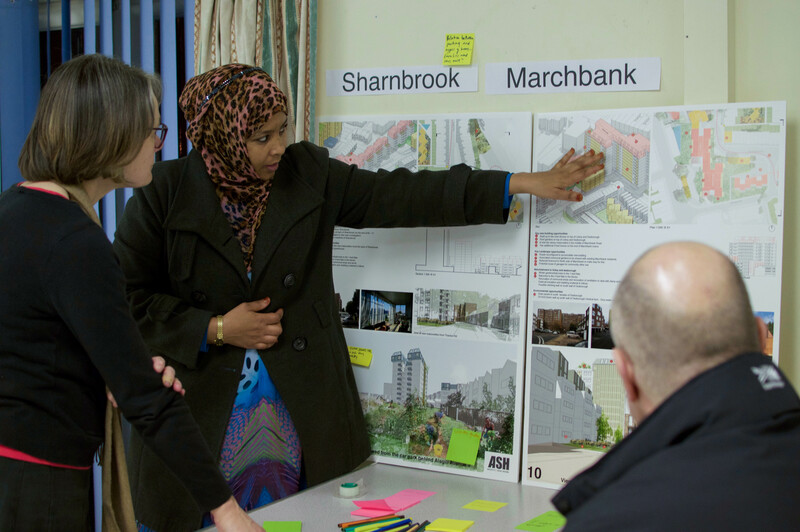 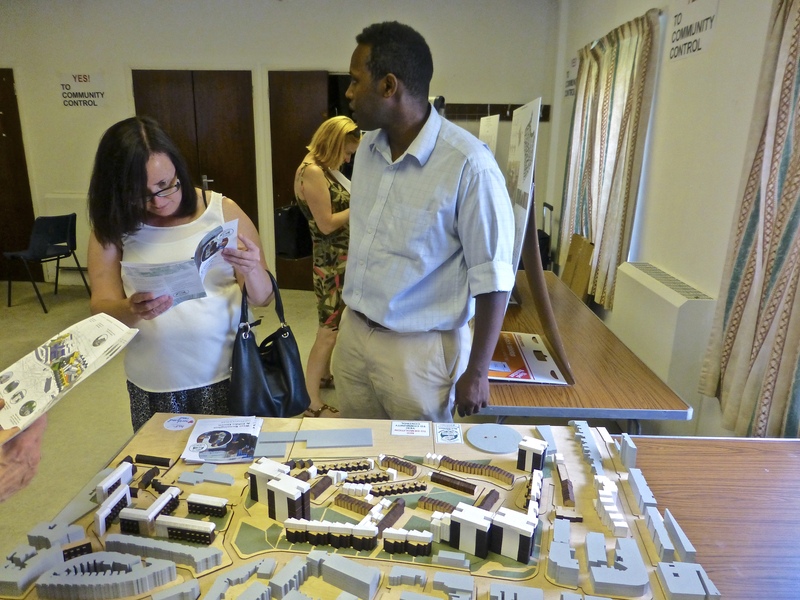 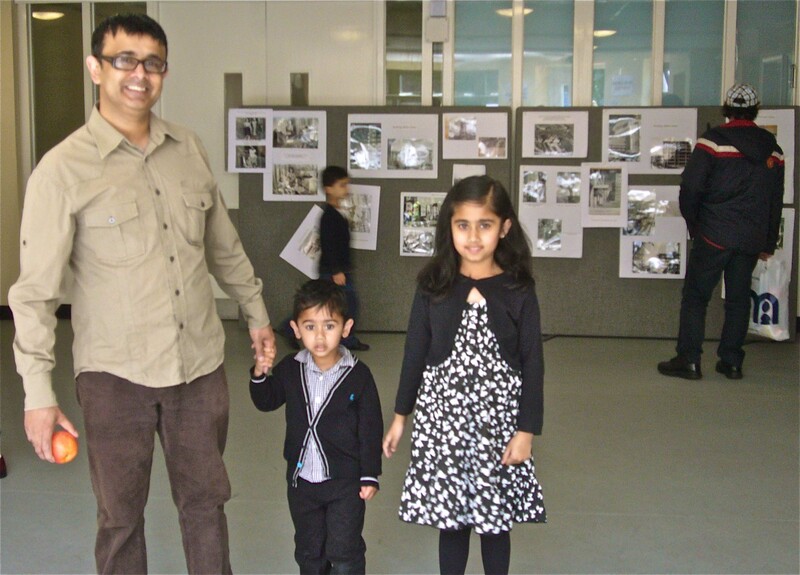 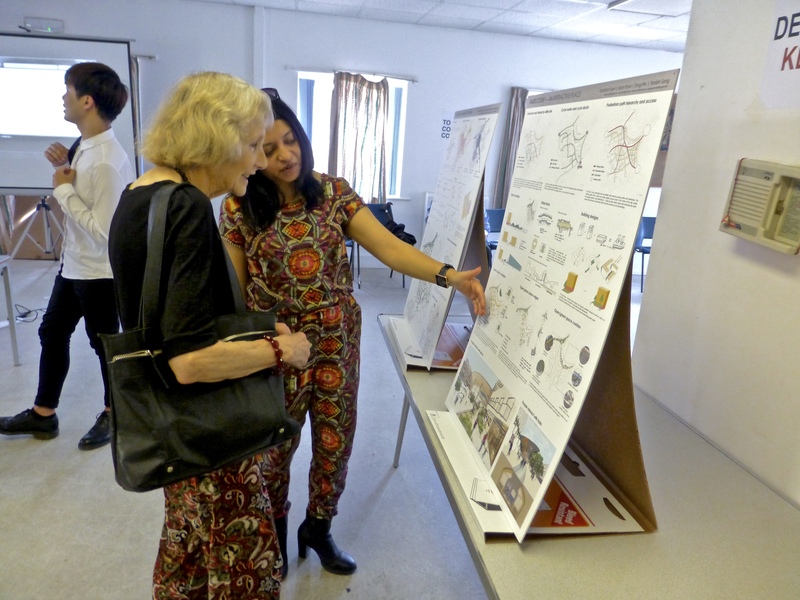 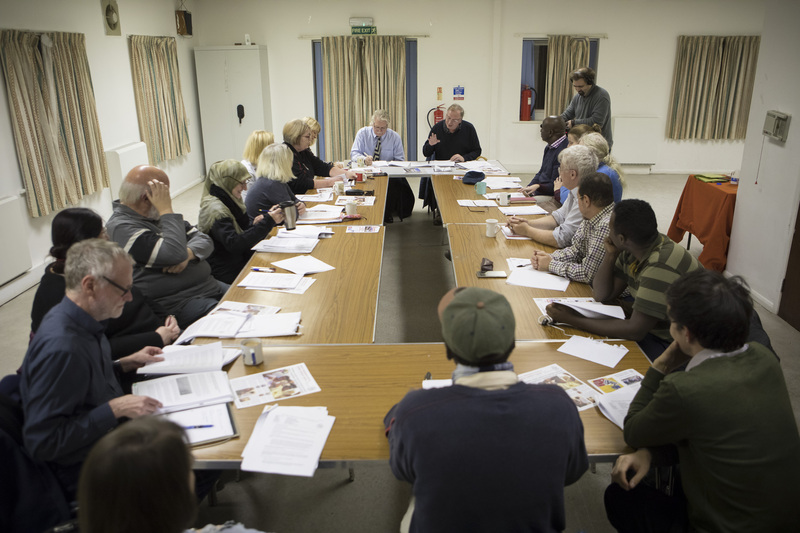 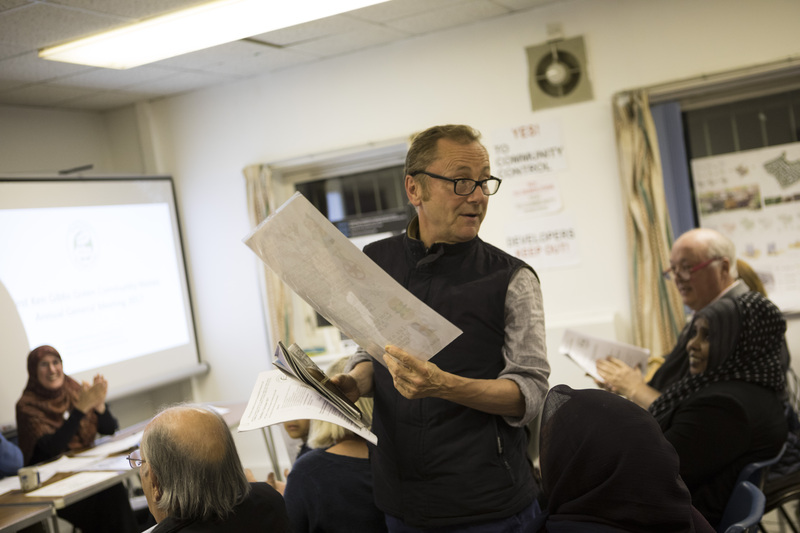 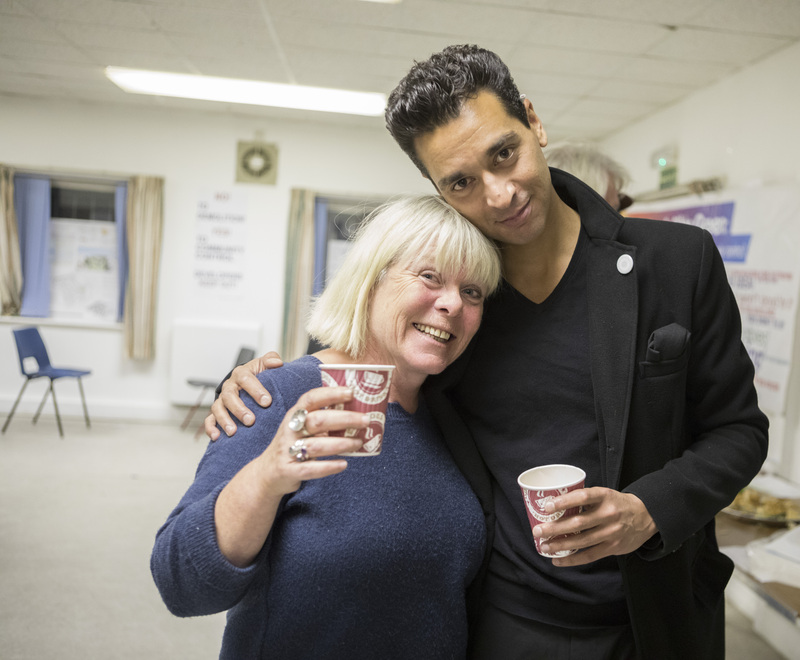 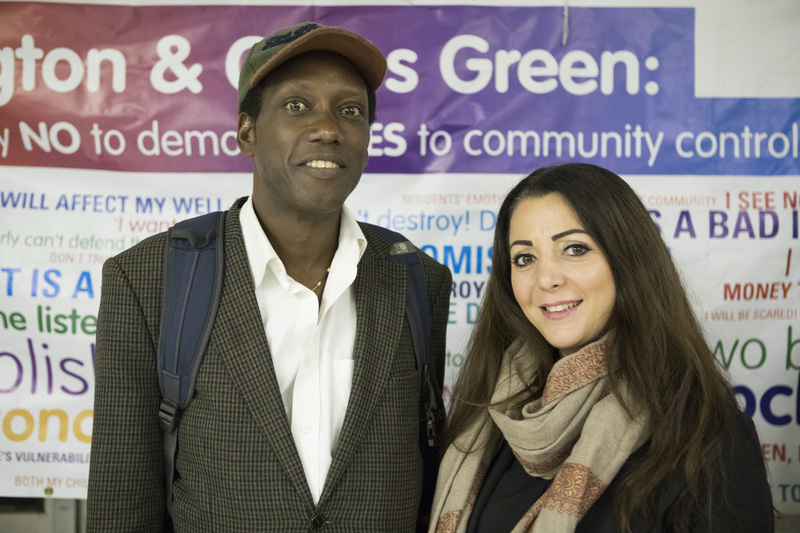 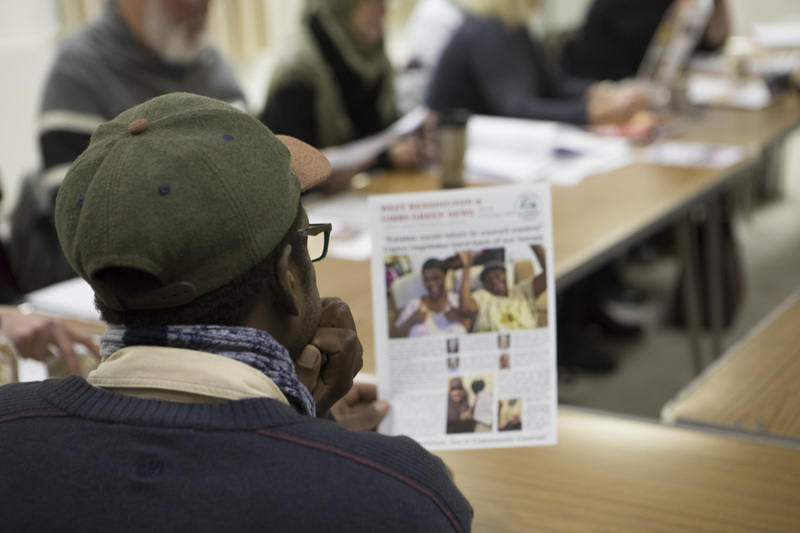 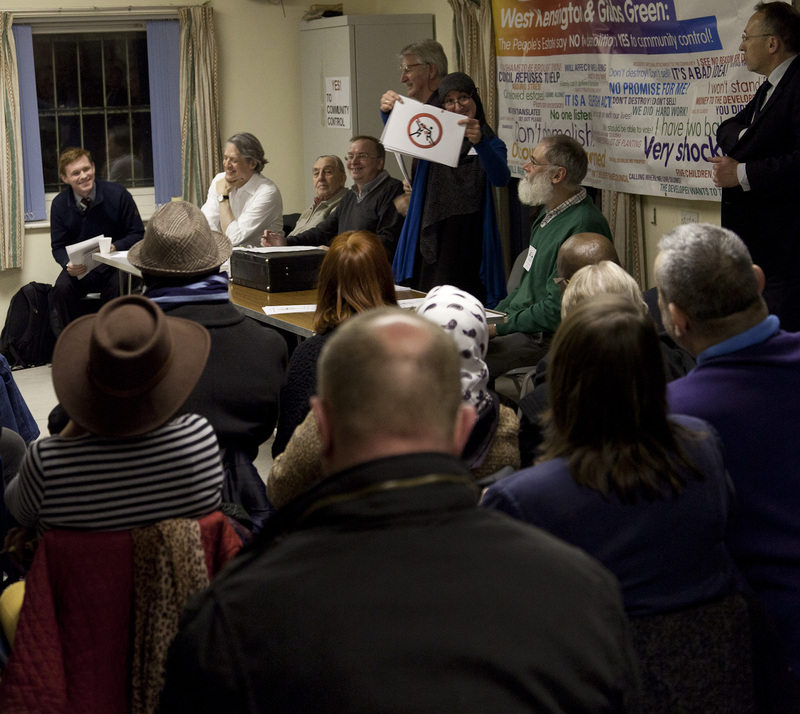 8 October 2013: Residents attend the Annual General Meeting of West Ken Gibbs Green Community Homes. 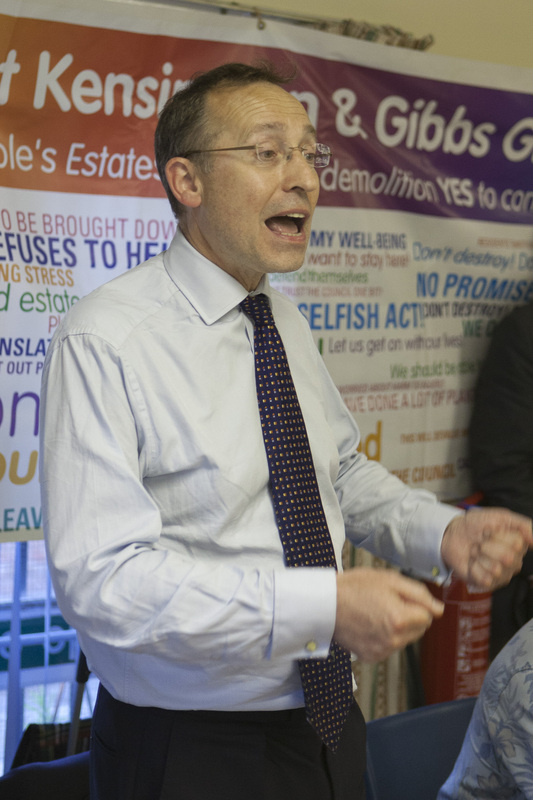 20 August 2013: Andy Slaughter MP addresses residents at Movie Night before the screening of Ladies Who Do (1963), a classic British comedy in which a little community blocks the bulldozers, defeats a greedy developer, and takes ownership of its neighbourhood. 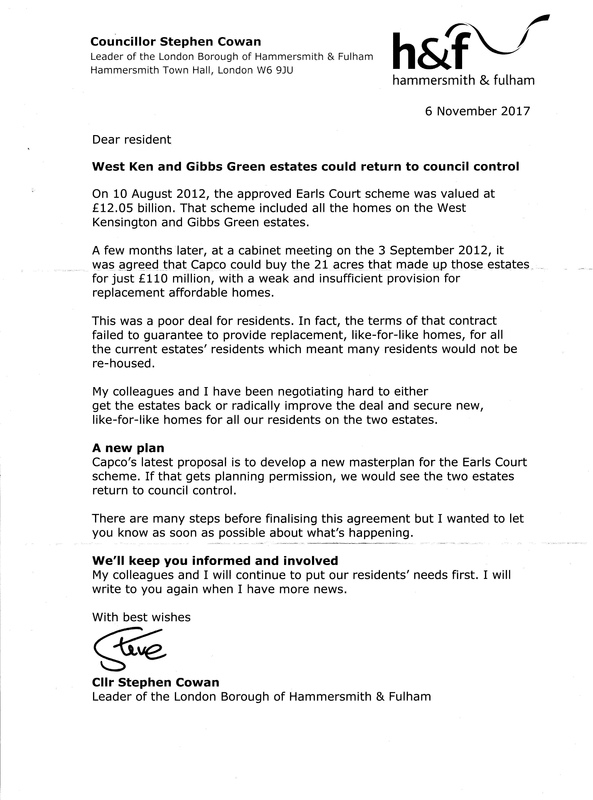 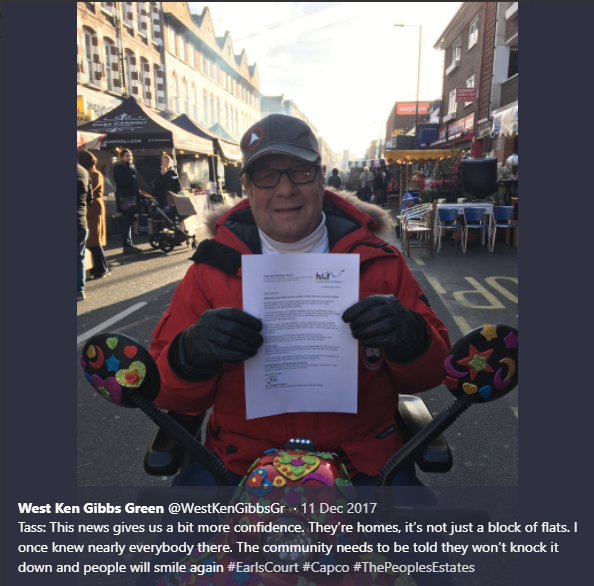 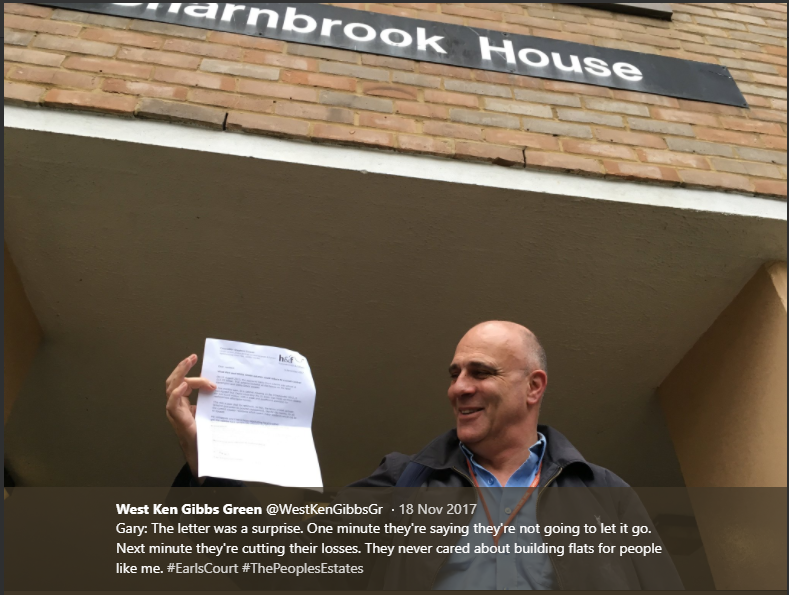 24 July 2013: Andy Slaughter MP hands in letters from him and the three West Ken & Gibbs Green residents associations to an official from the Department of Communities & Local Government asking the Secretary of State, Eric Pickles MP, to call in the Earl’s Court scheme for a public inquiry. 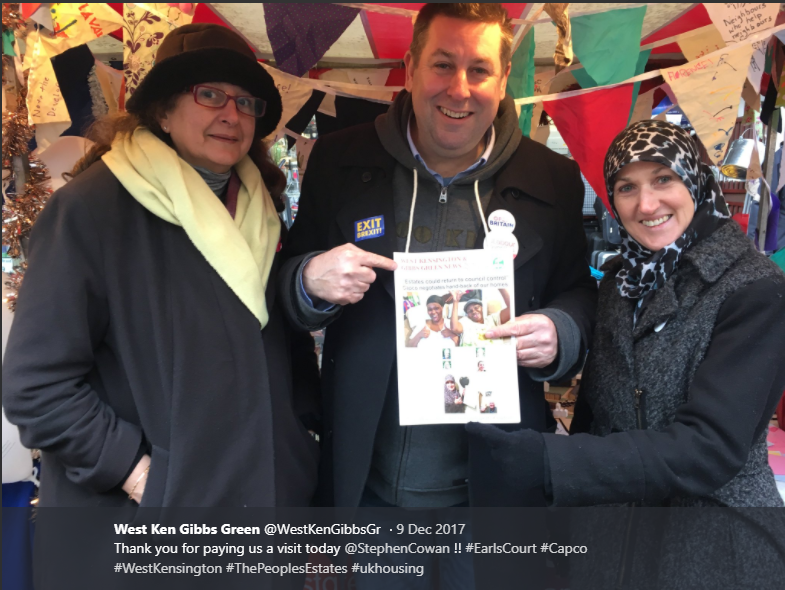 Left to Right, Andy Slaughter MP, Keith Drew, Chair of West Ken & Gibbs Green Community Homes, Daryl Brown, Councillor for North End Ward, DCLG official. 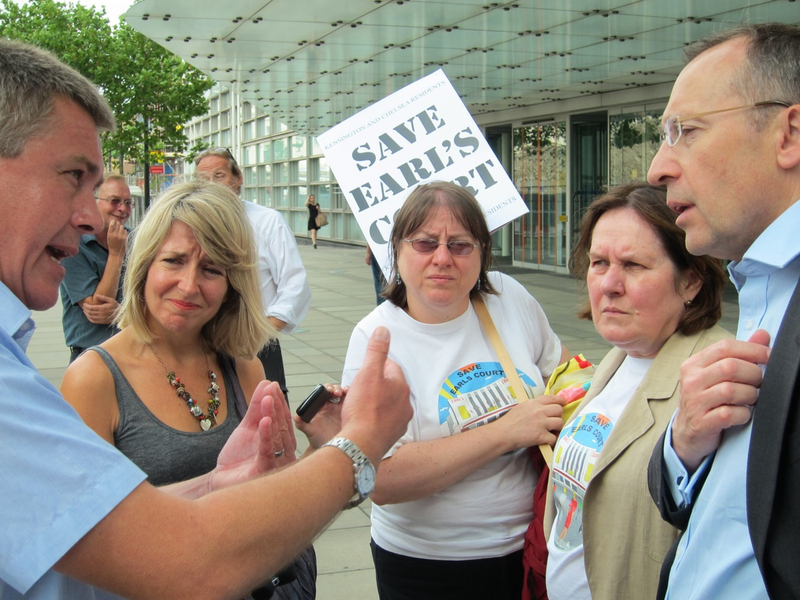 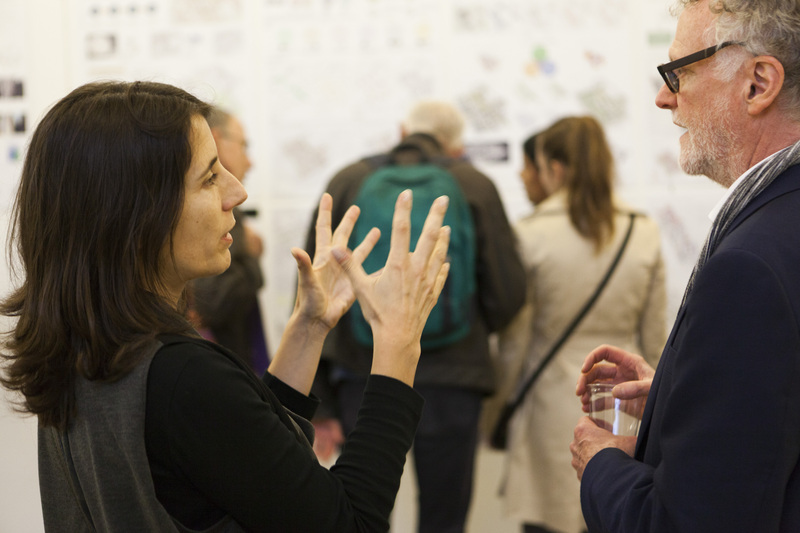 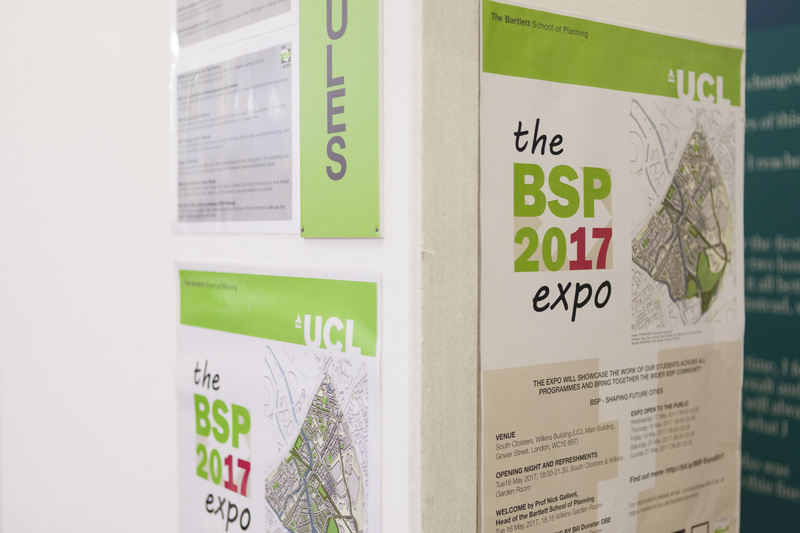 The Big Society: DCLG official explains to Andy Slaughter MP how the fate of Earl’s Court will be decided by the central state. 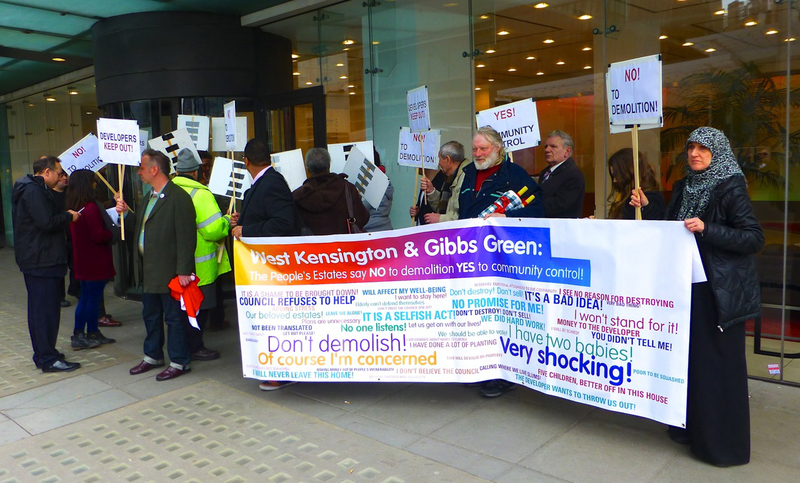 Andy Slaughter MP and Keith Drew, Chair of West Ken Gibbs Green Community Homes, emerge from CapCo’s offices in Mayfair after Director Gary Yardley refused to come down. 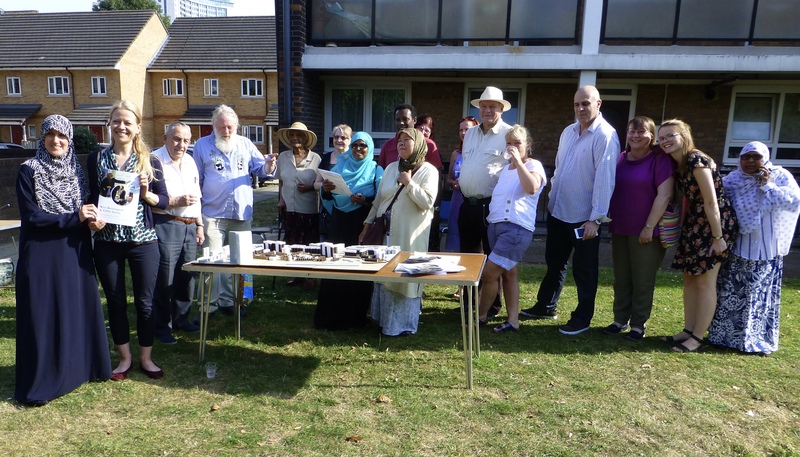 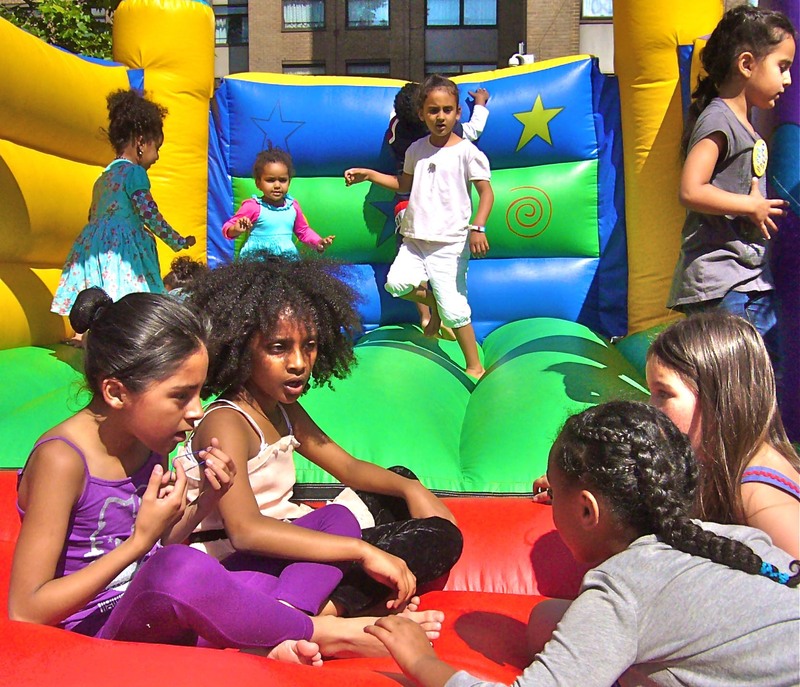 Residents put on the boxing gloves at their Summer Festival 2011. 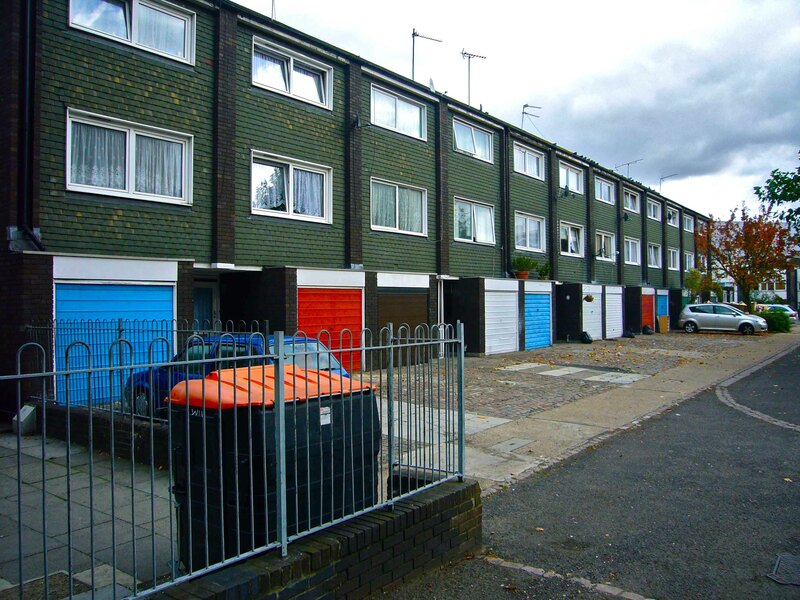 Aisgill Avenue, part of the West Kensington estate. 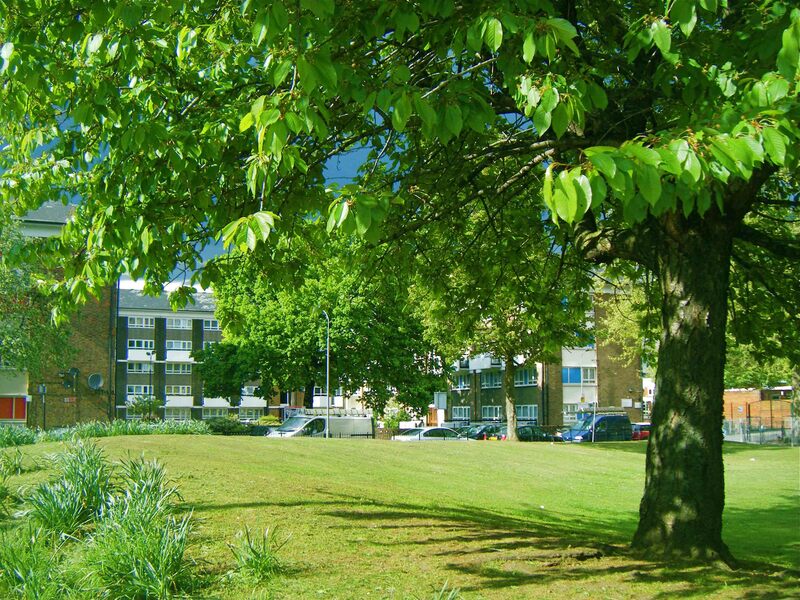 Dieppe Close – ‘lifetime homes’ with gardens and off-street parking, just 10 years old. 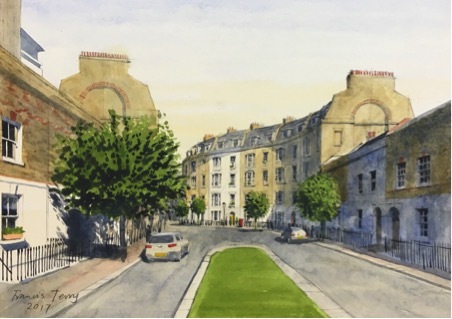 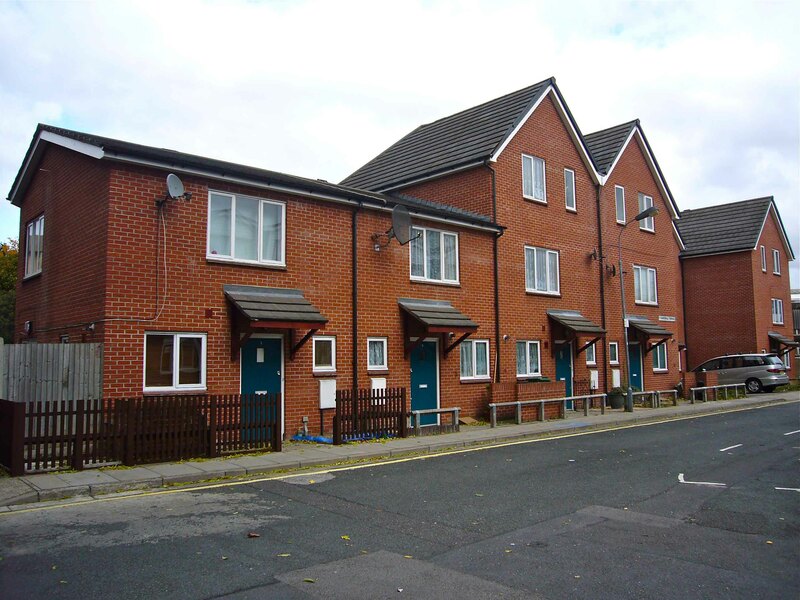 Garsdale Terrace – more ‘lifetime homes’ with gardens and parking just 10 years old. 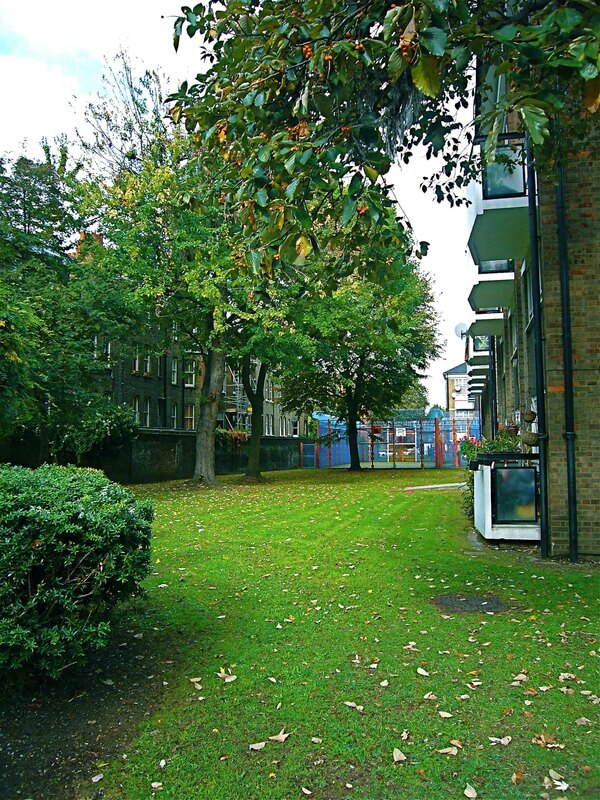 West Kensington estate with Empress State building in the background. 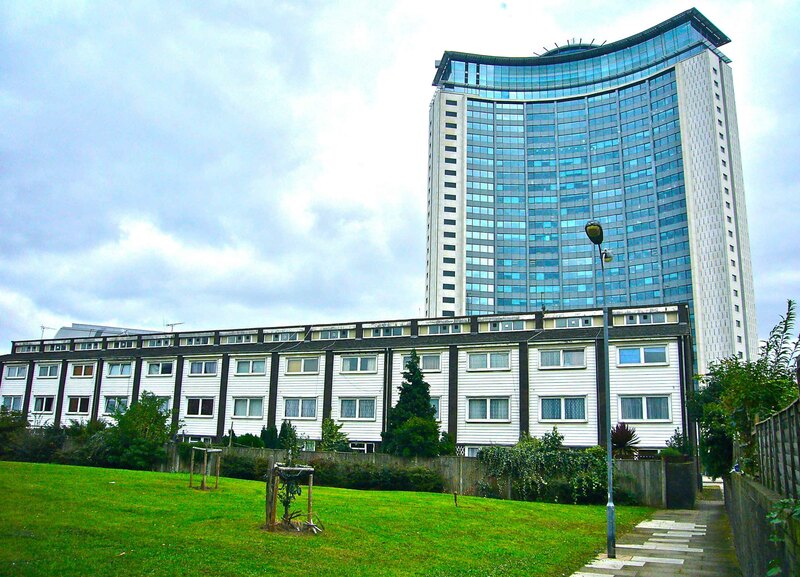 The Empress State Building dominates the southern end of the West Kensington Estate (Aisgill Avenue seen here). 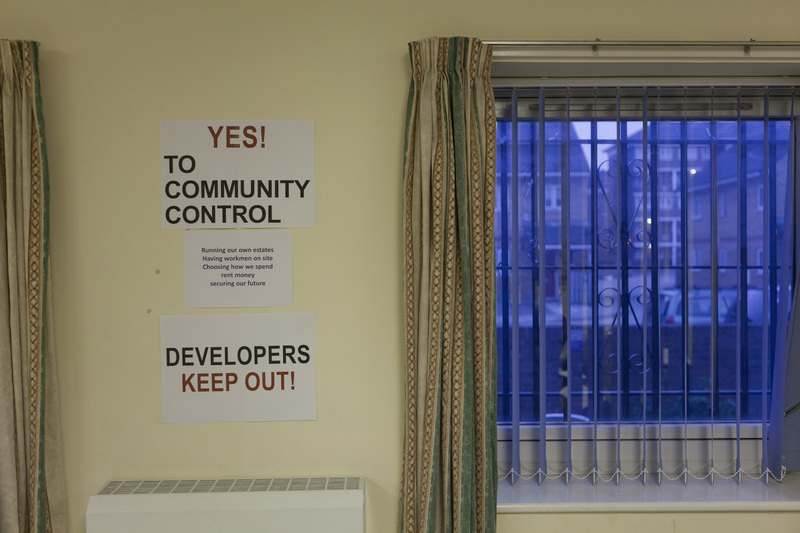 It is occupied entirely by the Metropolitan Police. 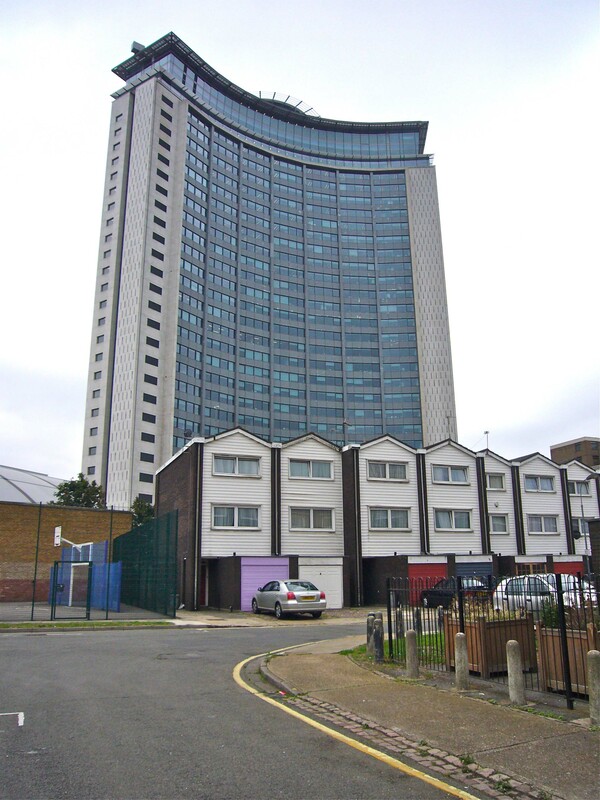 It was completed in 1961. 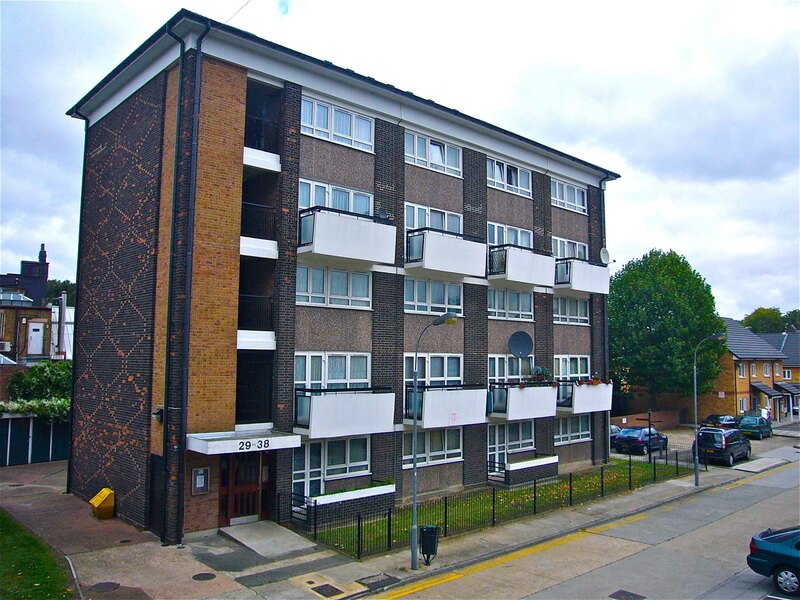 A few years ago it was refurbished with the addition of a couple more storeys. 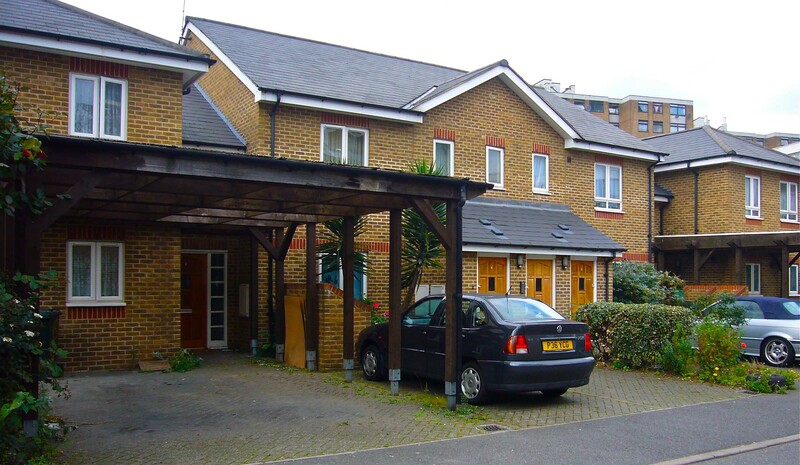 Lerry Close, West Kensington estate: Lifetime homes recently built. 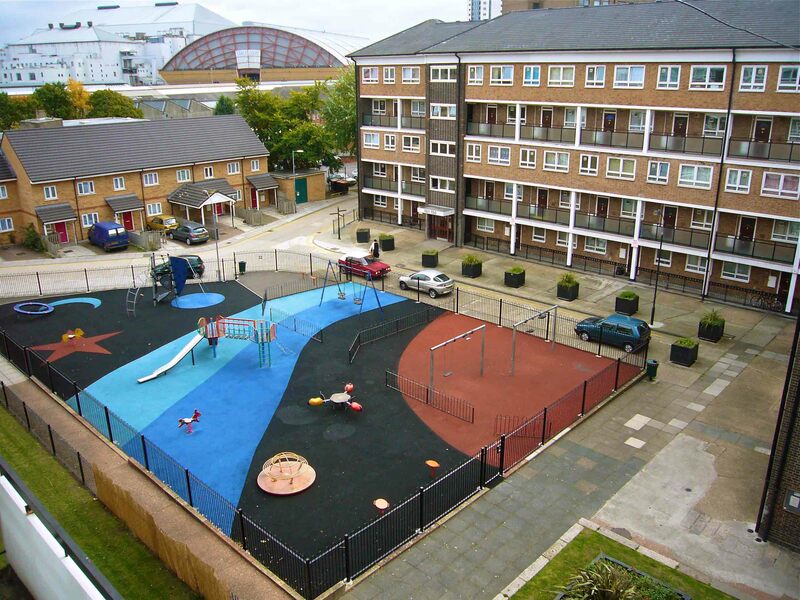 Franklin Square, West Kensington Estate. 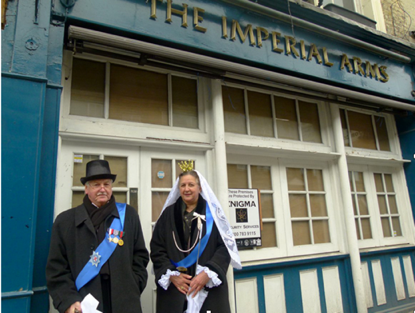 The Empress State building occupies the site where epic sea battles were re-enacted in an enormous water tank before the days of visual and audio media. 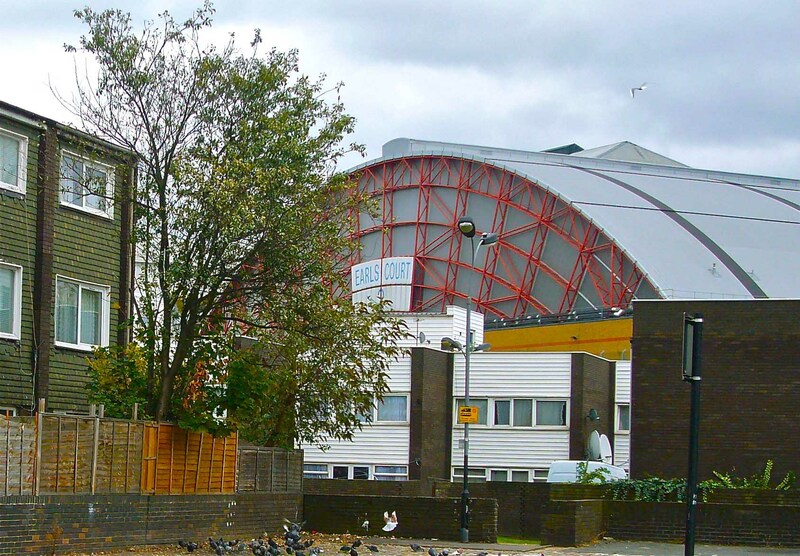 Earl’s Court 2 behind the West Kensington Estate. 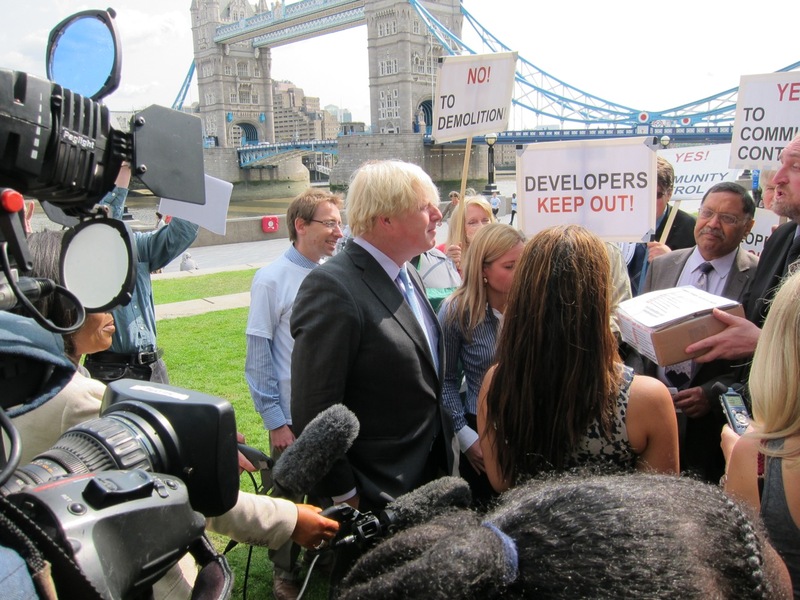 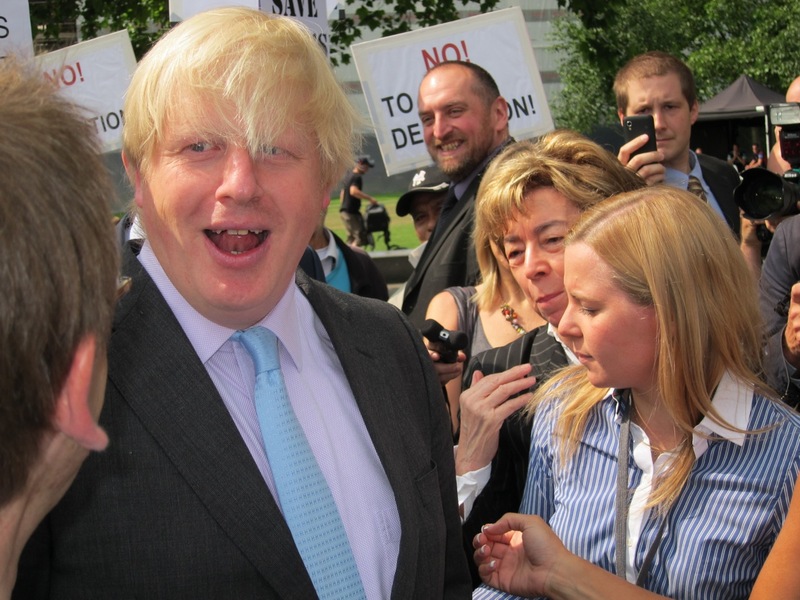 WKGGCH resident Board member Rita Vlahopoulou greets Boris Johnson in October 2011, outside Olympia. 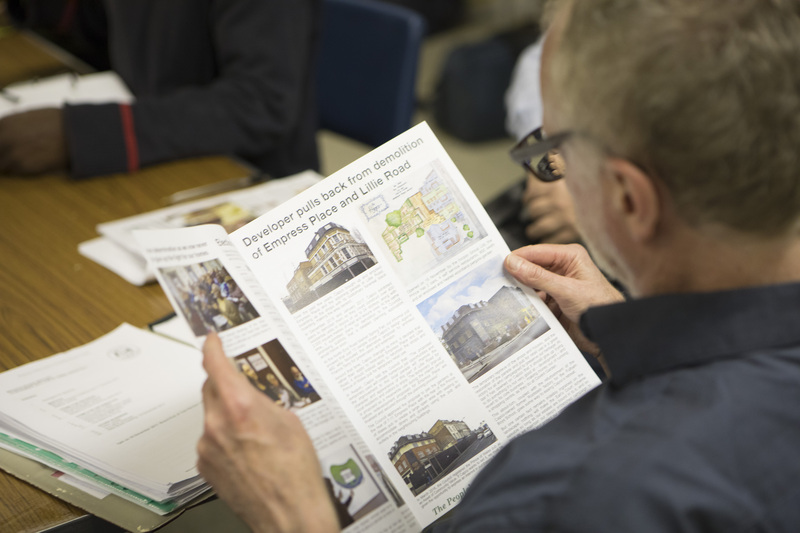 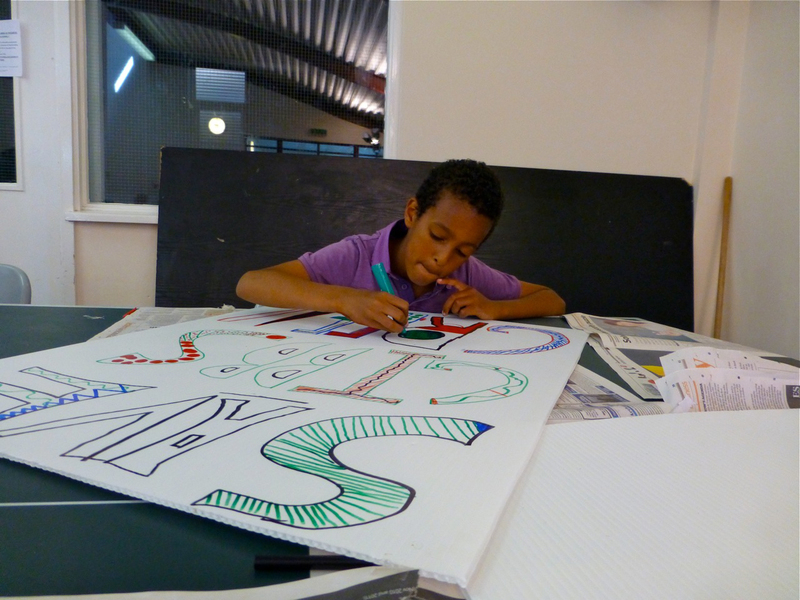 For more on this story check out our December 2011 newsletter here. 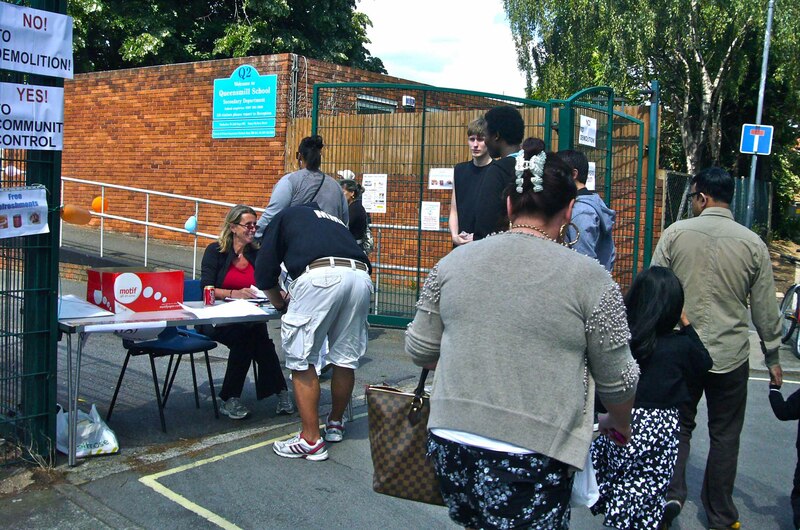 June 2011: Residents queue to join the Summer Festival. 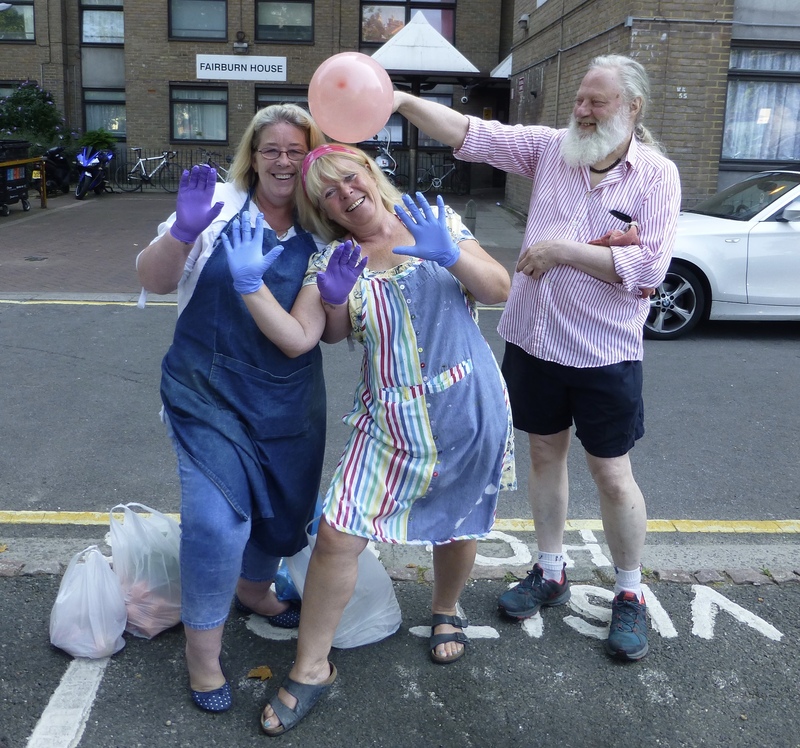 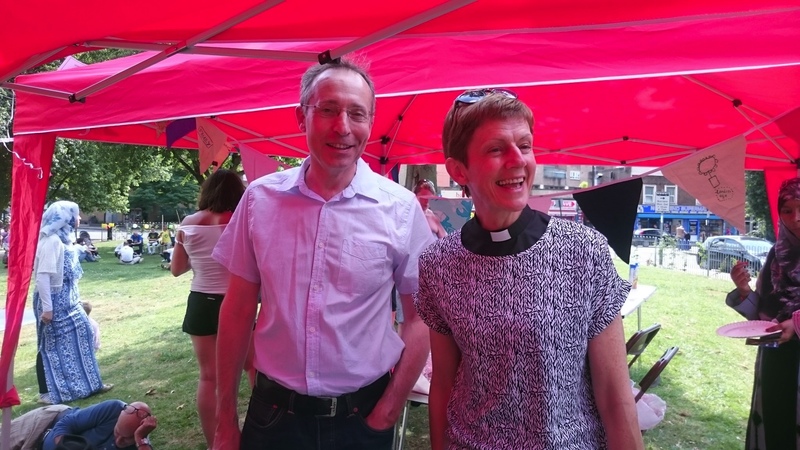 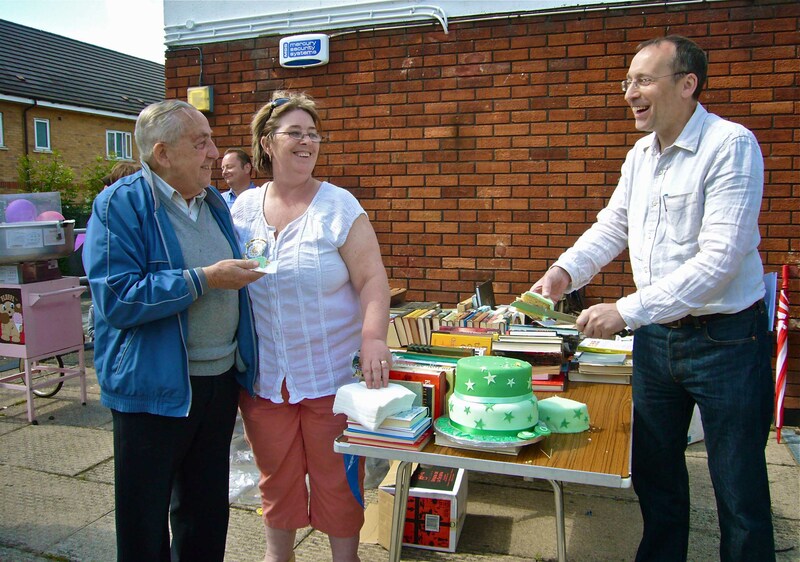 June 2011: Left to right; Charlie Treloggan (West Kensington Estate), Diana Belshaw (Gibbs Geen Estate) and Andy Slaughter MP prepare to cut the cake at the Community Summer Festival. 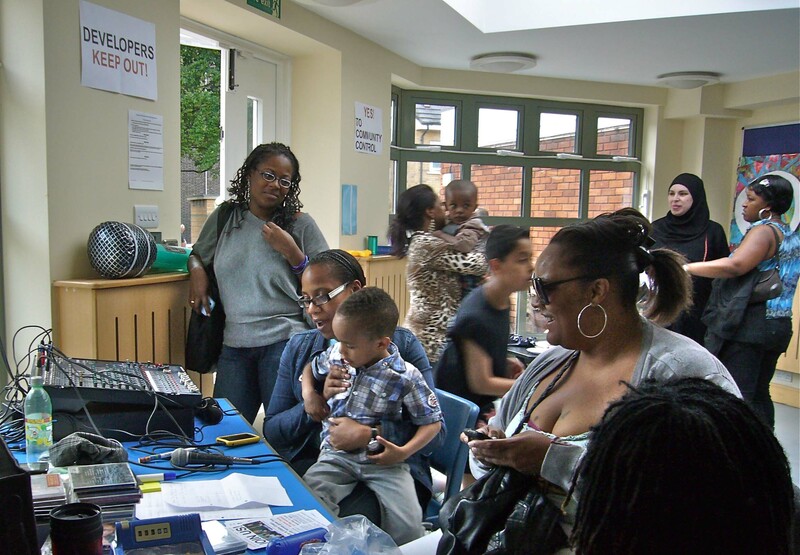 June 2011: Residents rock to the community vibe. 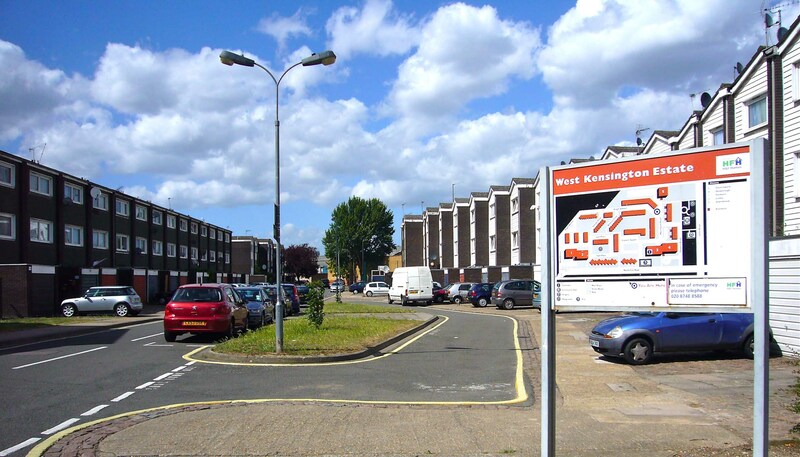 February 2012: West Kensington estate. 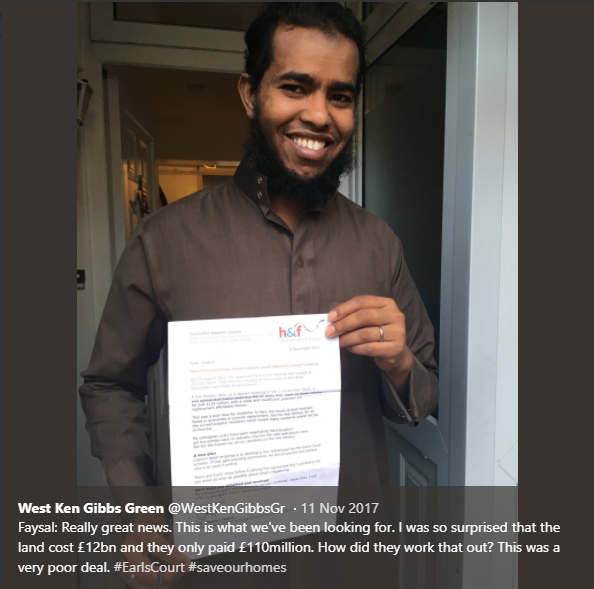 Everyone’s serving notices! 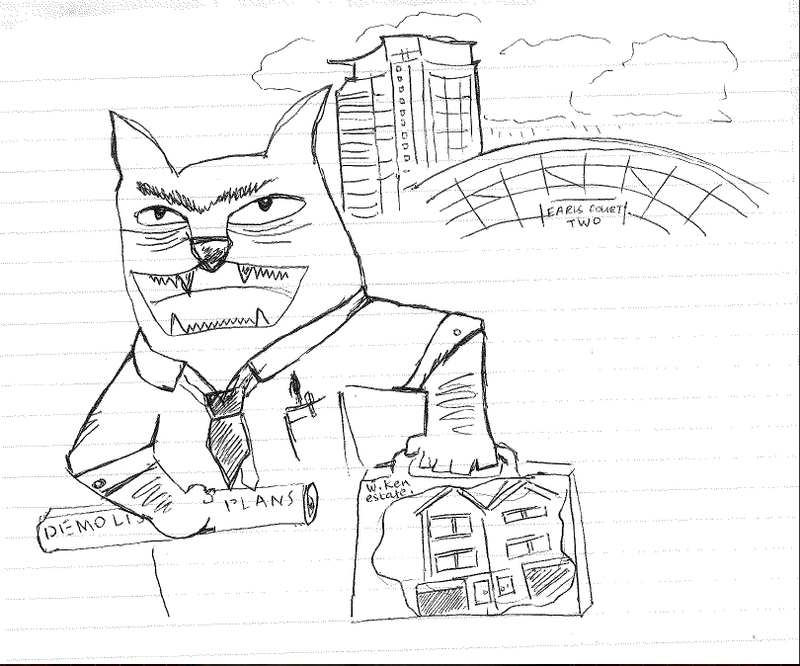 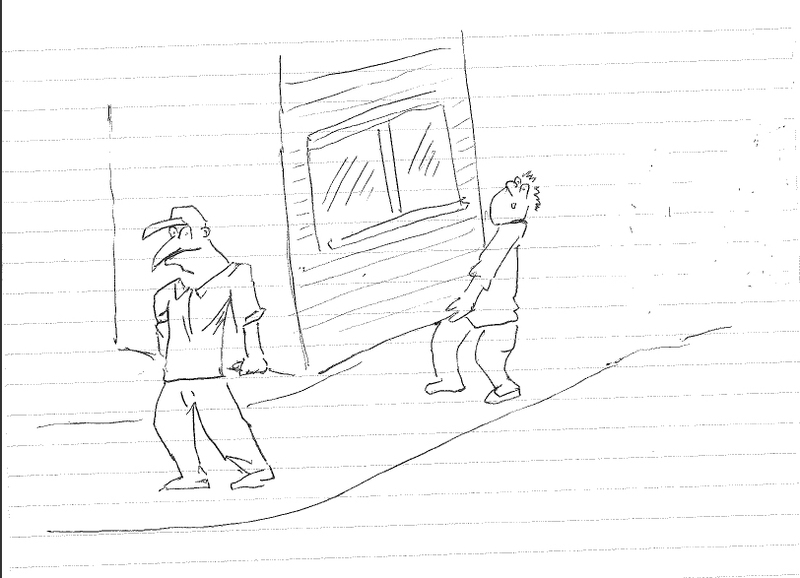 Here are 3 cartoons drawn by a 15 year old boy. 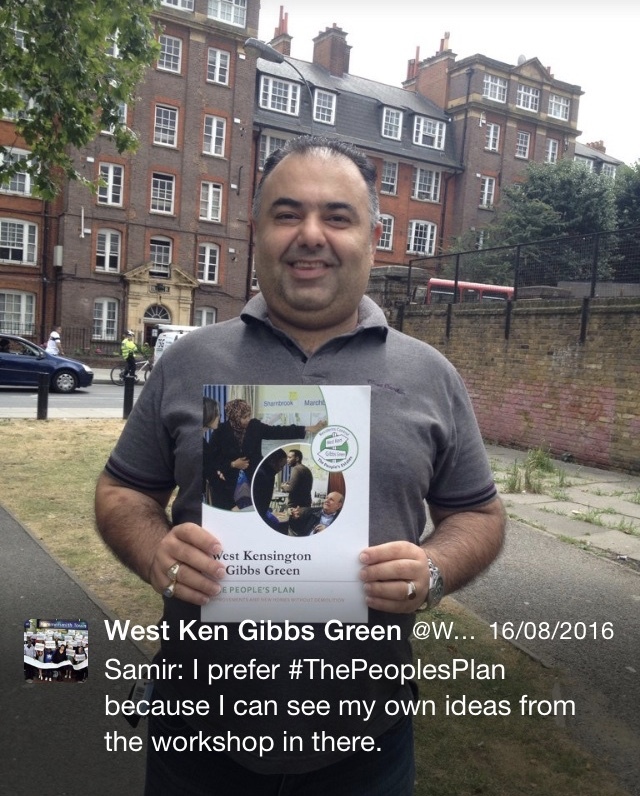 FIND OUT WHAT THE PEOPLE REALLY THINK!